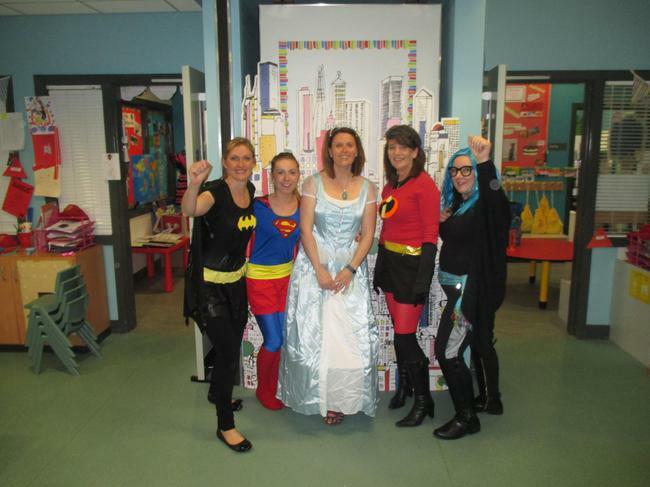 Meet the teachers and assistants!! 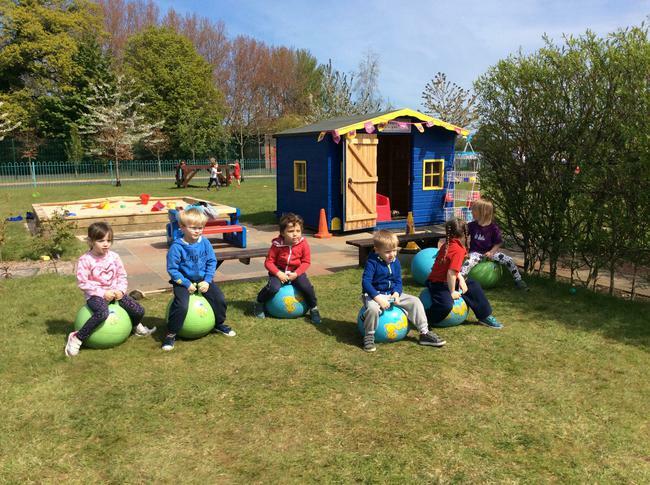 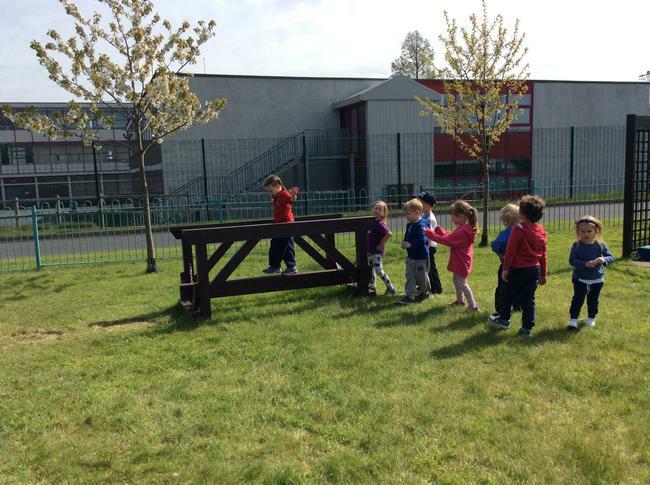 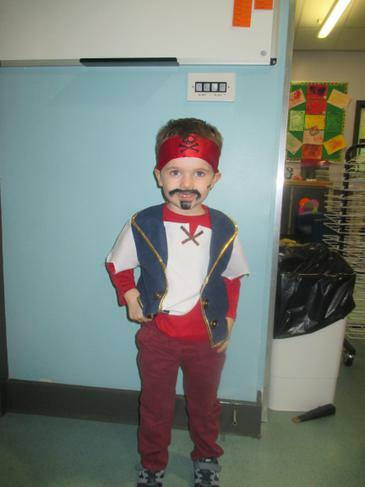 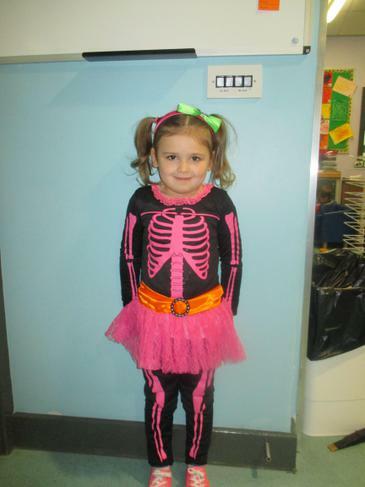 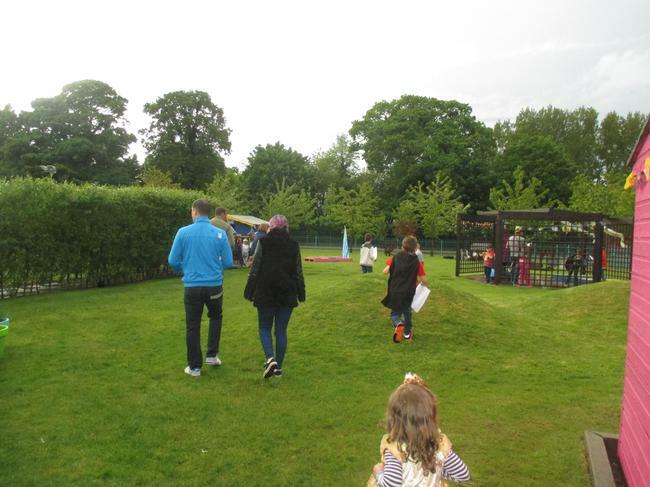 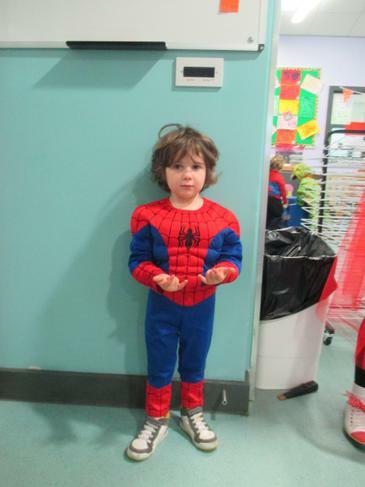 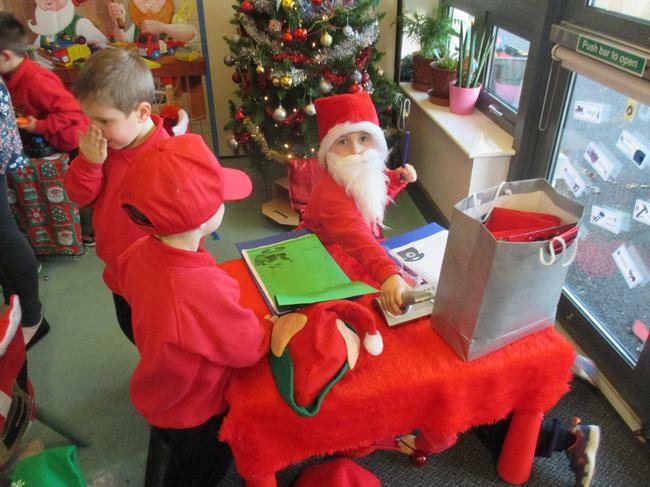 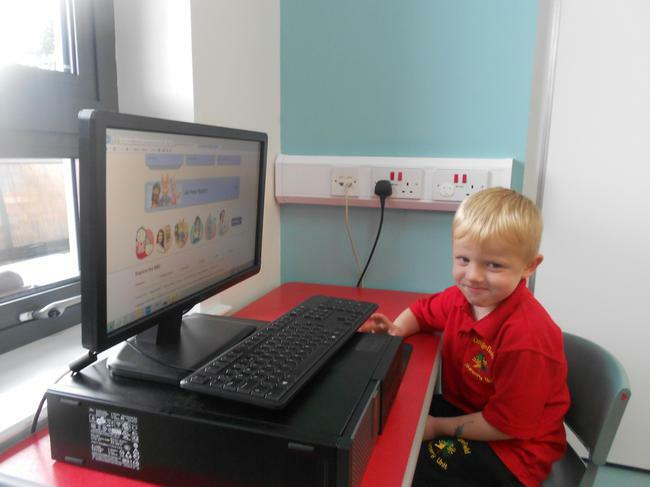 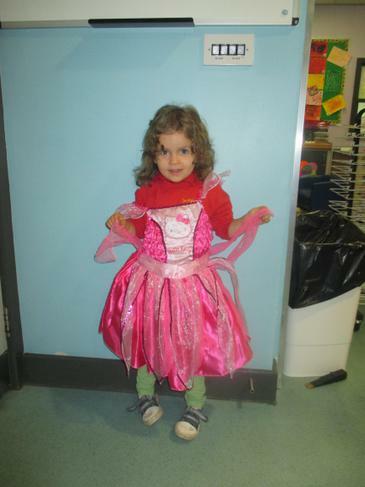 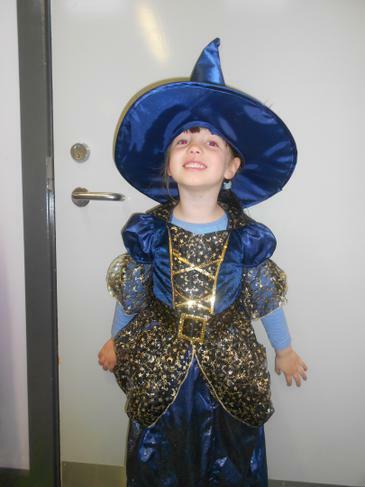 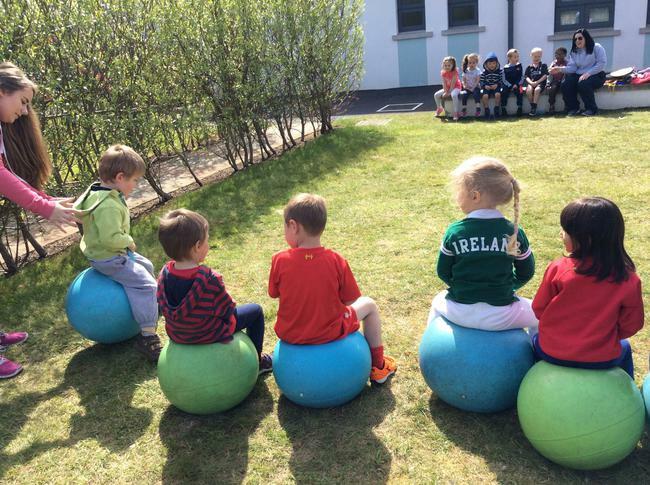 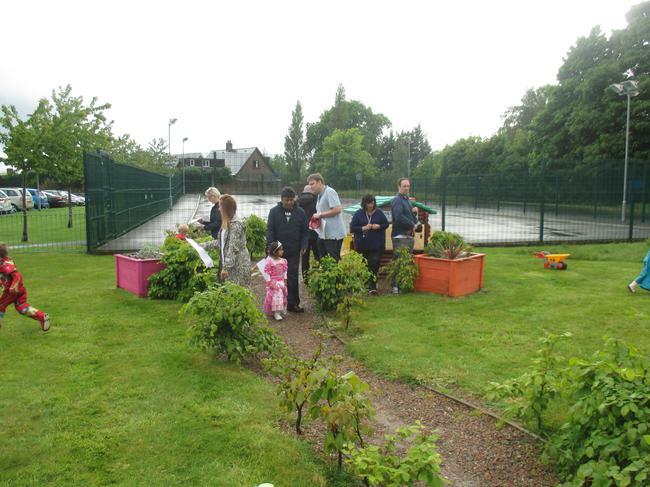 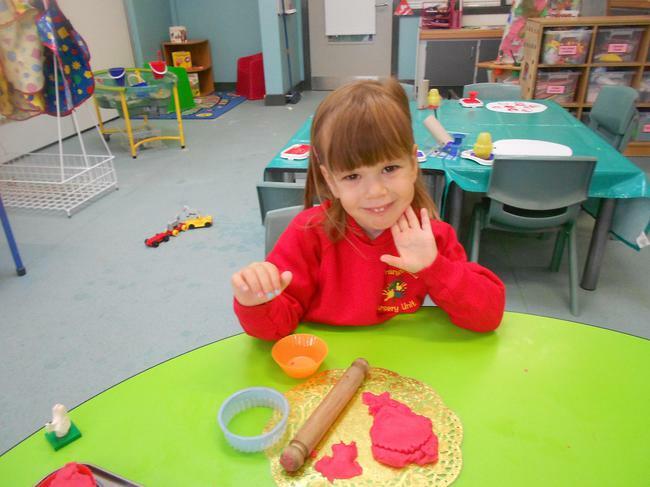 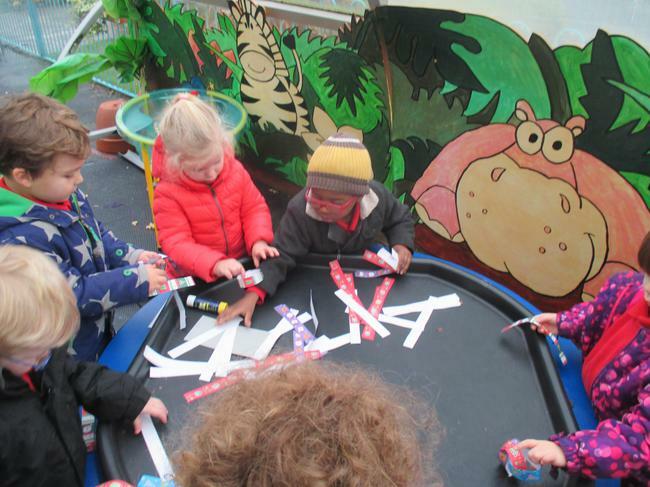 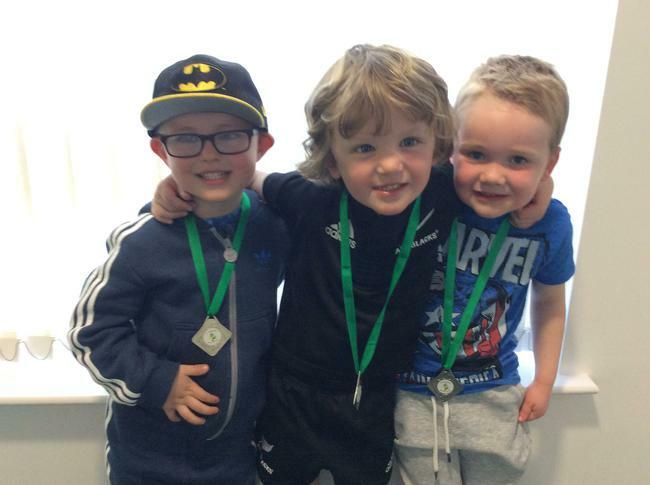 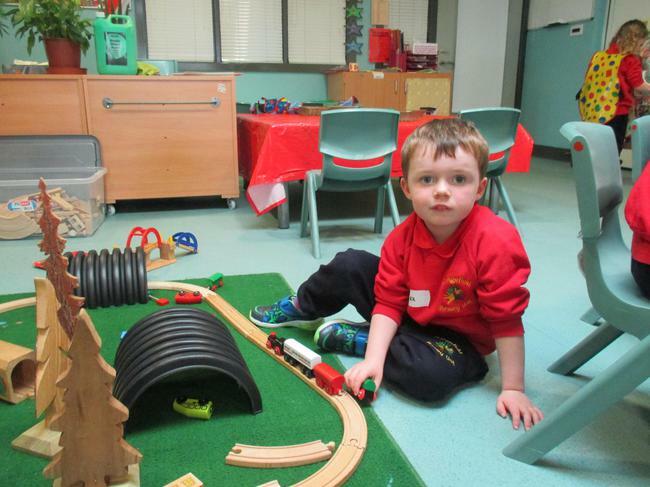 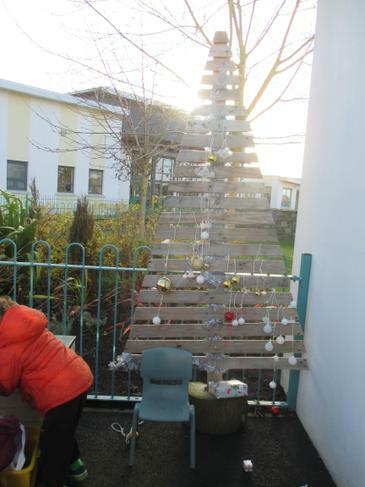 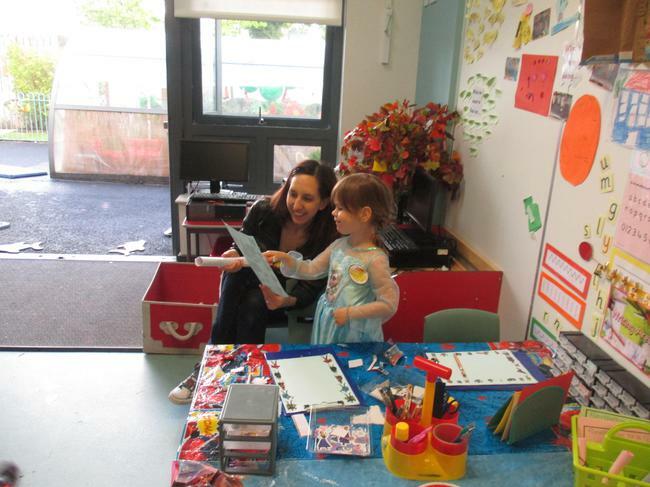 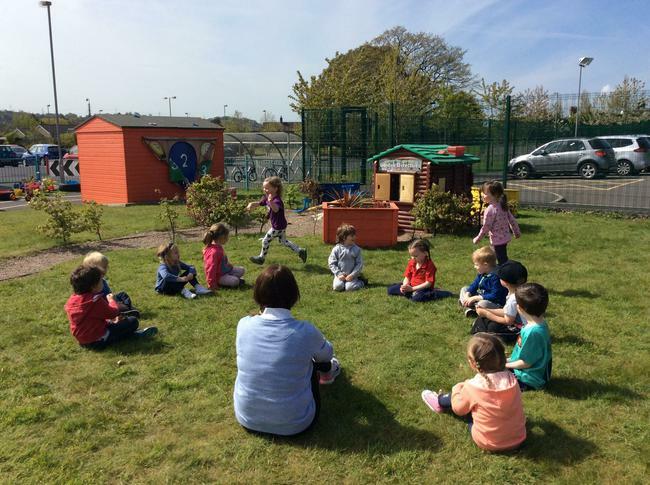 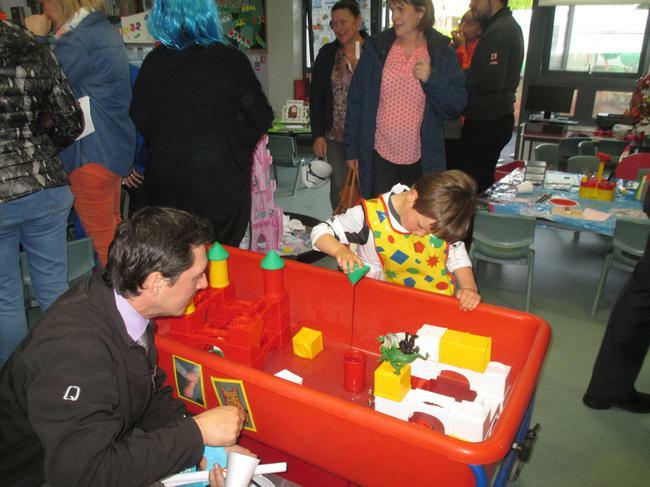 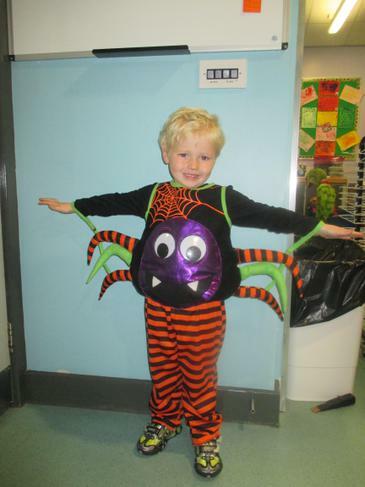 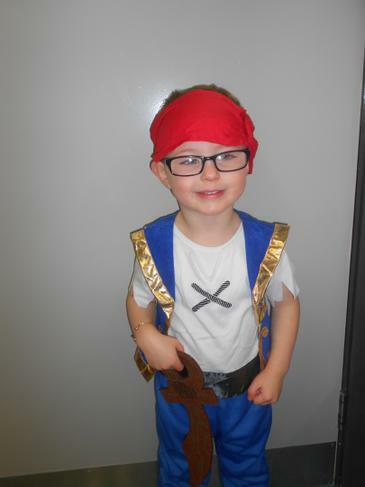 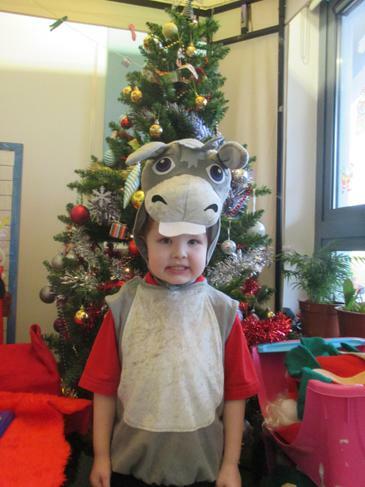 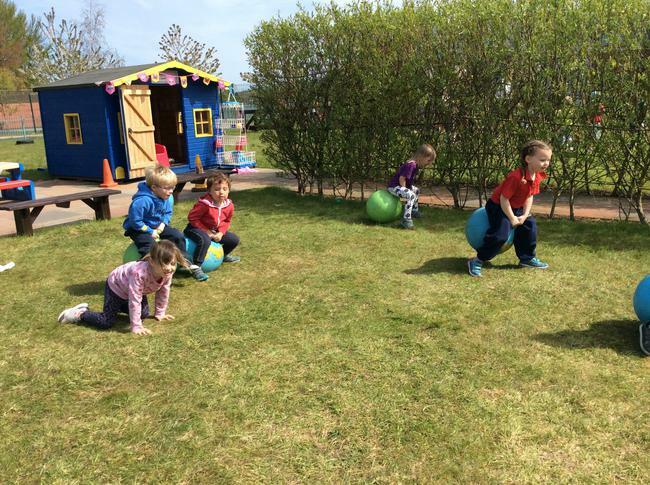 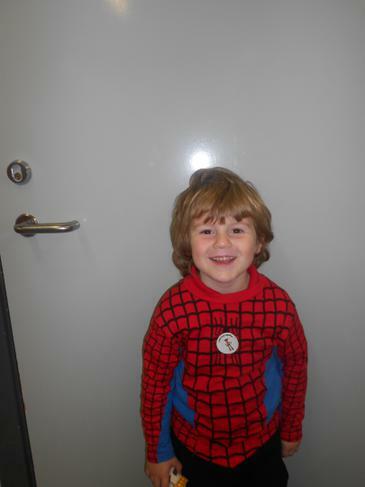 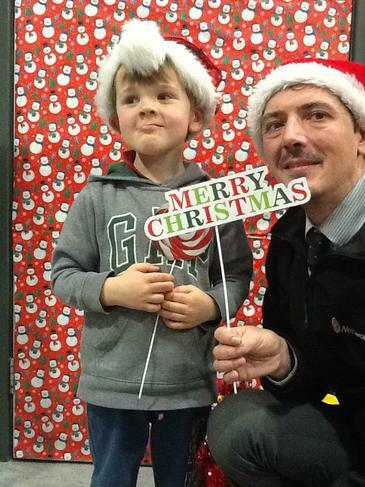 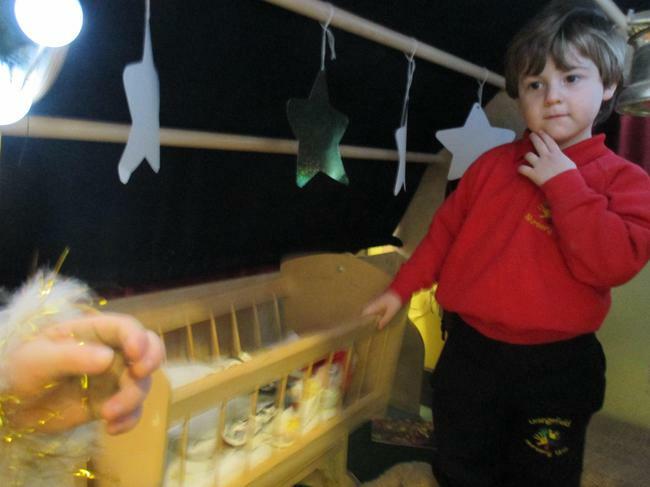 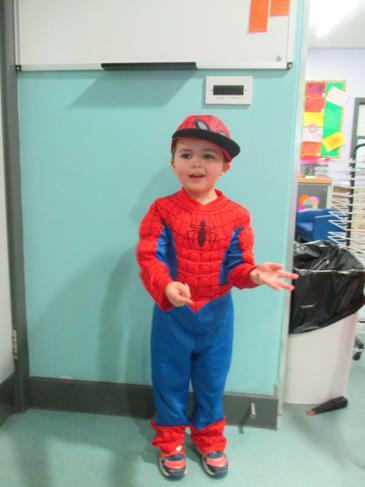 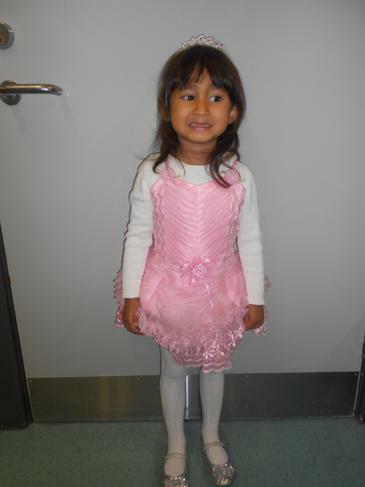 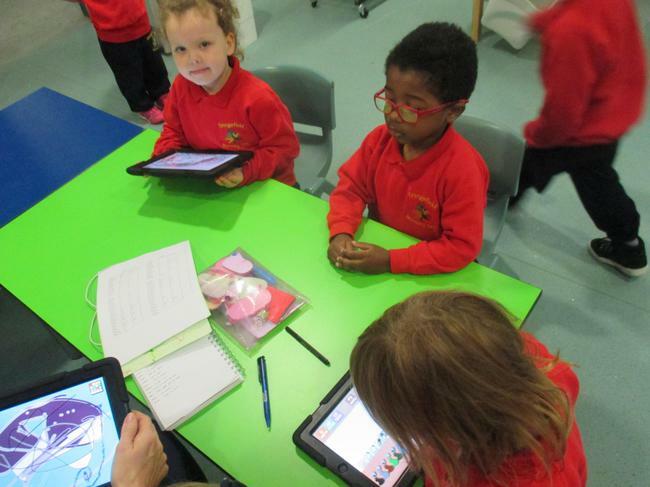 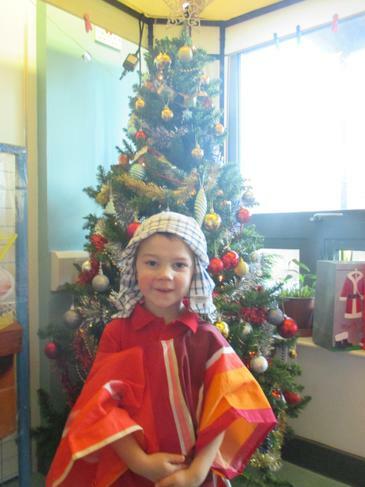 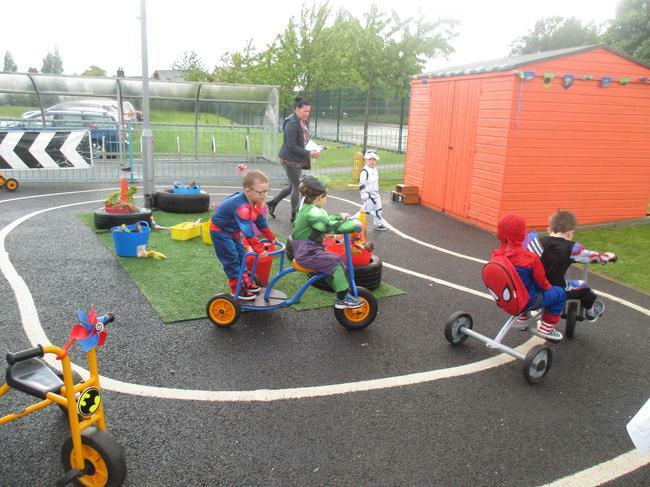 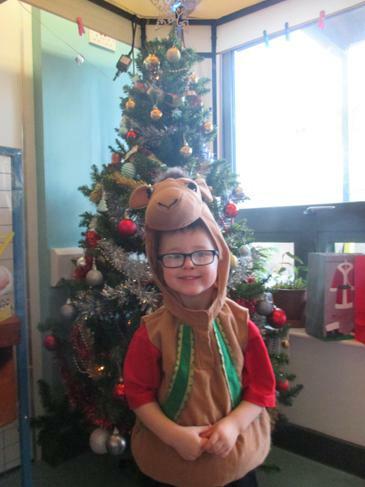 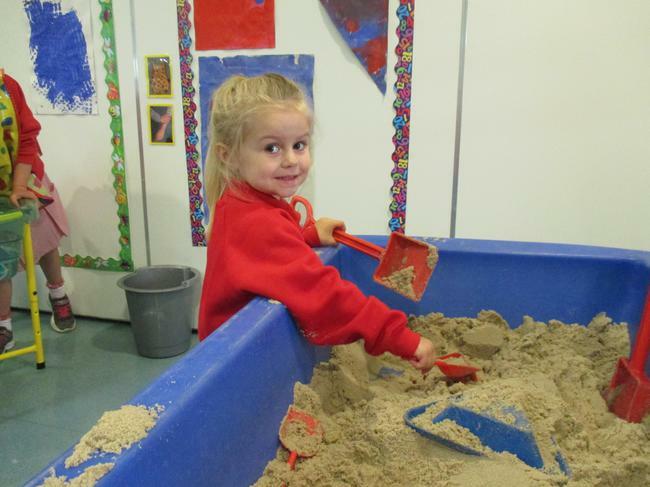 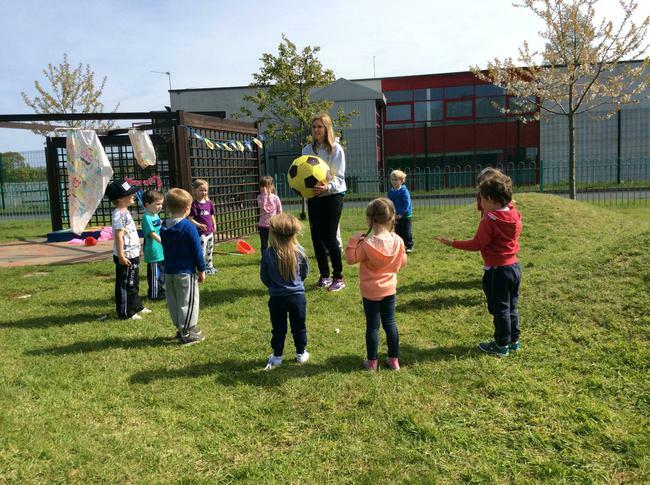 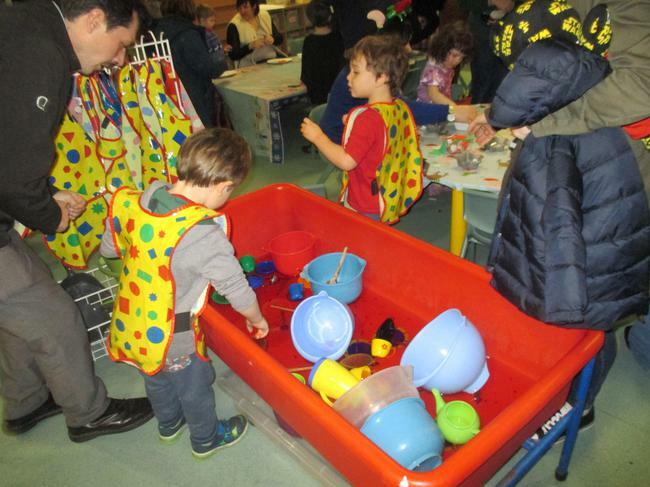 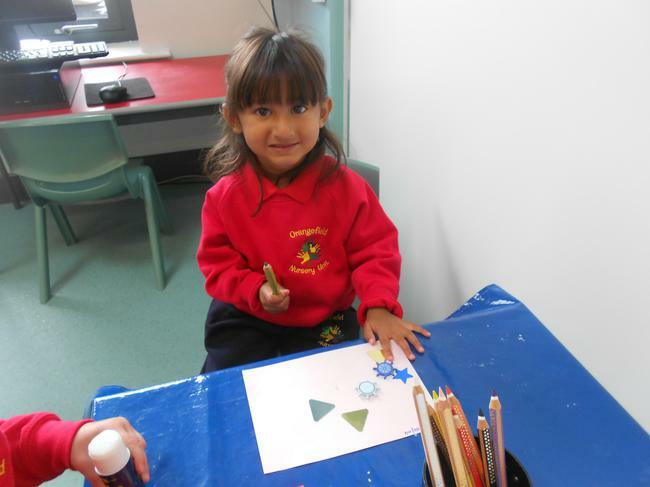 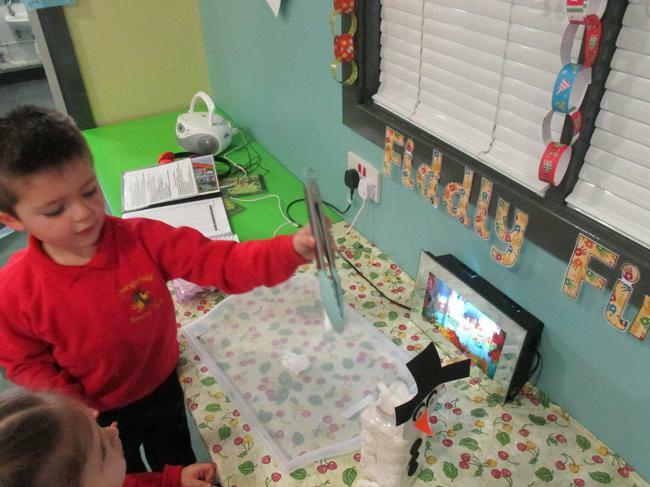 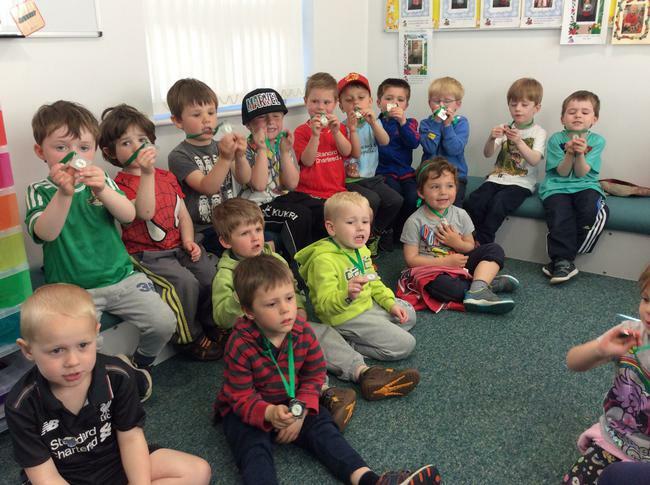 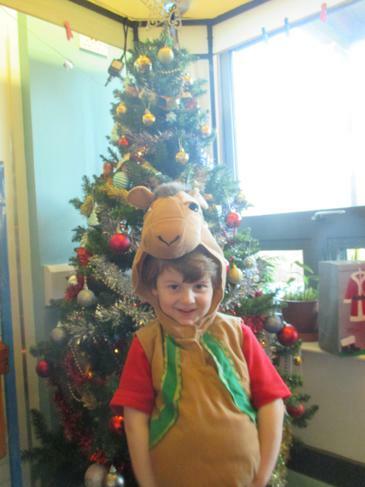 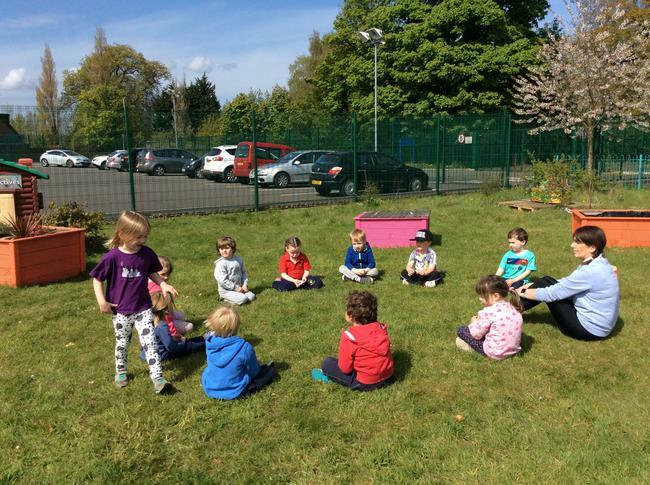 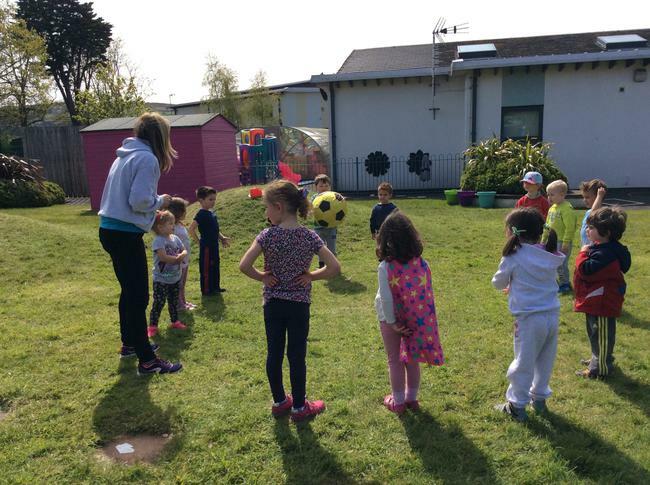 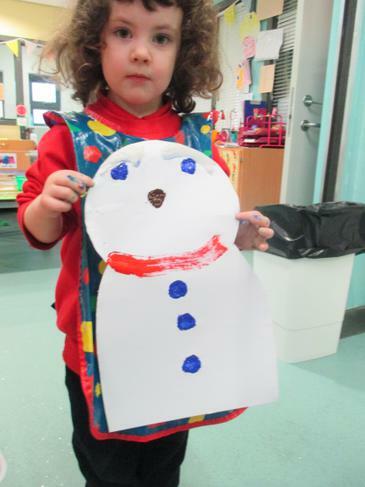 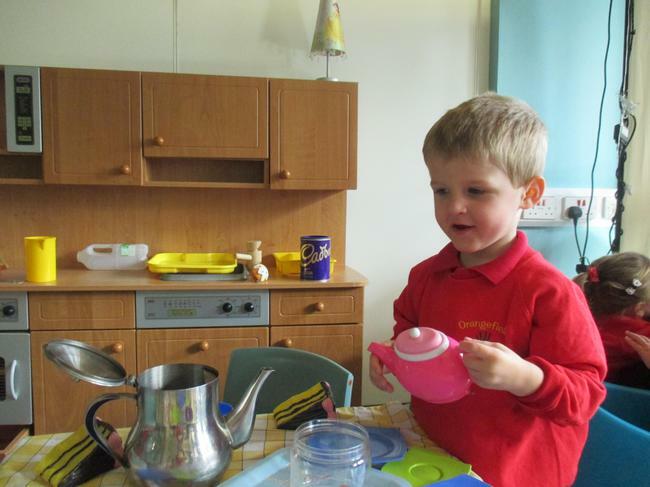 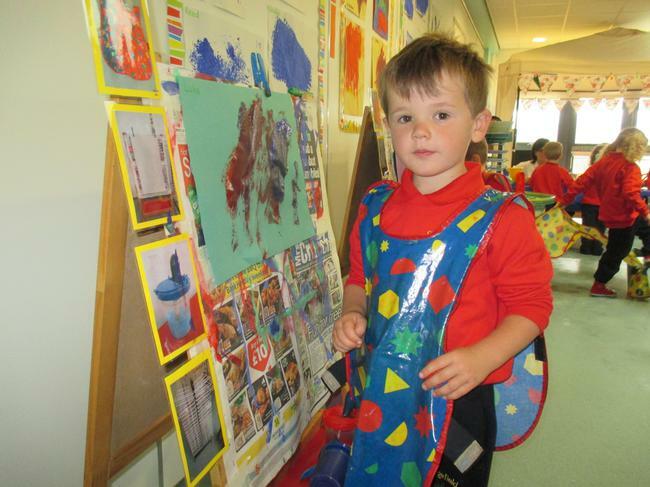 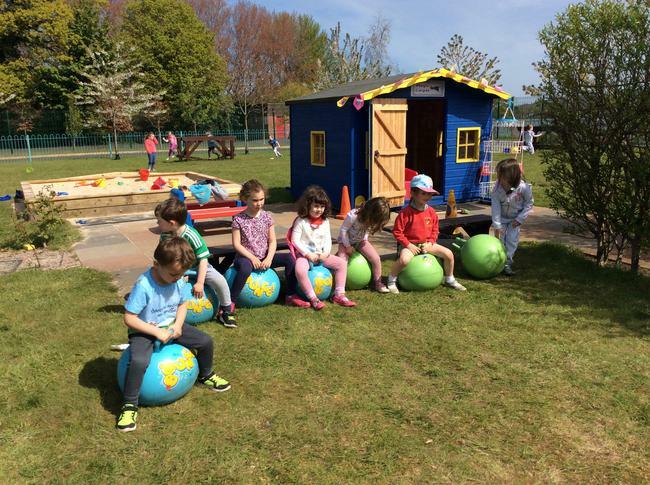 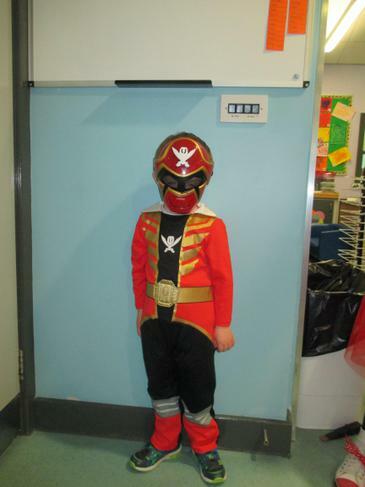 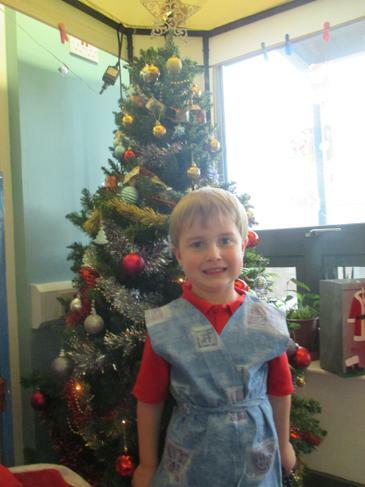 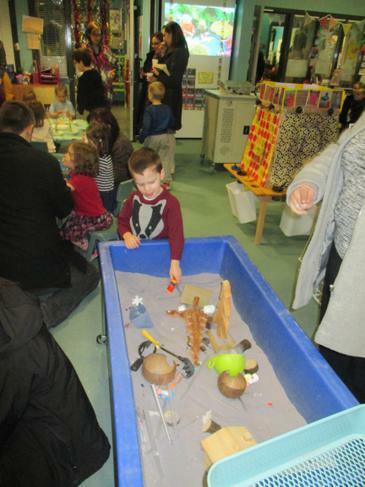 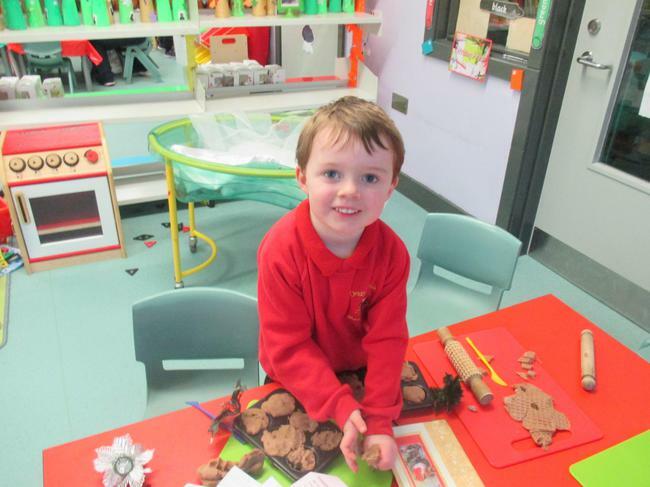 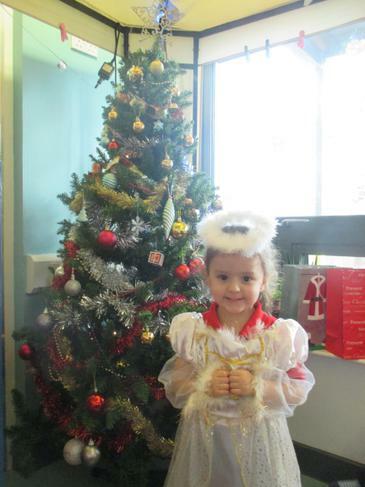 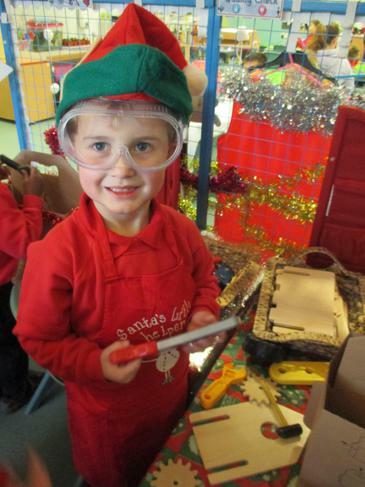 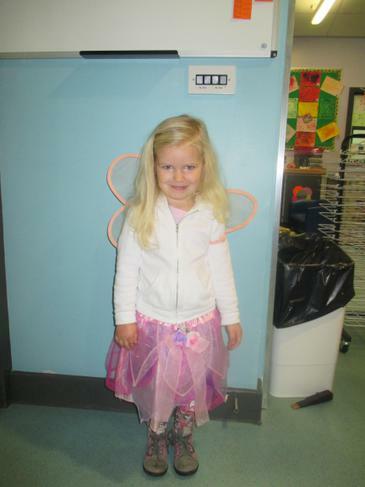 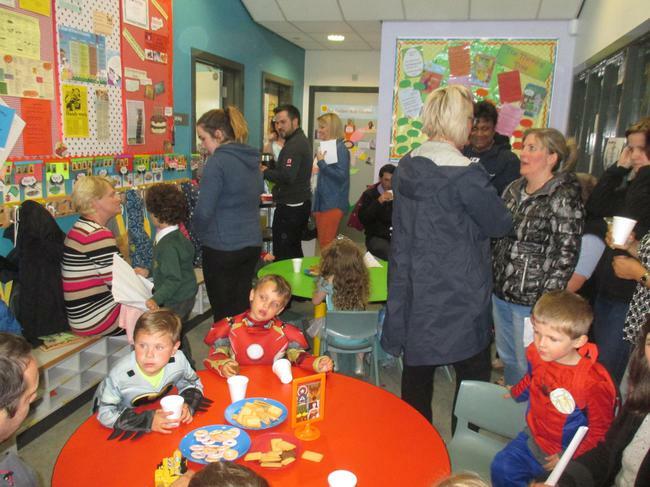 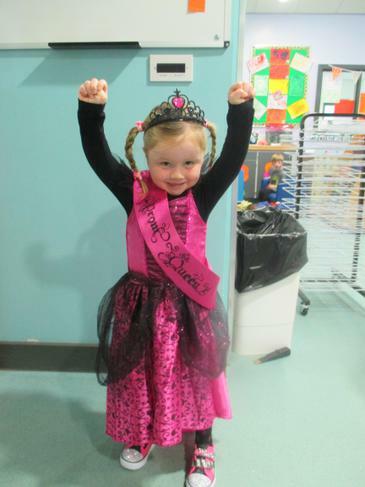 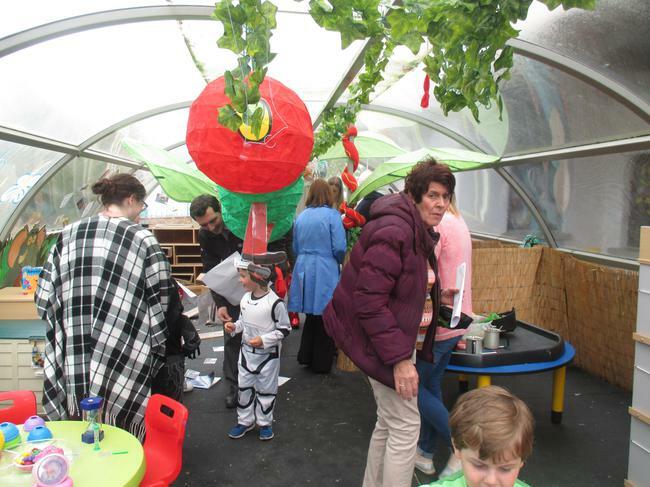 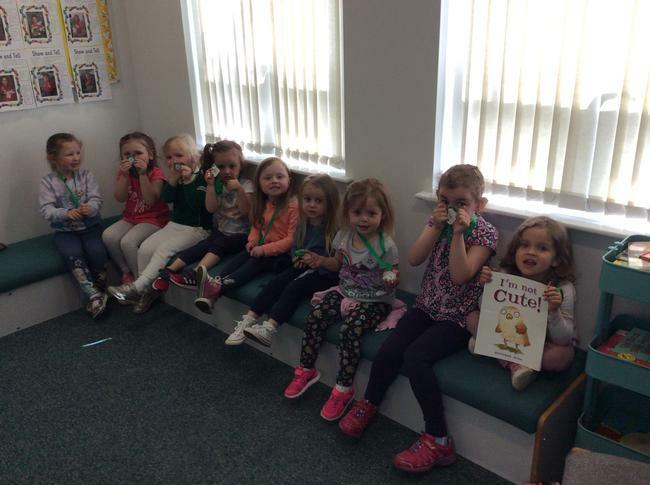 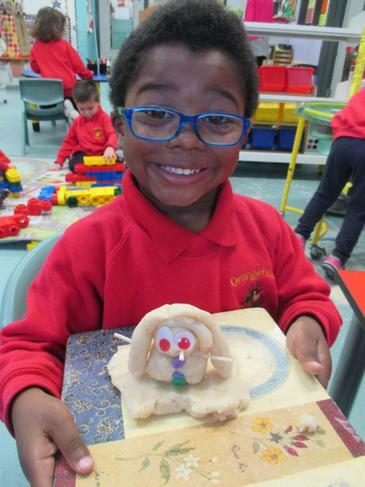 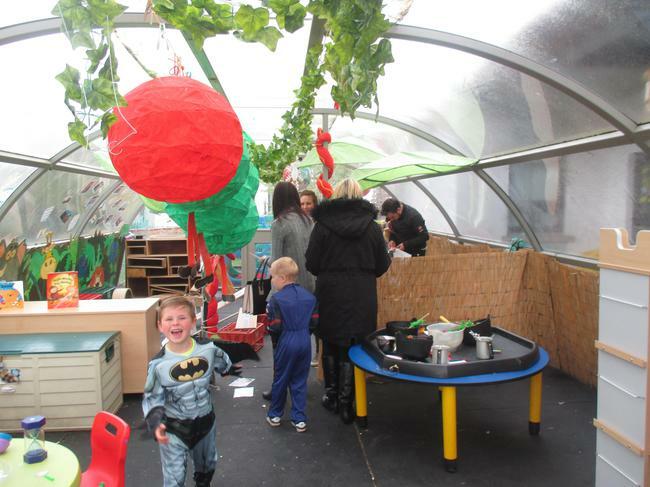 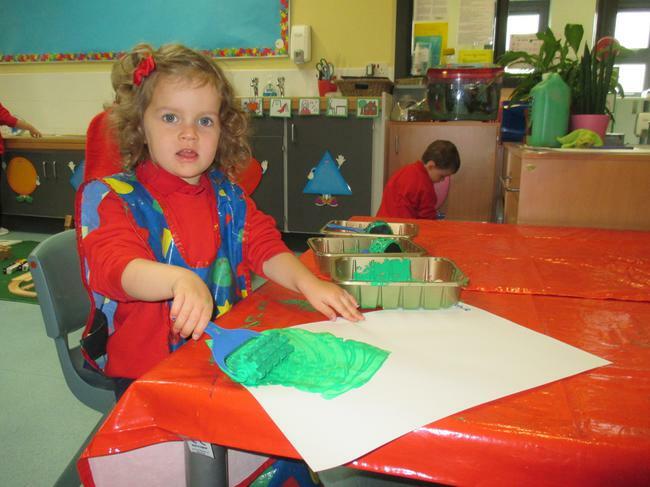 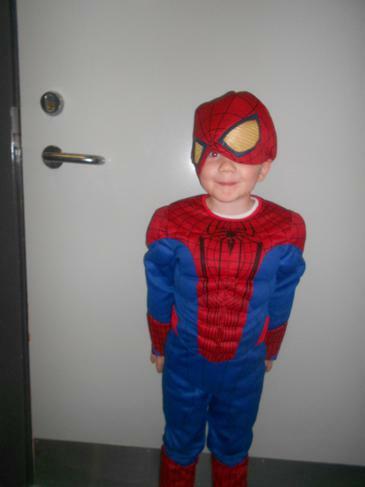 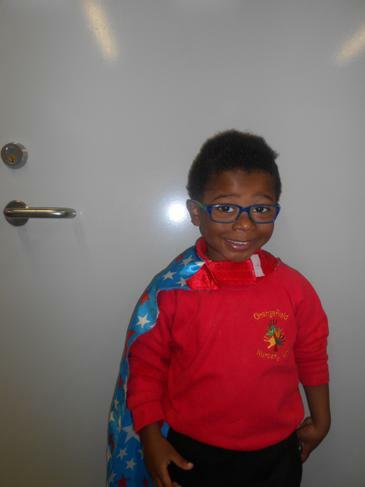 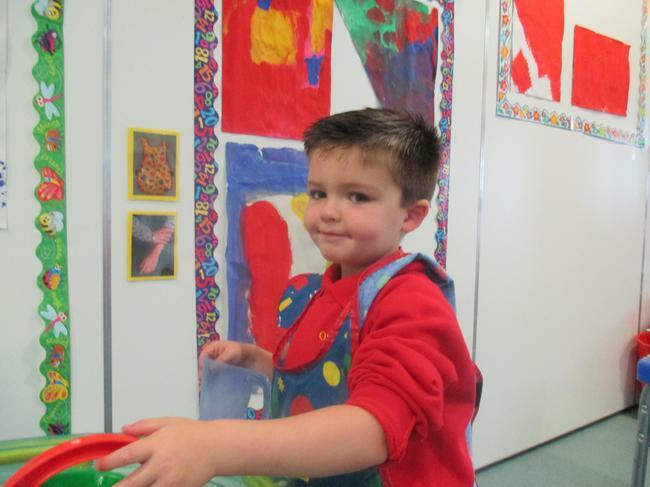 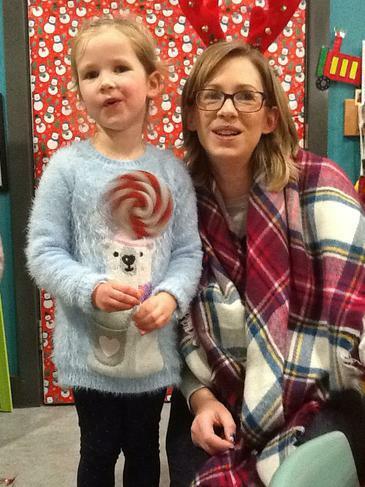 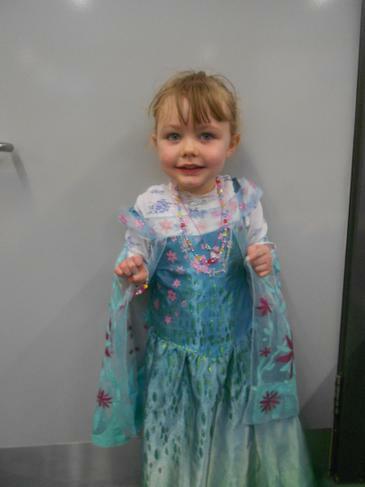 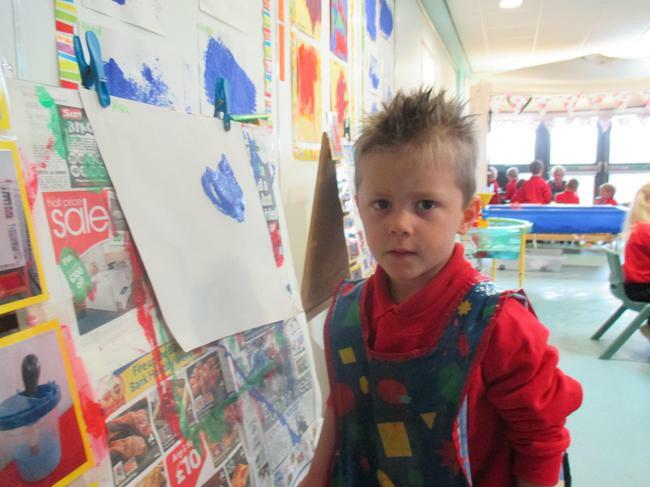 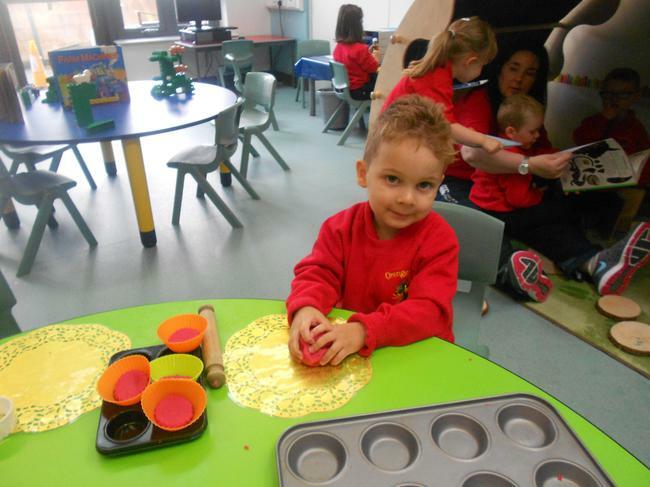 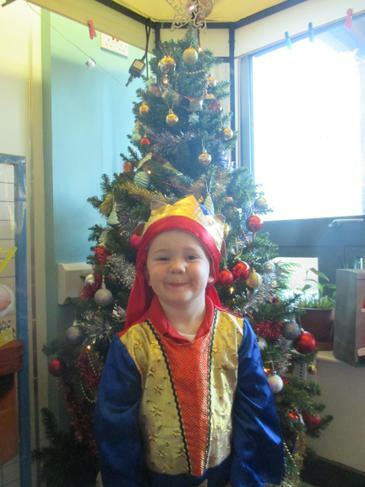 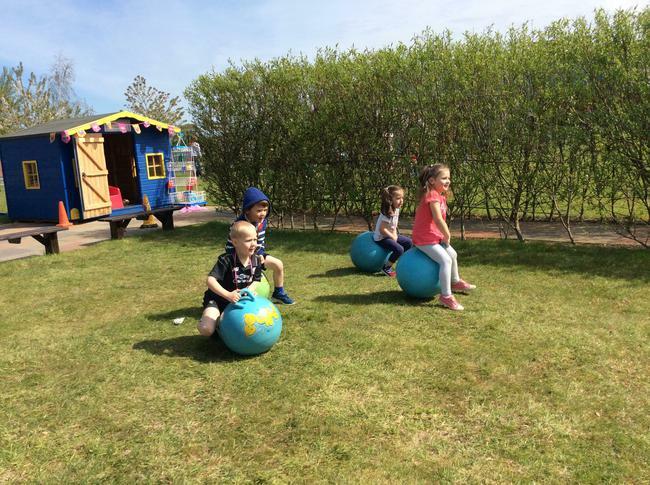 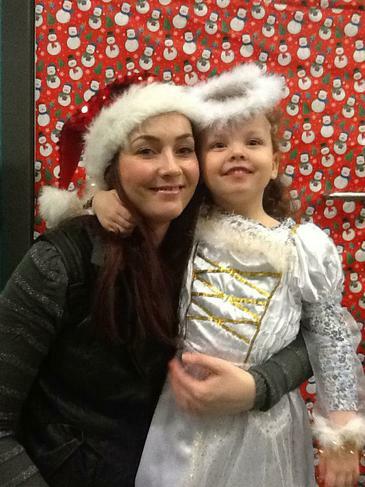 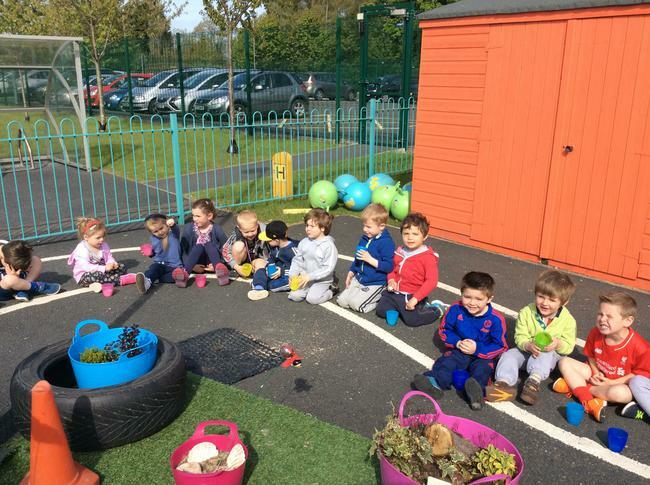 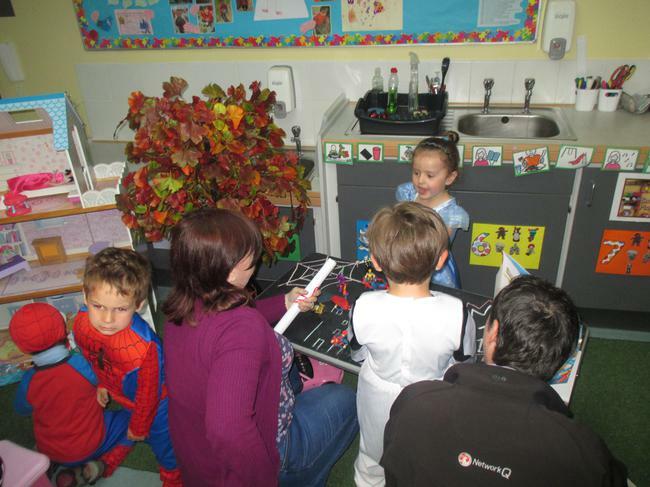 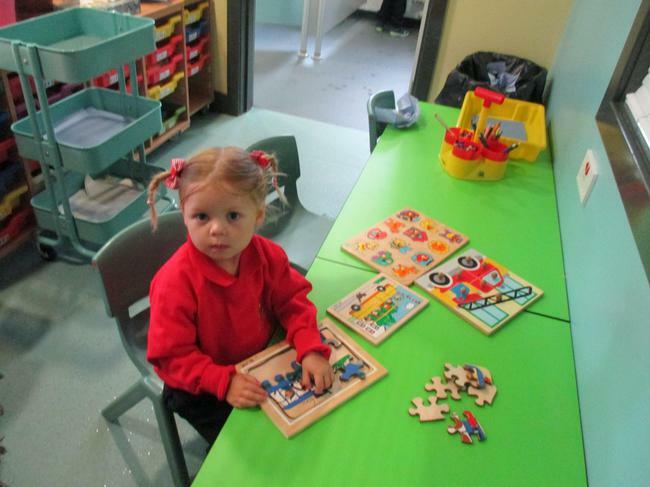 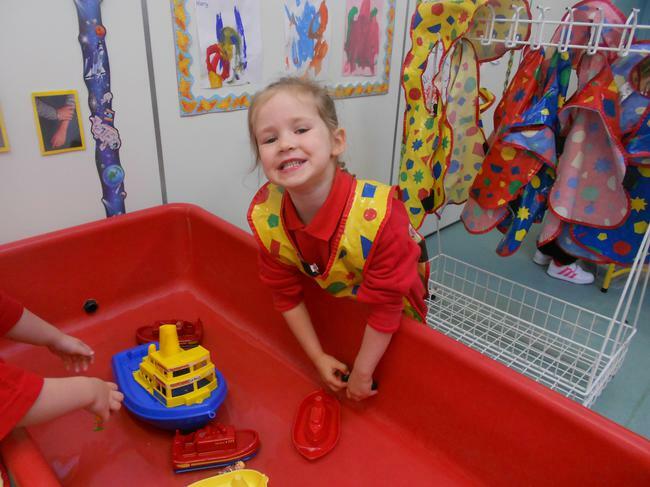 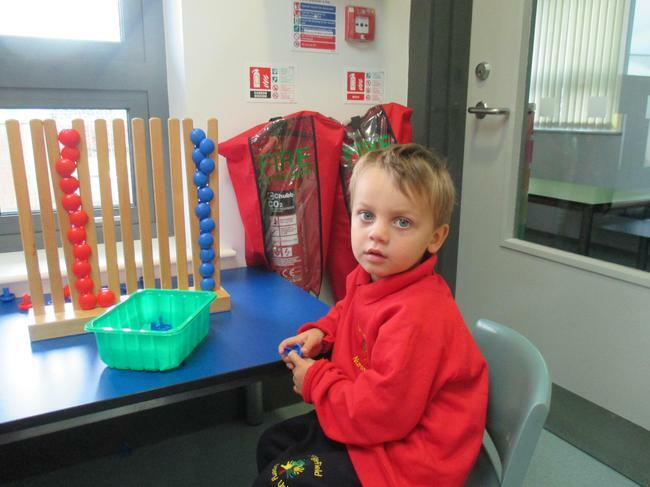 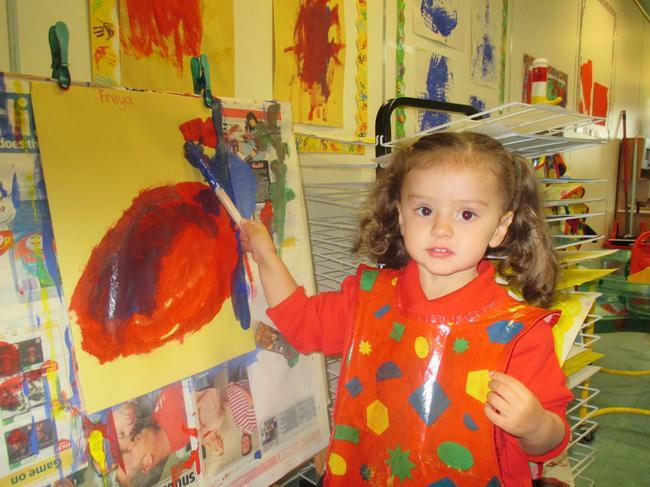 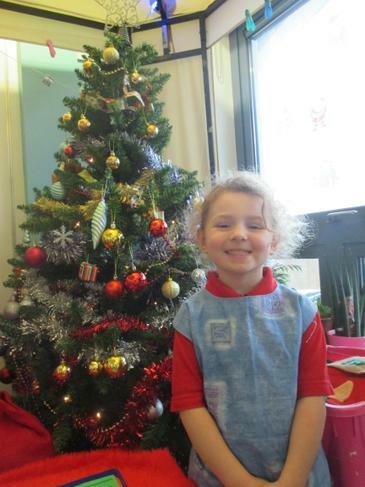 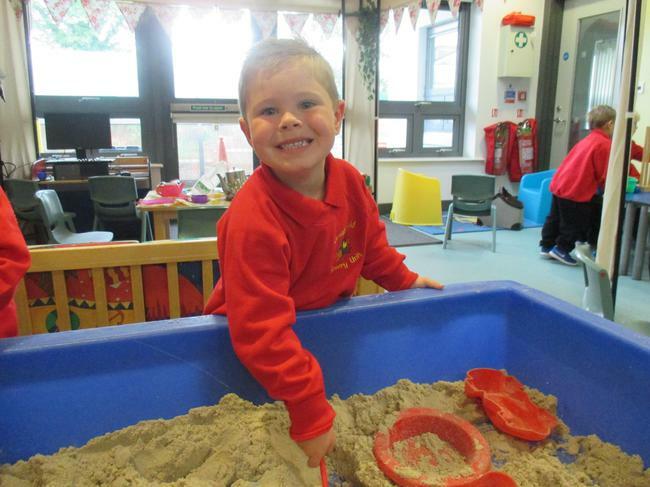 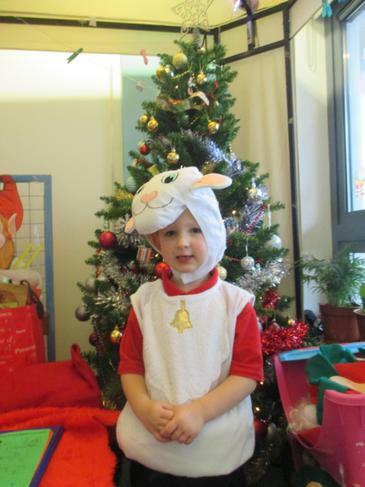 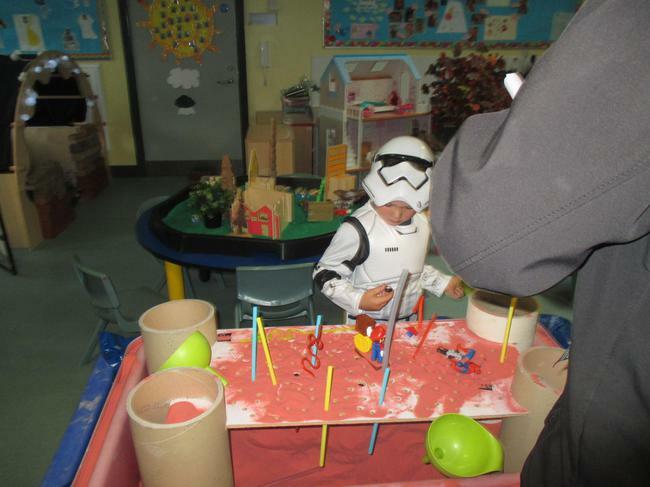 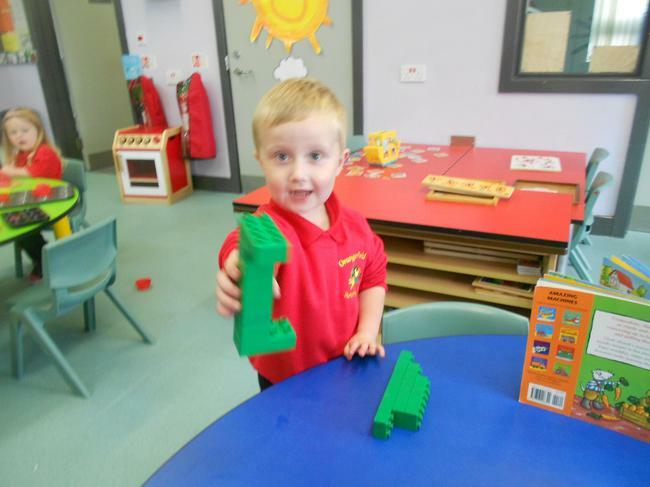 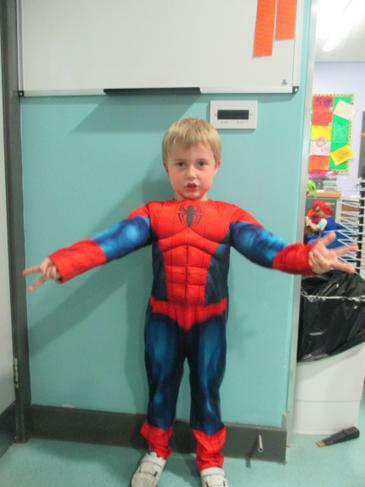 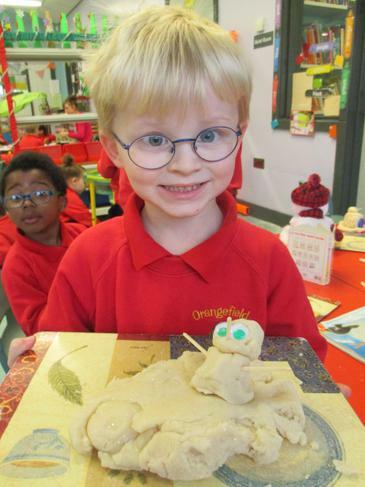 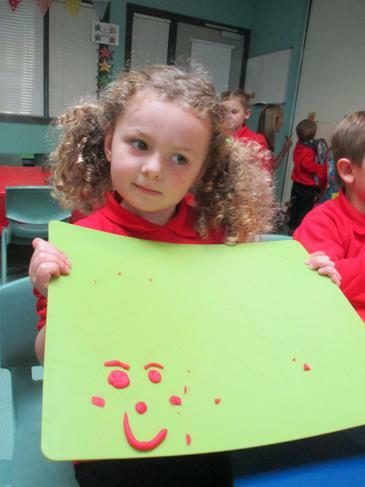 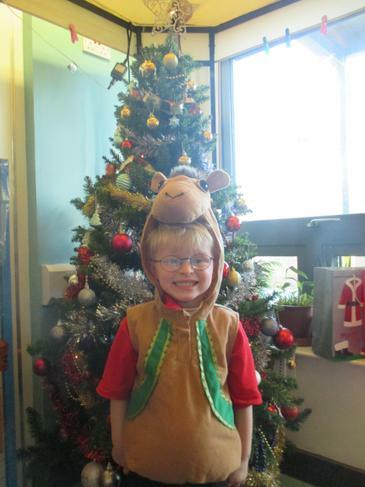 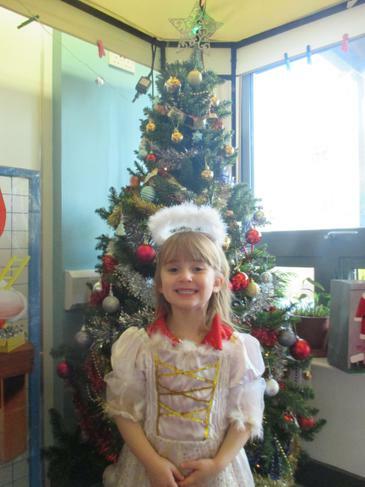 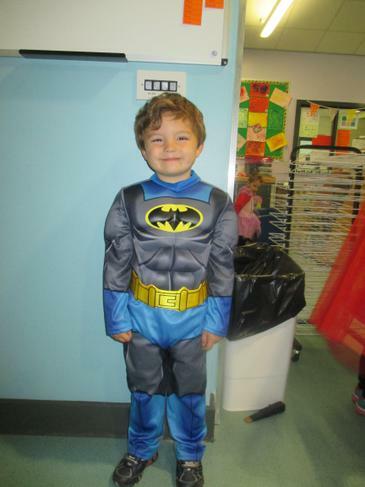 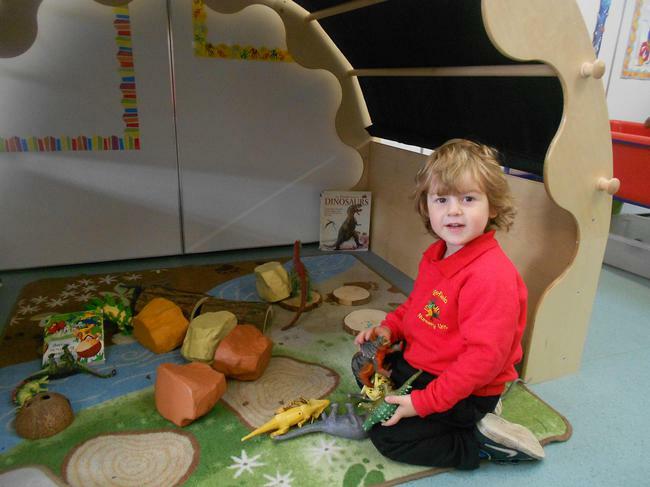 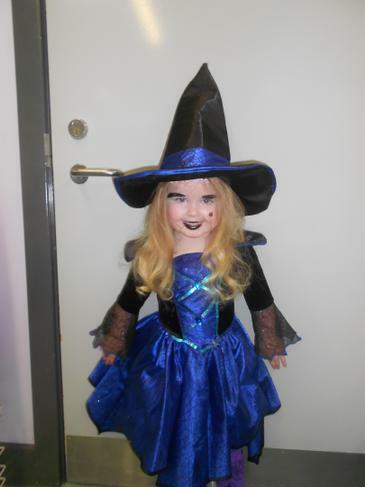 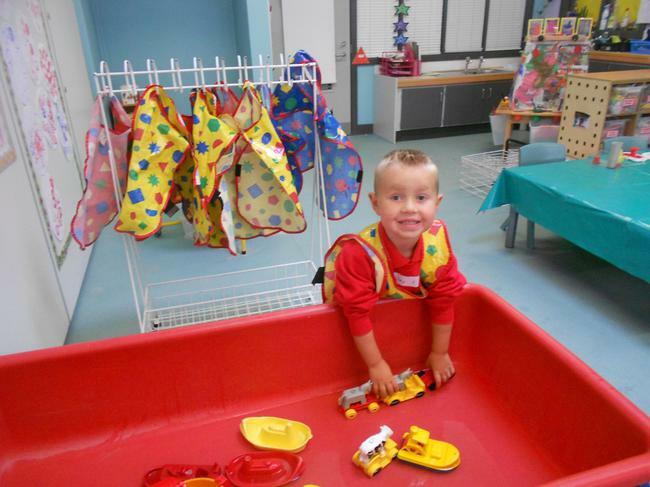 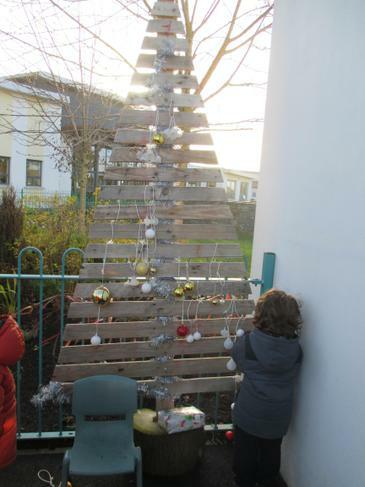 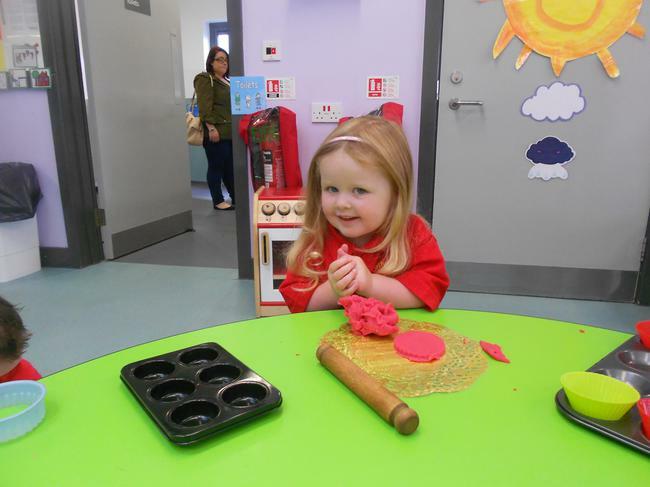 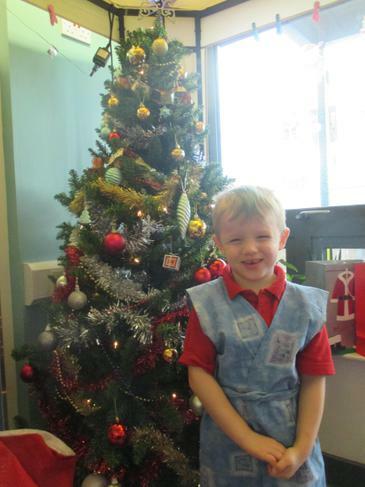 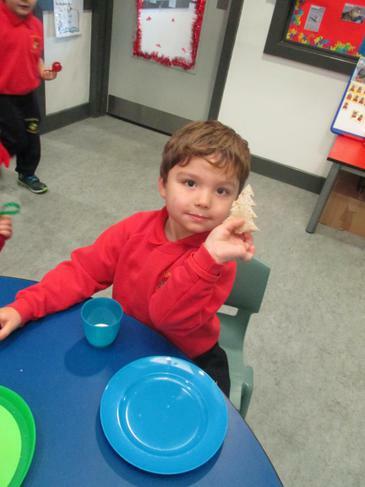 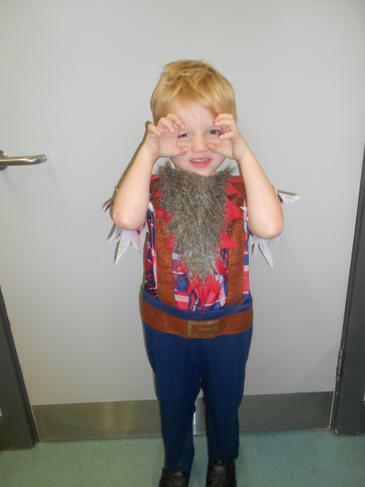 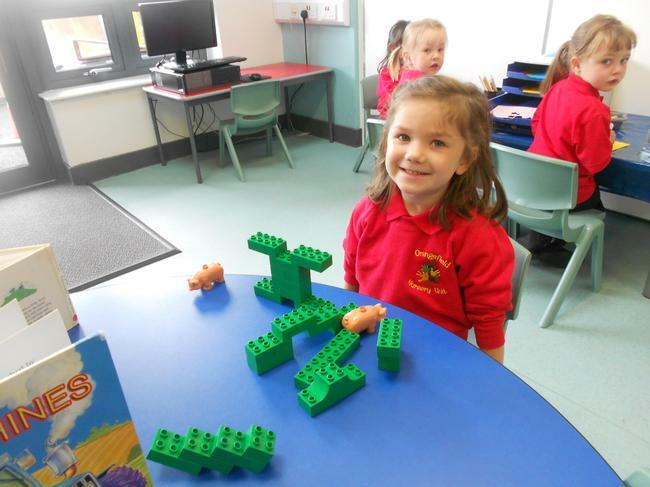 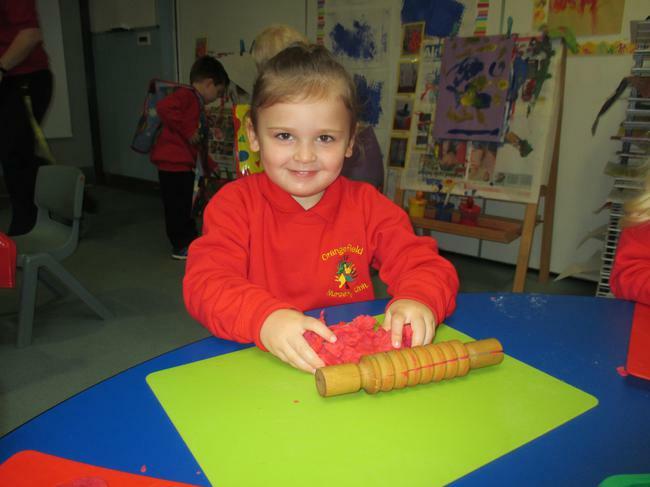 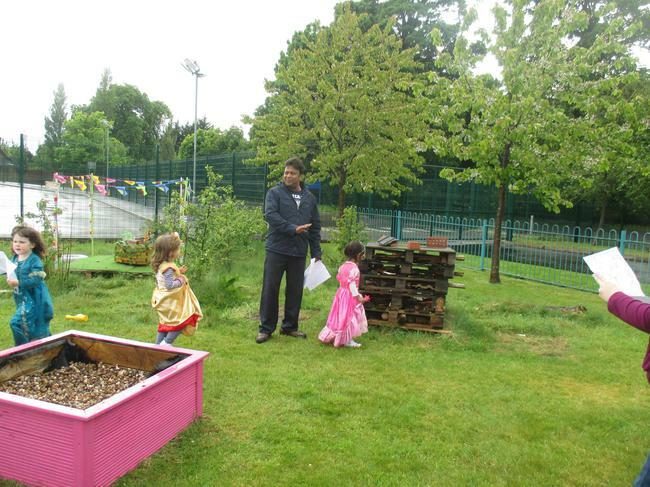 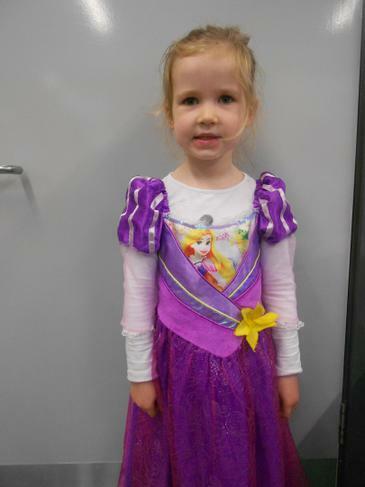 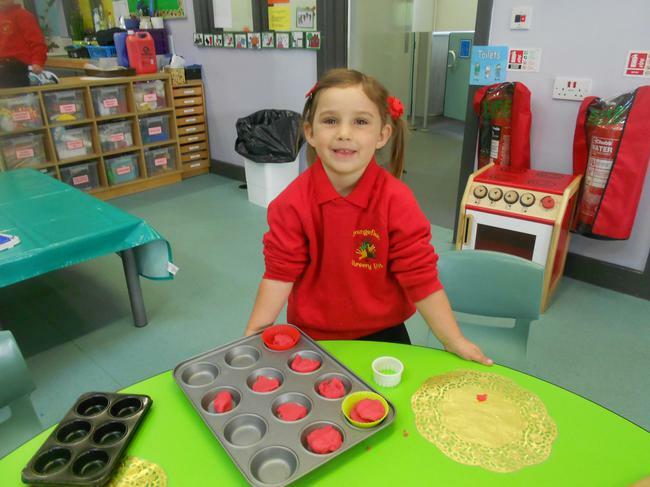 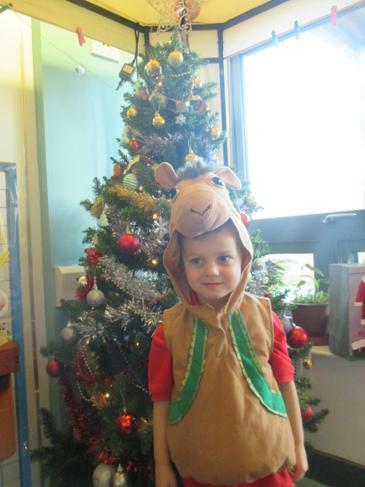 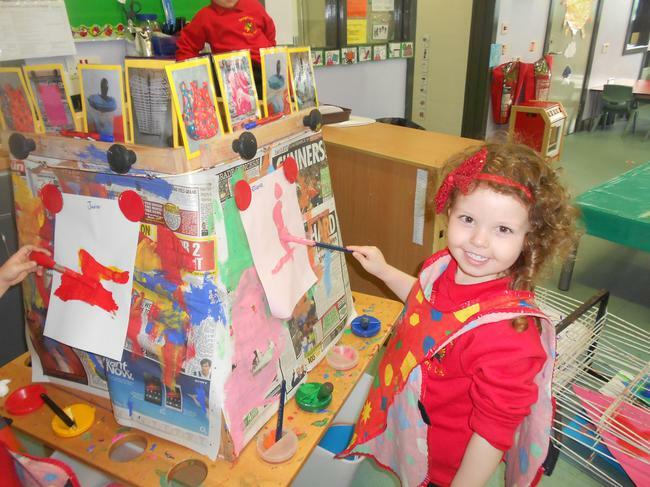 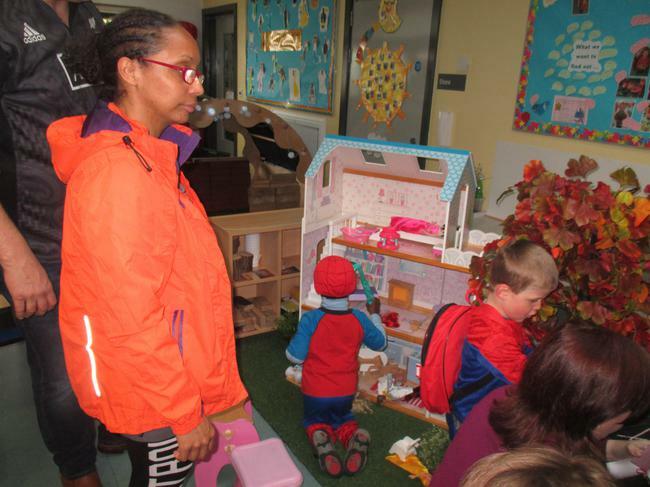 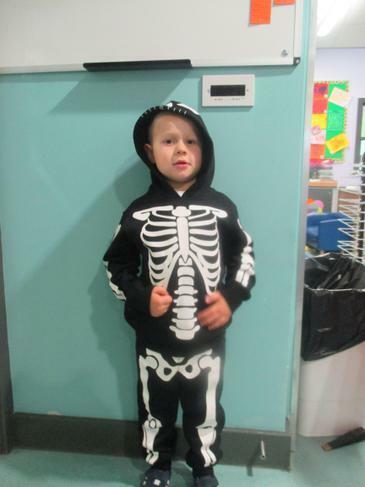 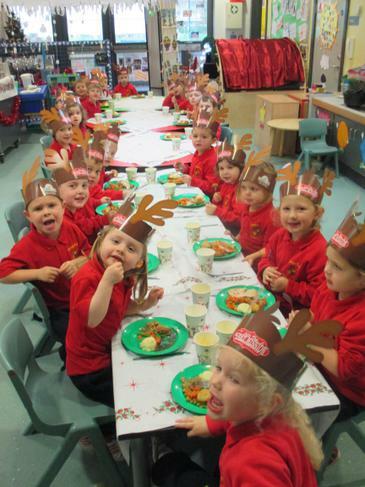 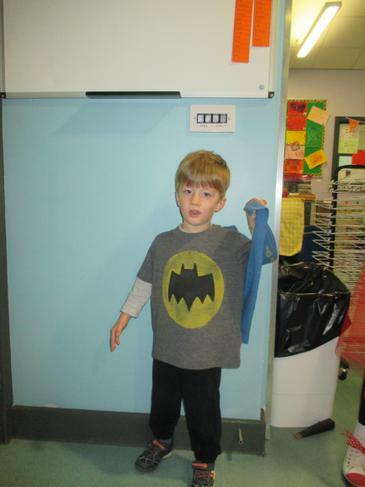 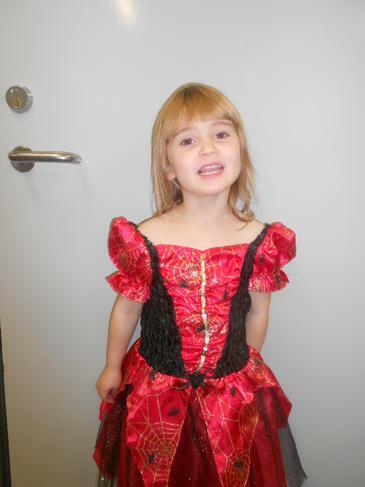 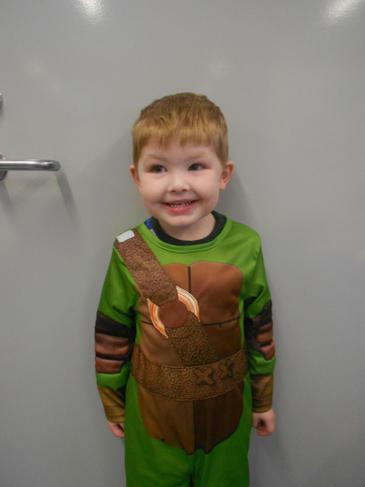 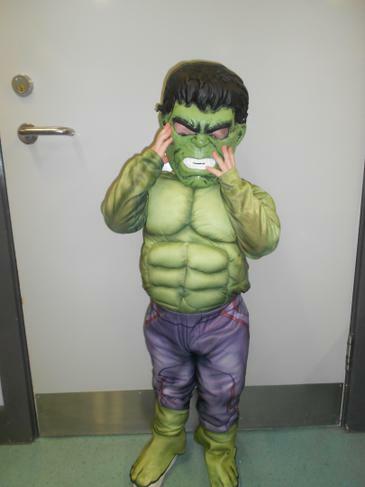 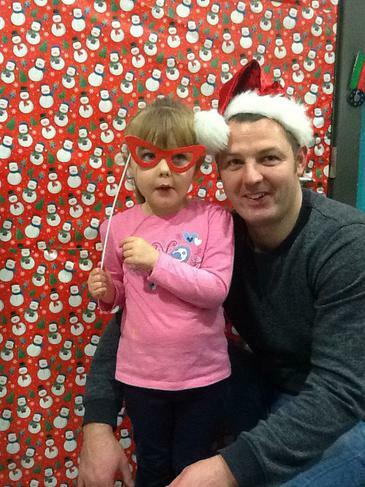 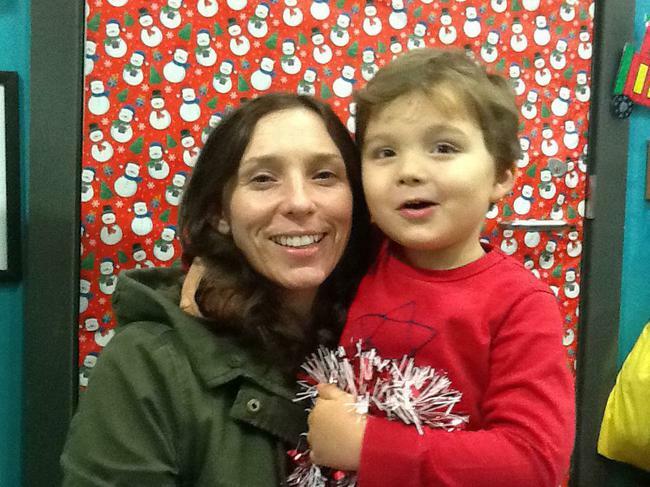 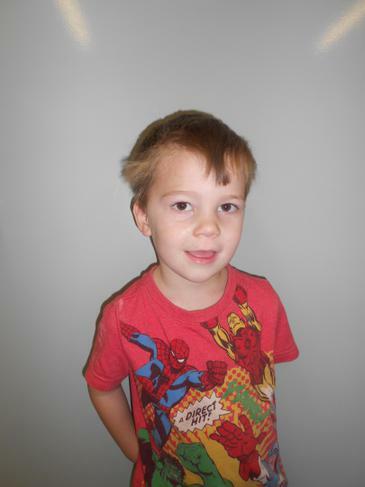 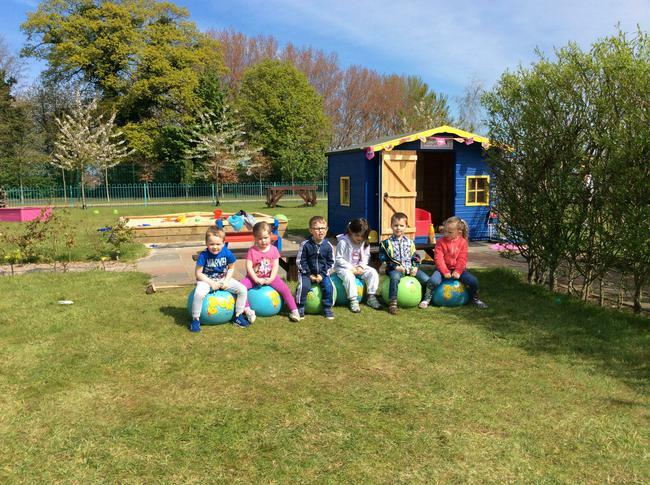 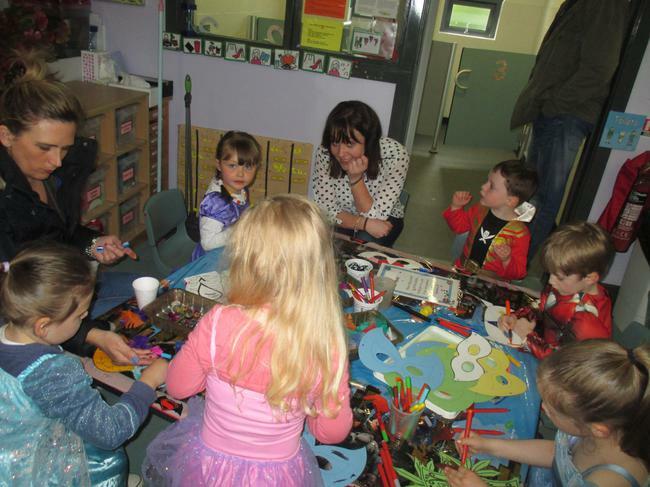 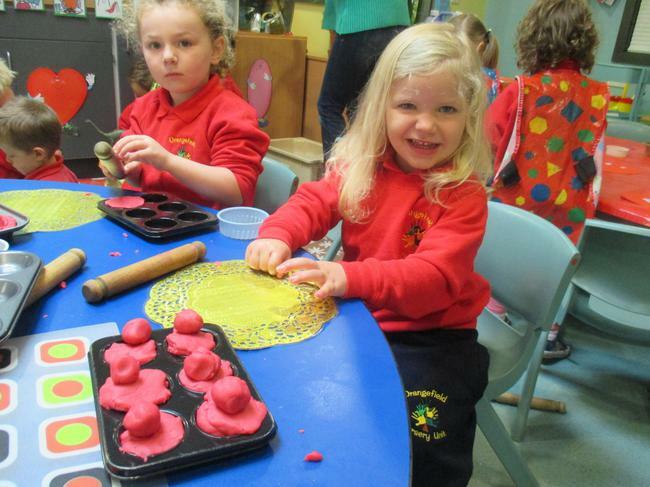 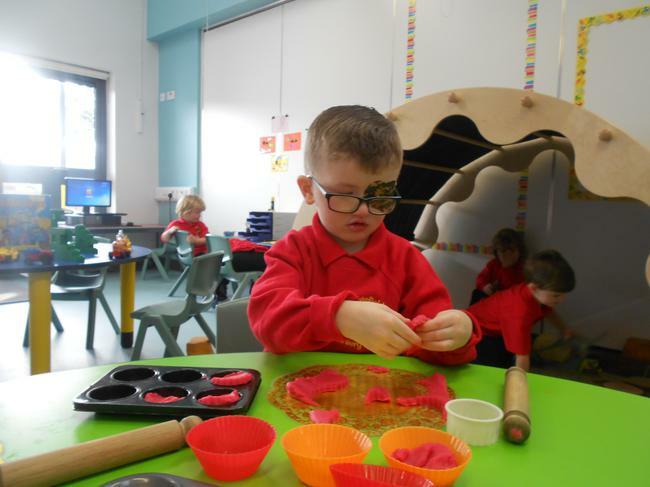 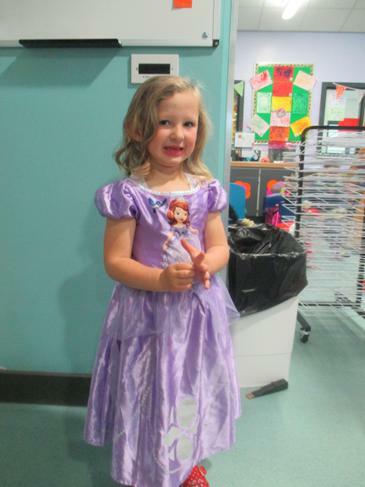 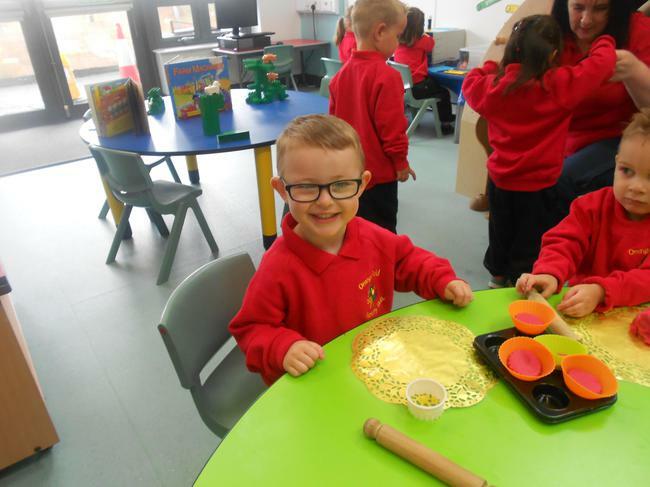 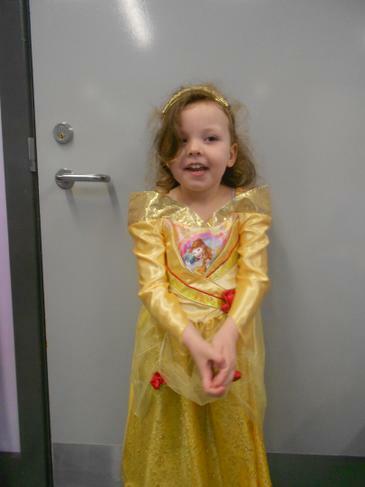 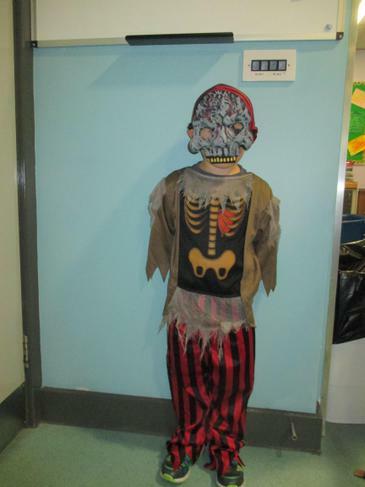 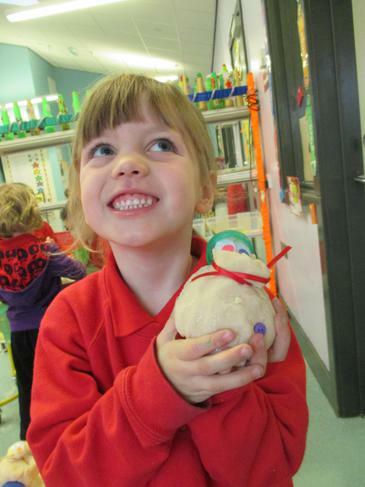 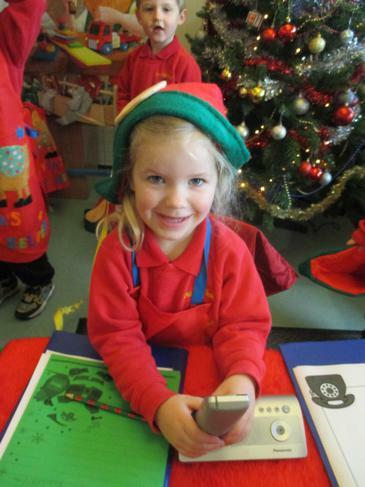 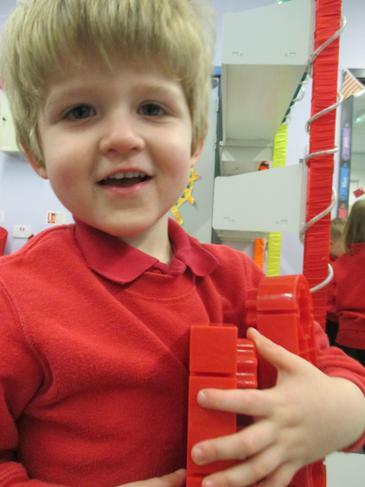 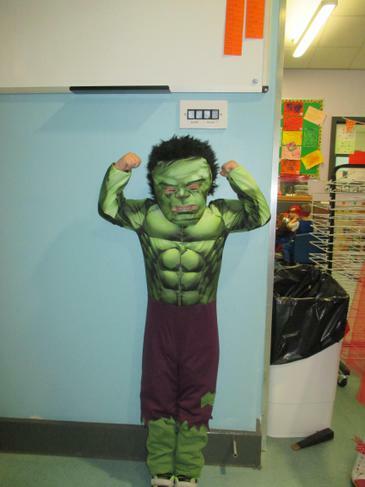 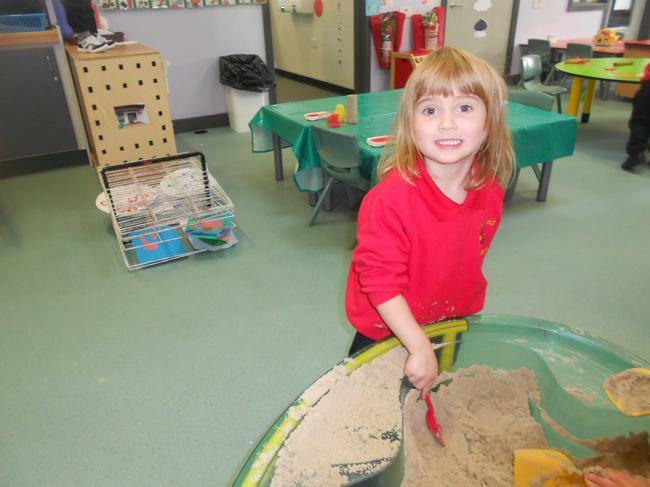 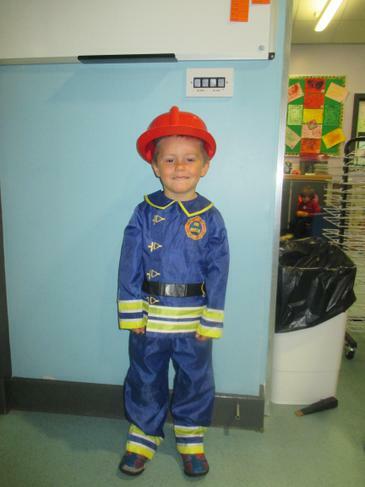 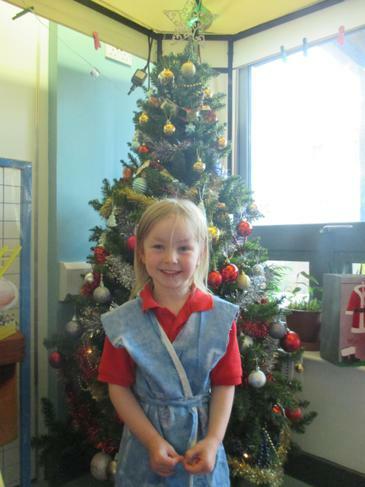 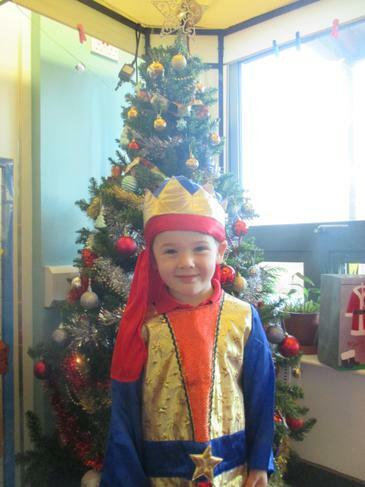 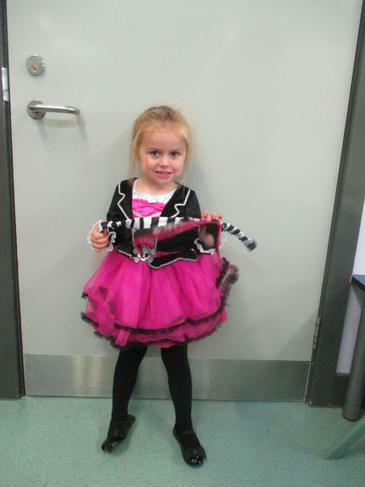 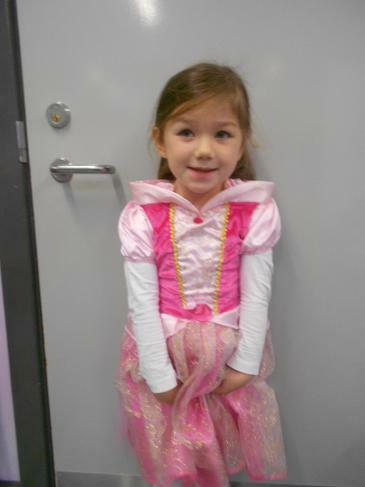 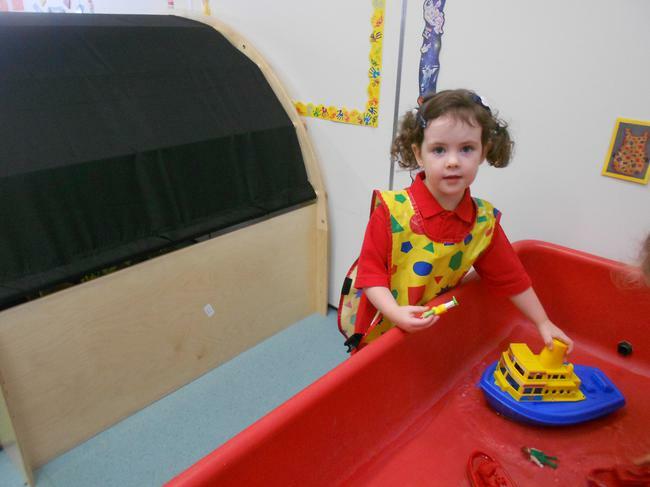 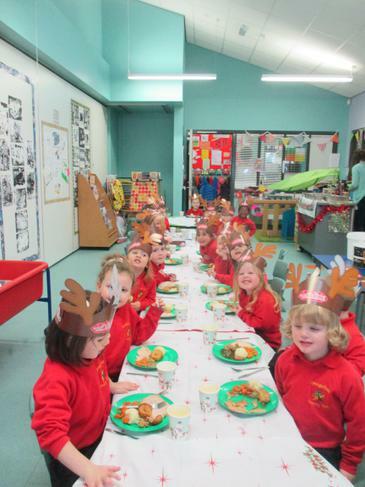 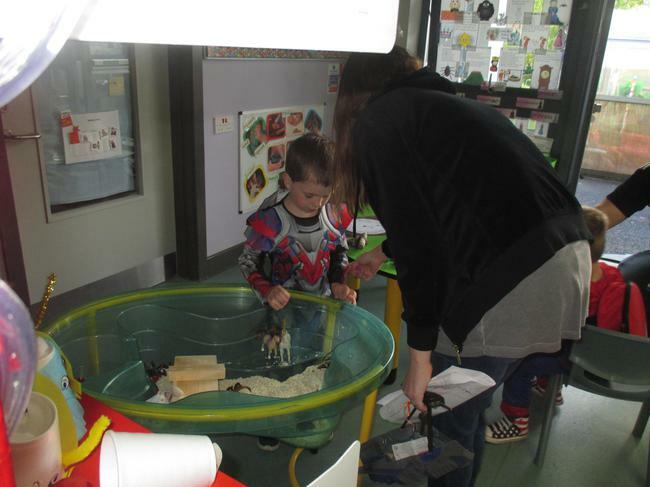 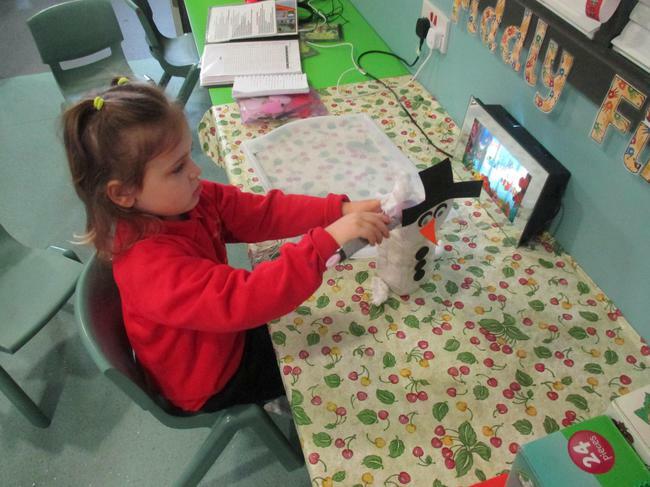 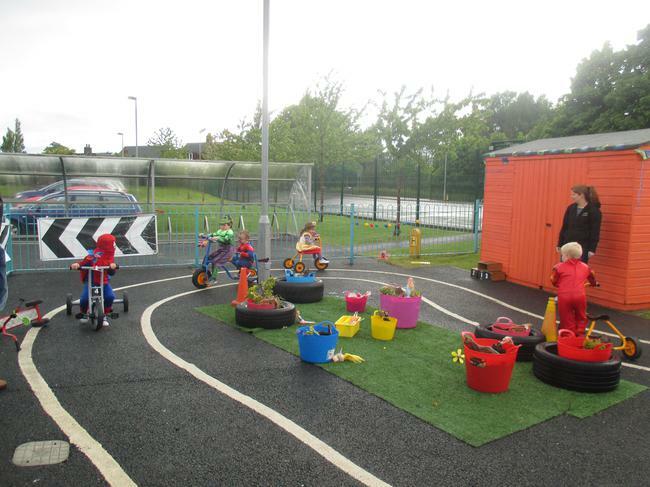 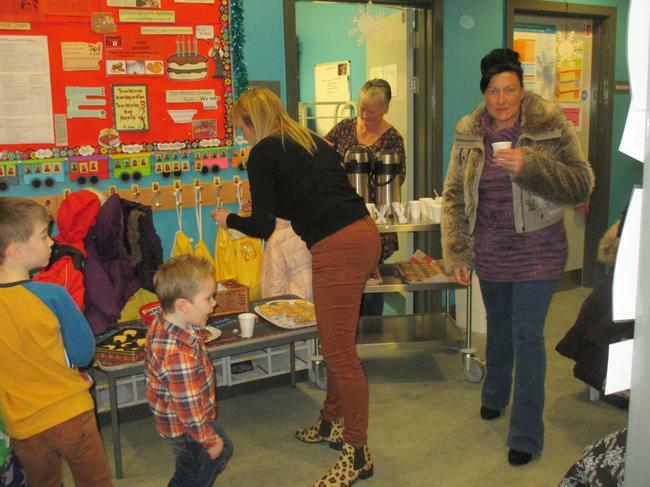 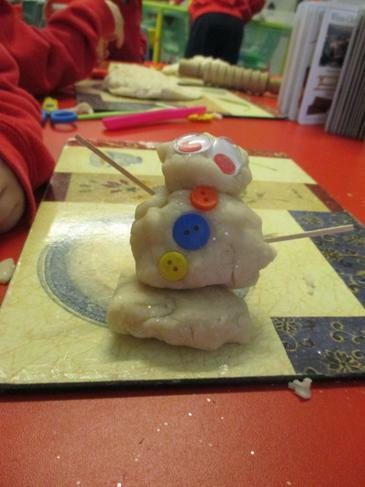 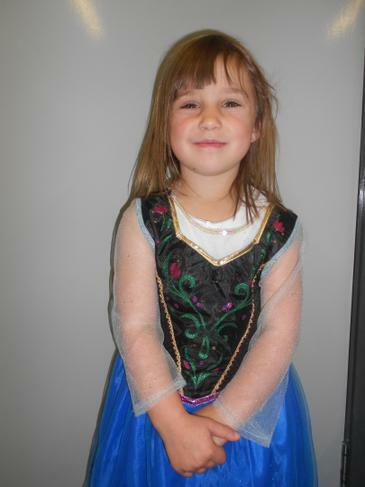 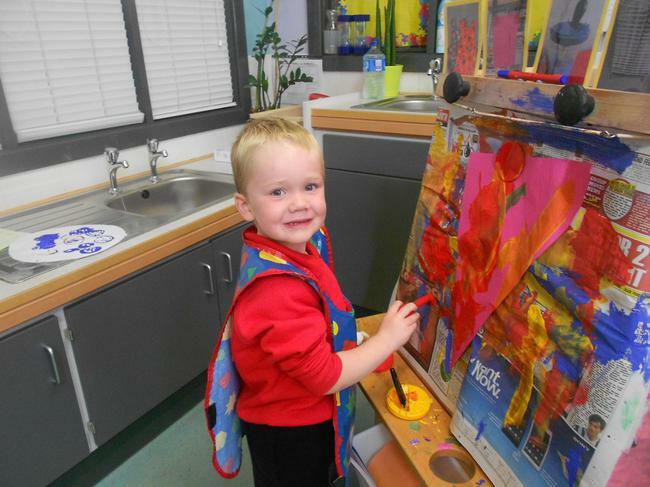 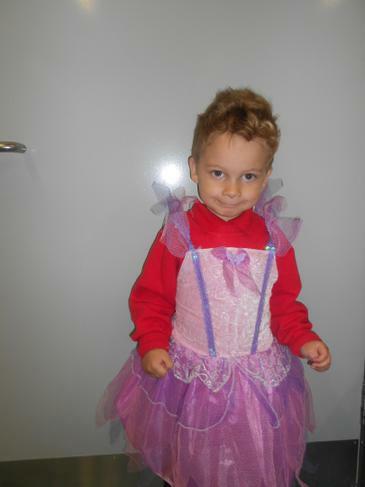 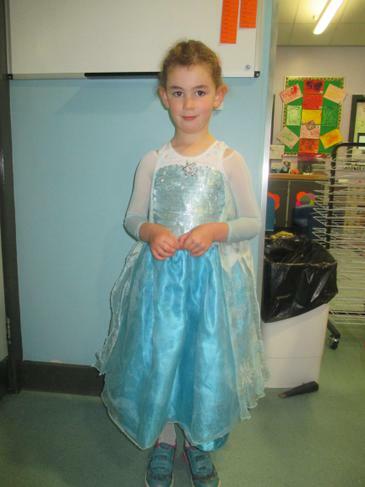 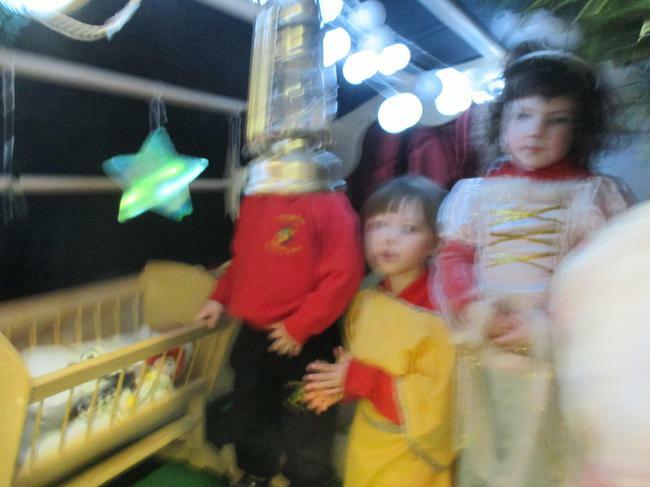 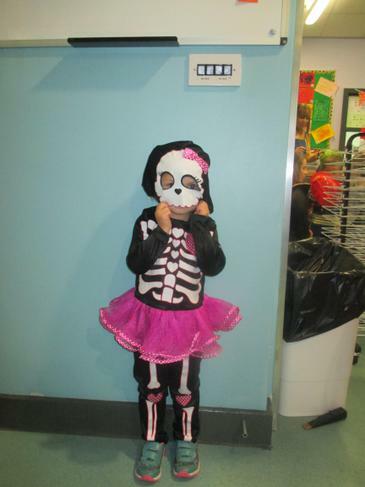 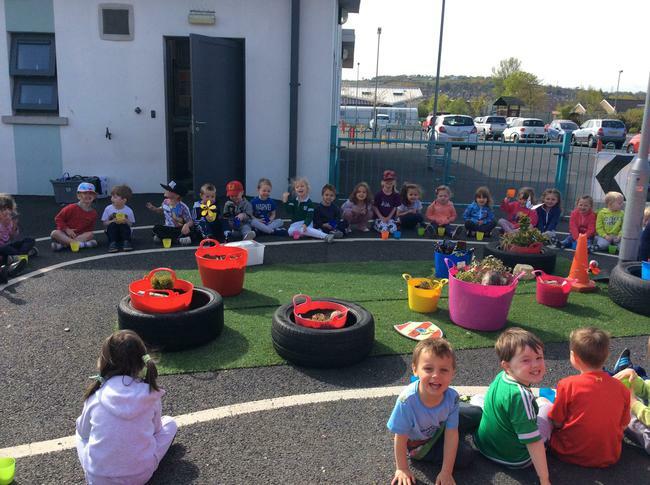 Click below to see pictures from some of the vistors we have had at Nursery! 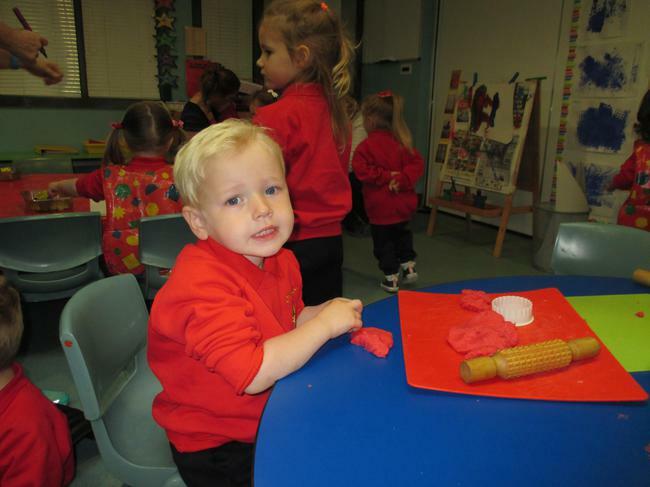 We had a great evening at Nursery celebrating our topic. 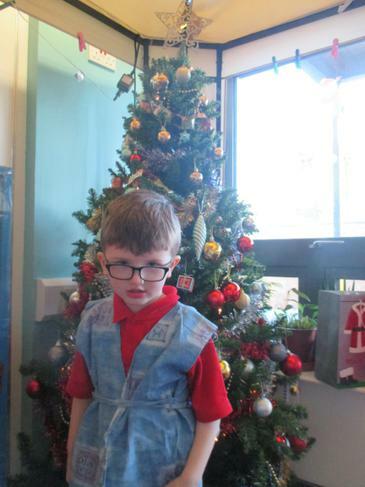 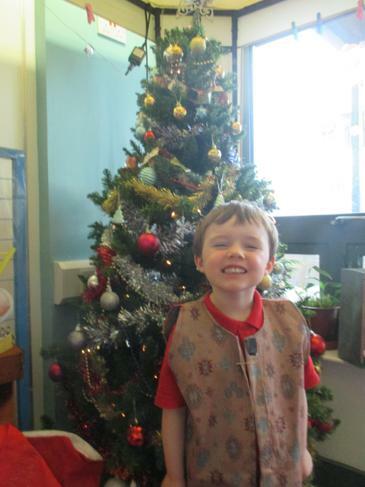 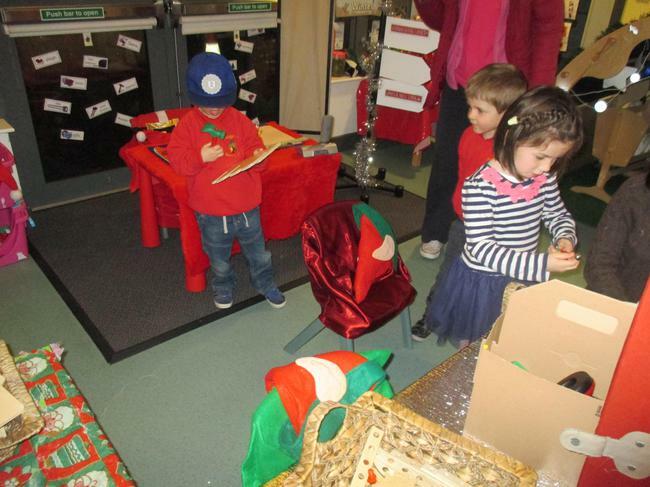 We were all dressed up and were excited to get to show our grown ups around the Nursery. 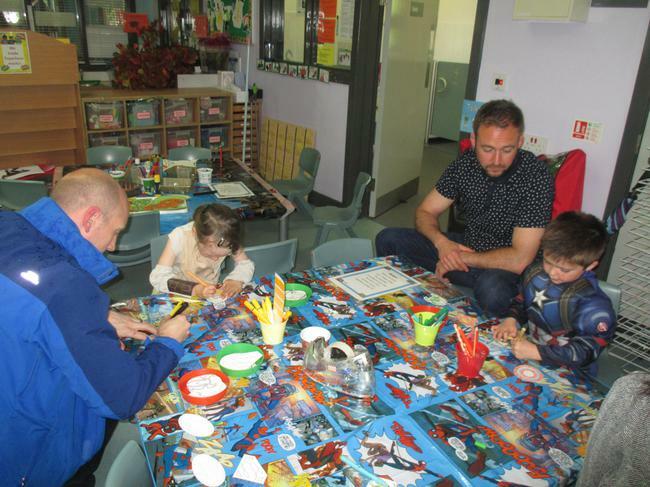 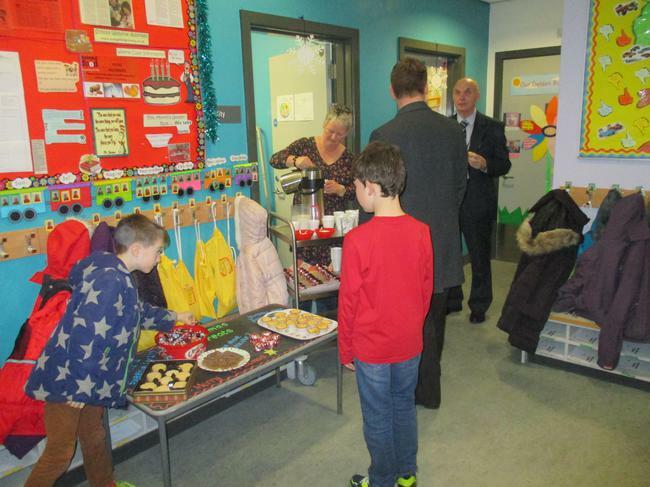 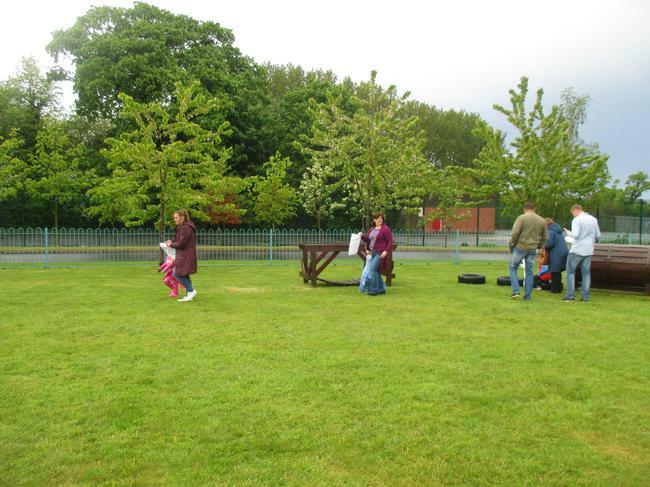 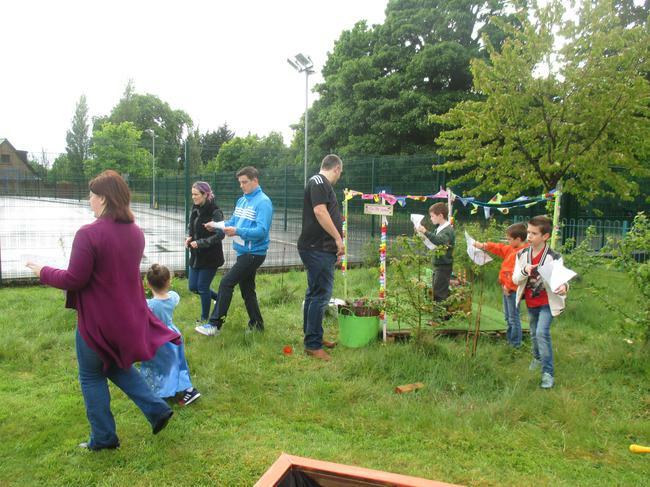 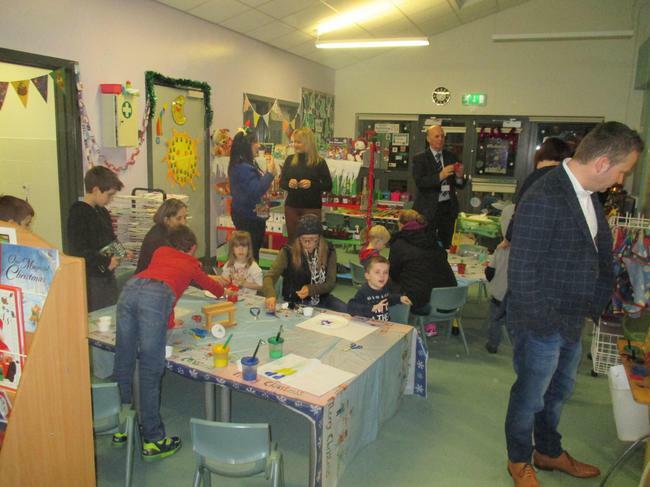 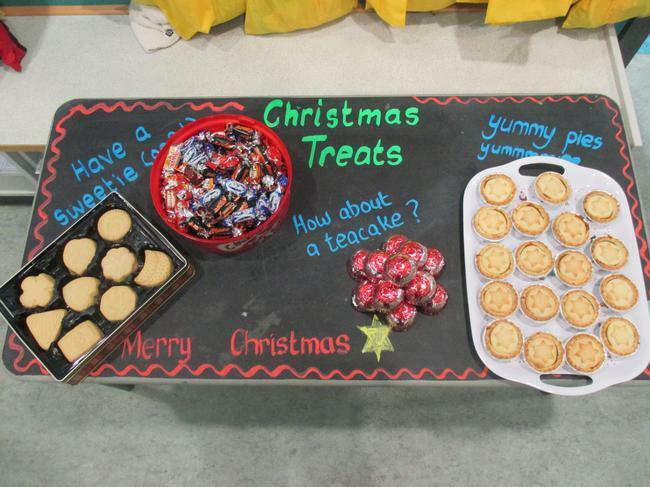 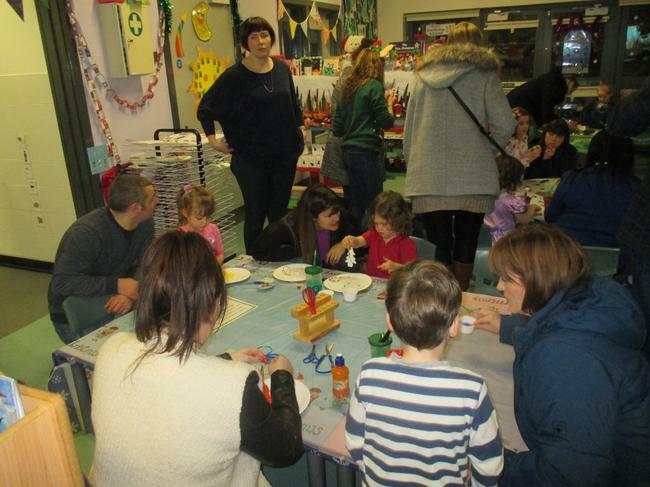 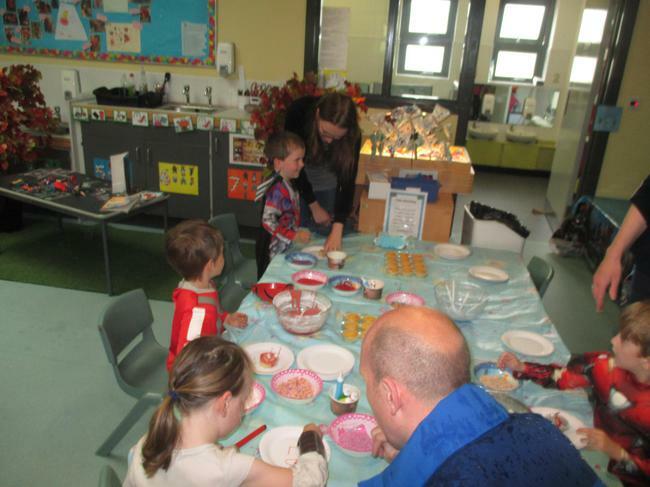 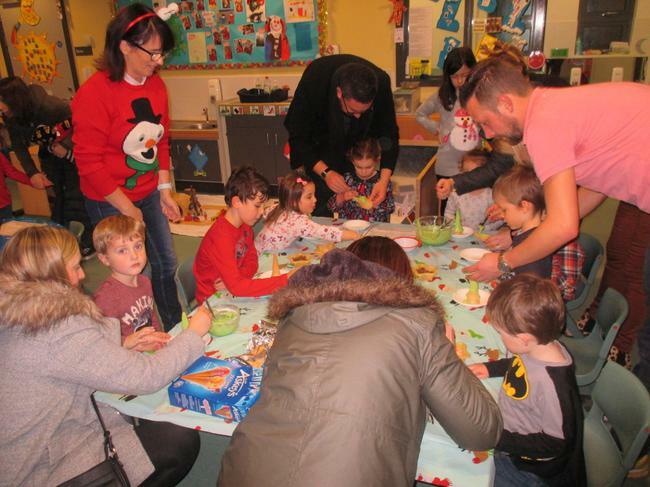 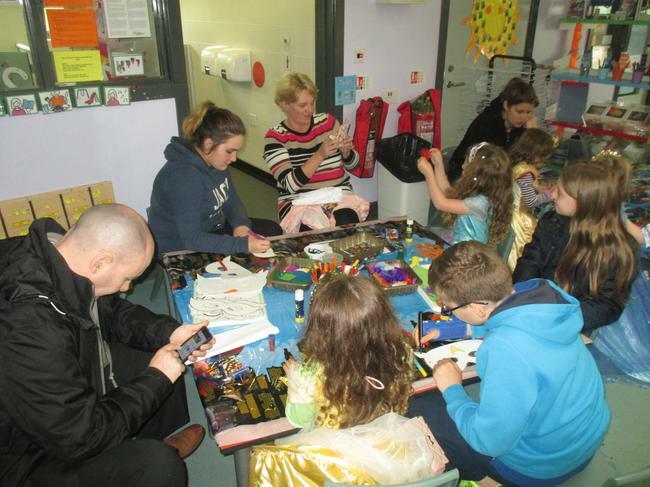 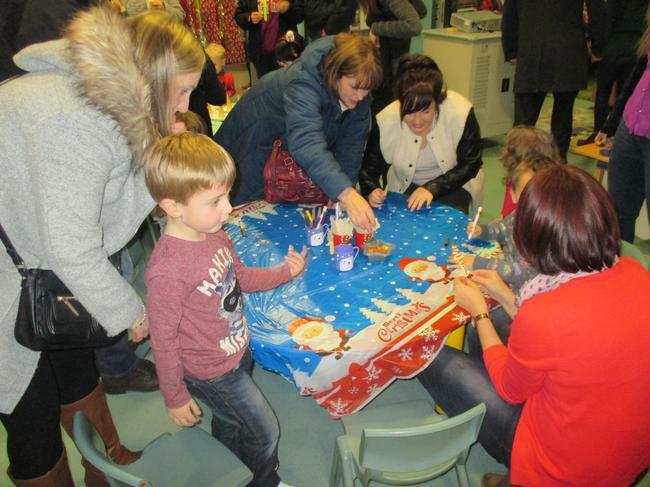 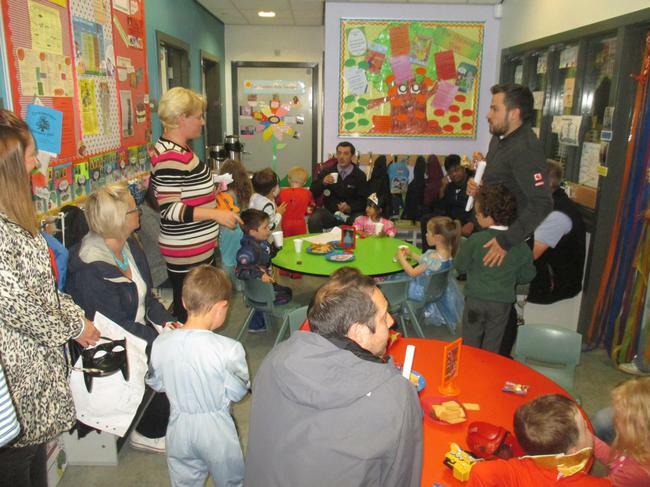 We took part in lots of activities such as Baking, making masks and badges and a treasure hunt. 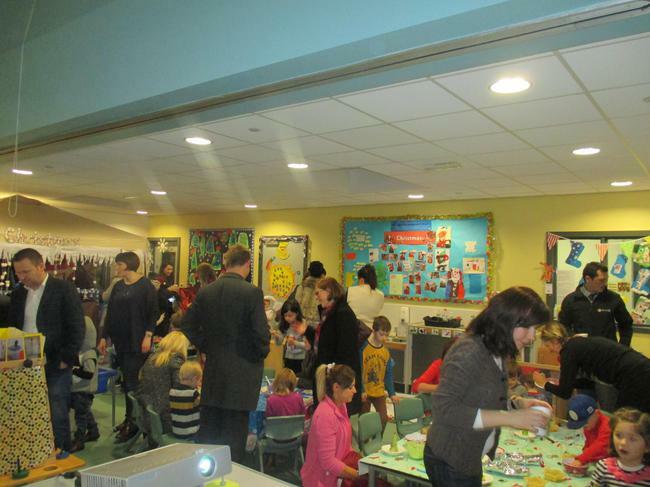 Thanks to everyone who came and had fun with us! 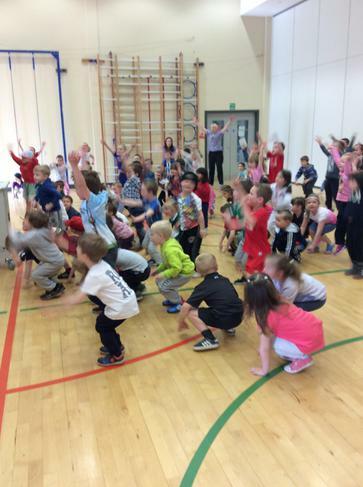 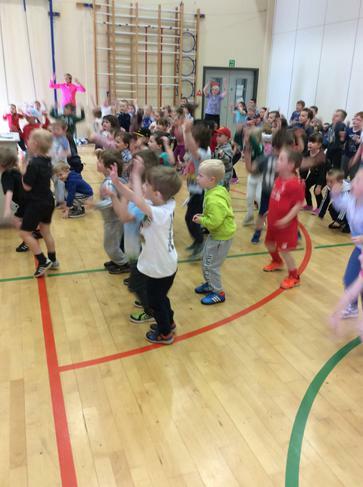 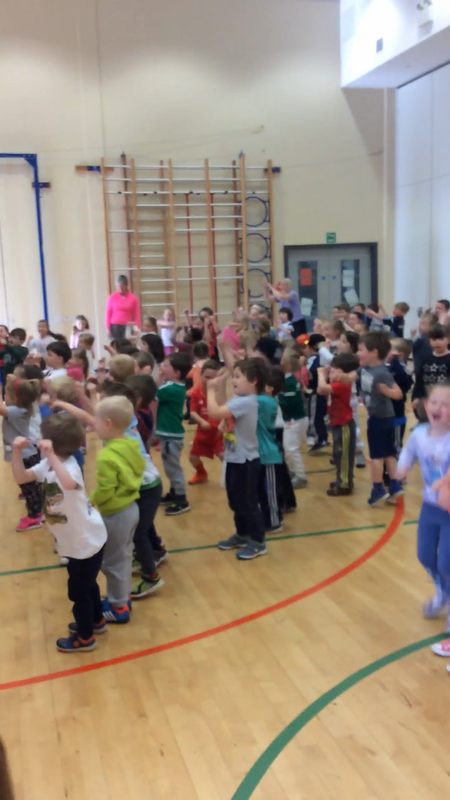 Today we had great fun doing a sponsored Bounce and Boogie! 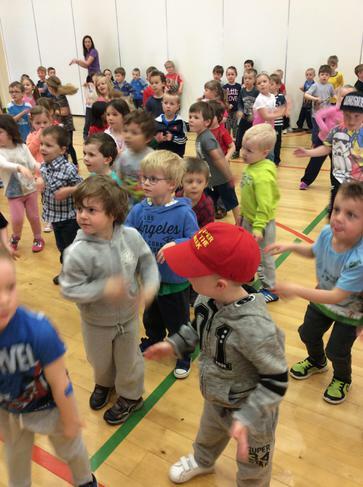 We got to go to the hall and dance with P.1. 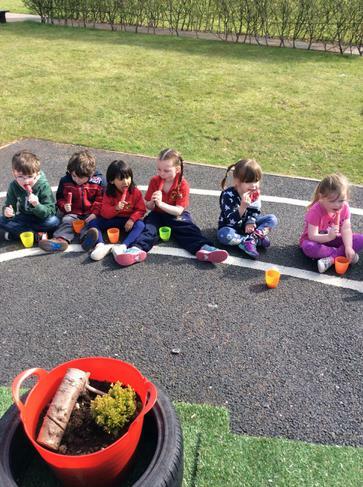 and then we did lots of fun activities outside. 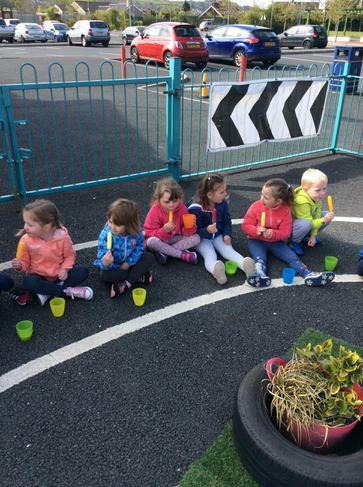 We even got to have ice lollies outside as a special treat. 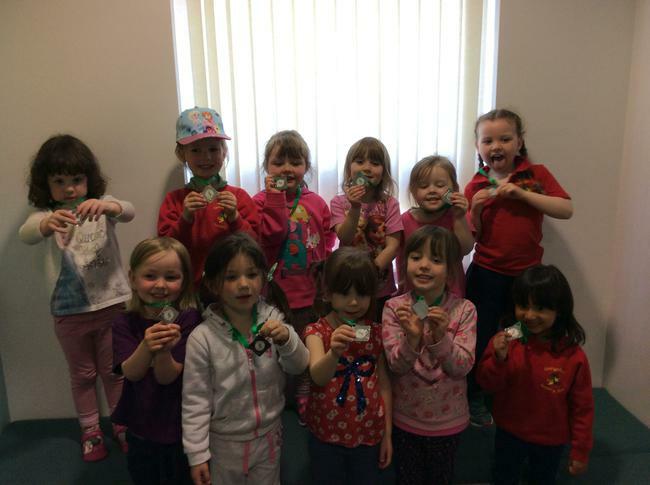 We loved taking part today and our effort was rewarded with a medal! 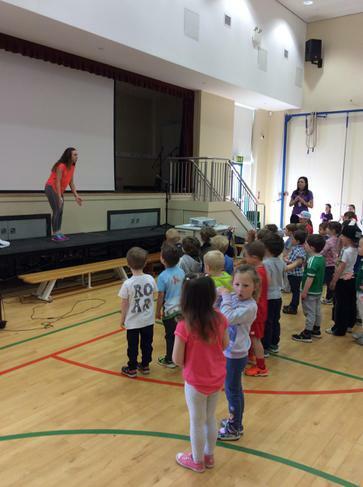 We had great fun this morning running around the big school. 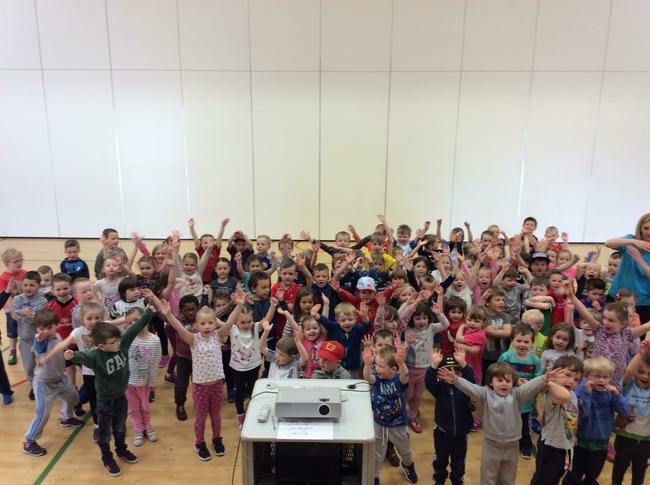 We are very proud of ourselves because we all completed a mile! 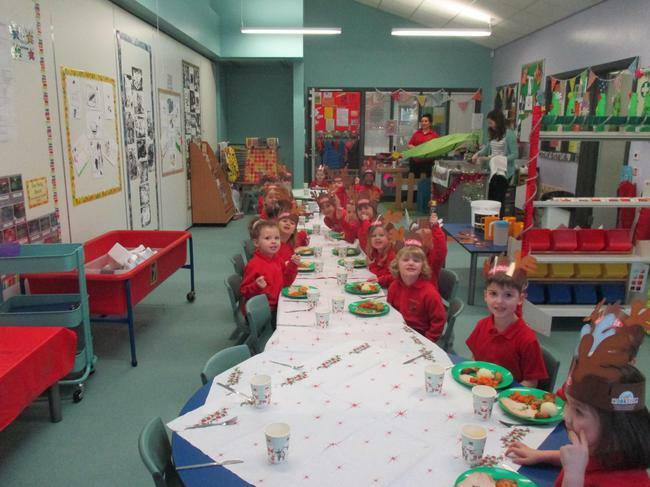 We were also very kind and helped to raise lots of money for Sport Relief. 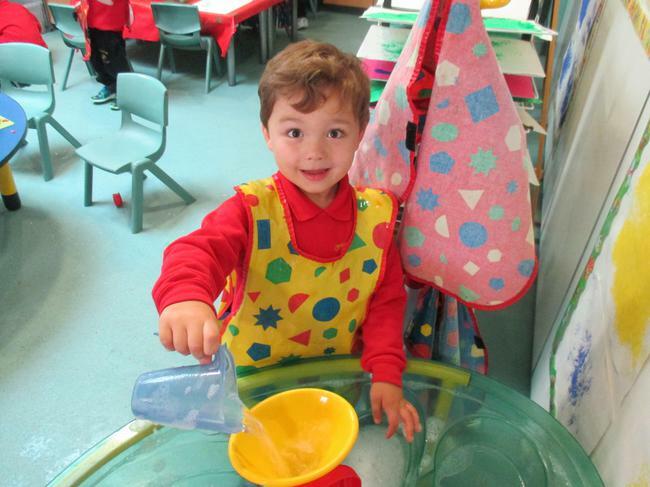 We went to the milk bar in the big school for our snack. 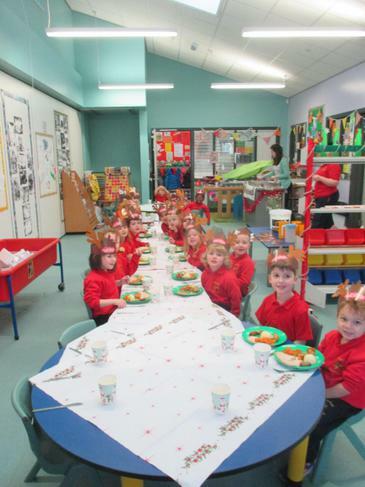 We enjoyed meeting the dinner ladies and they were very impressed with our manners. 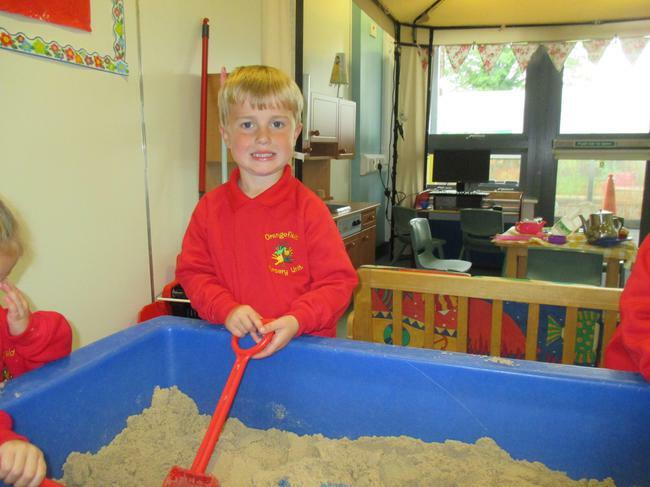 We also showed how grown up we were getting when we cleared away after ourselves! 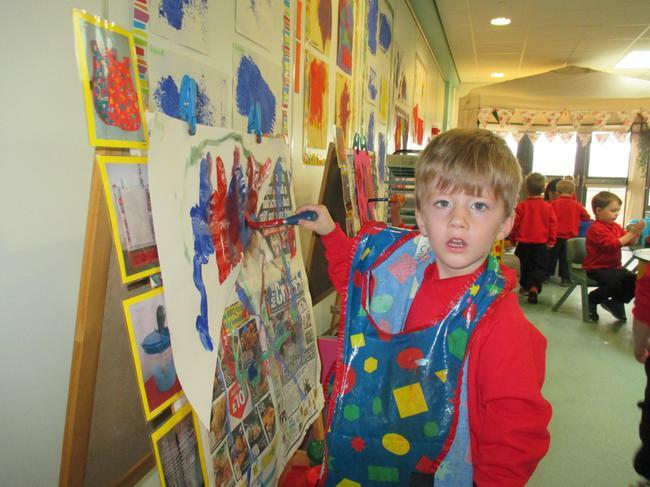 We have had a great time learning all about ourselves. 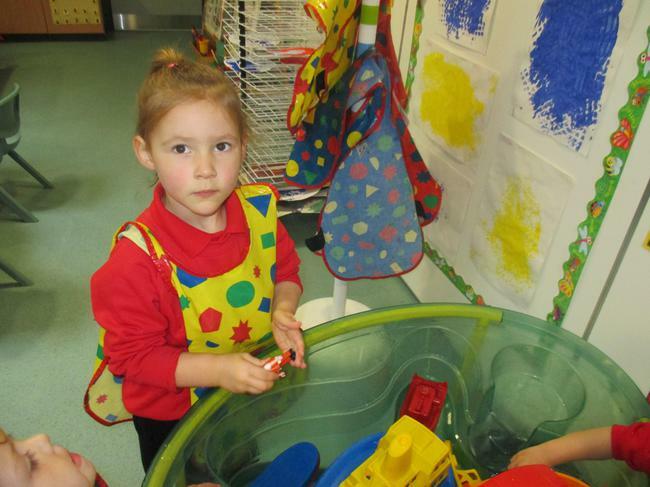 We have looked at pictures of ourselves as babies and then how we have grown up. 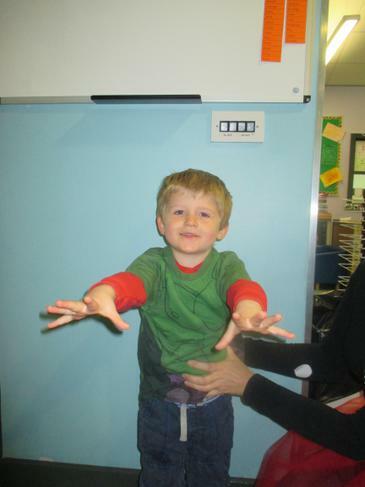 We have also learnt lots about our bodies and how to keep healthy. 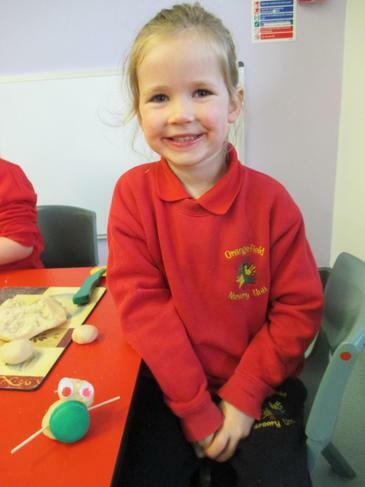 We had a sensory room, we baked people shaped biscuits, painted lovely portraits of ourselves and got to take a photograph of our favourite toys. 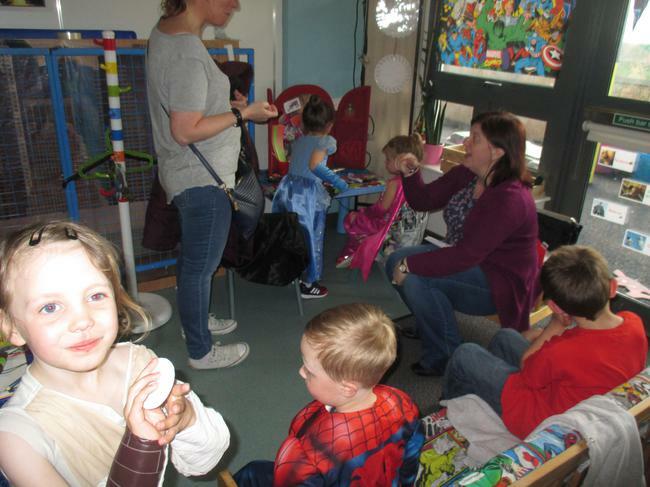 Have a look below to see how busy we have been. 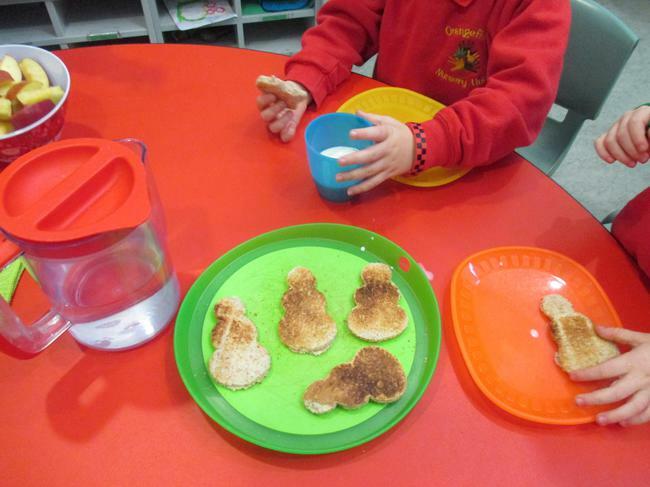 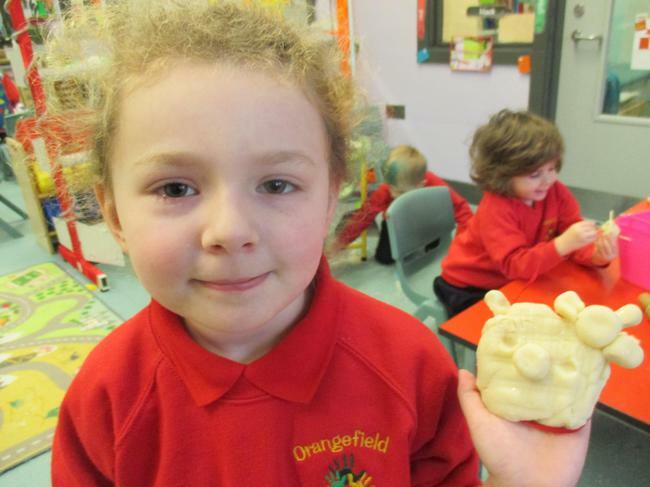 We had lots of fun today making pancakes to celebrate shrove Tuesday. 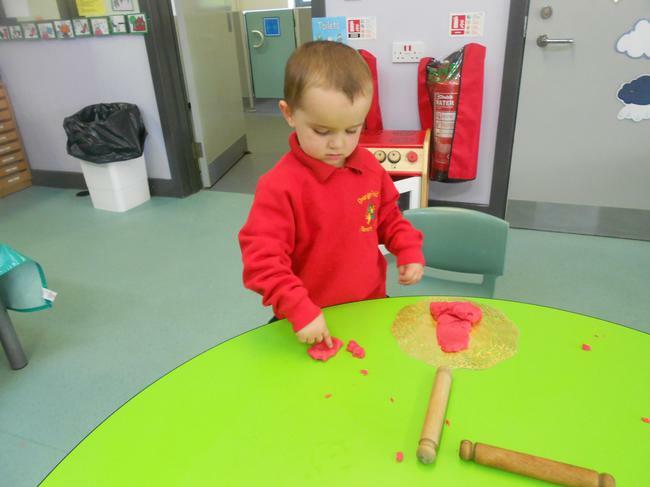 We also enjoyed having a go at flipping them which was very funny! 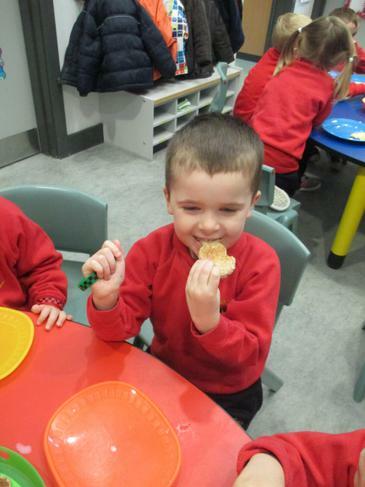 The best bit of all was getting to eat the yummy pancakes all up! 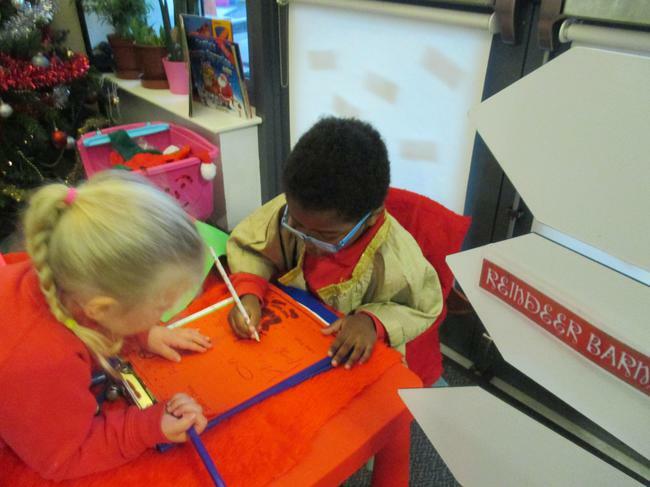 We have had a great time learning all about different kinds of houses. 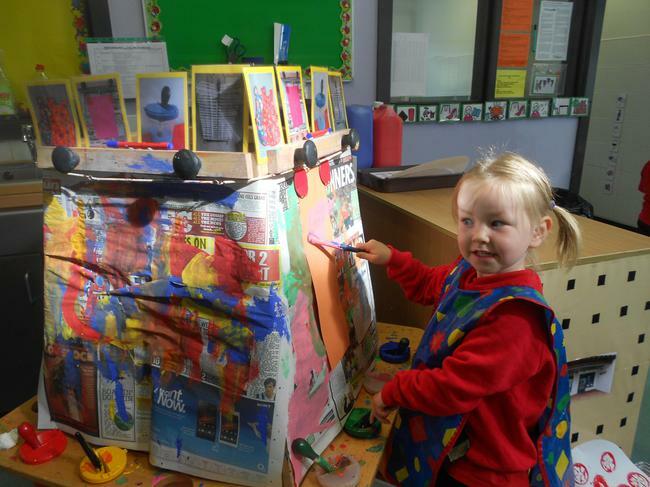 We have been super builders and built some of our own houses, looked at pictures of different houses and done some lovely craft! 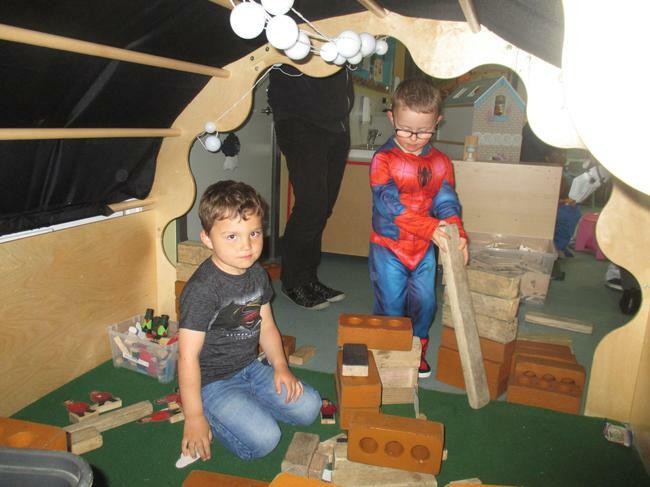 We have also learnt about lots of the different tools a builder needs and had lots of fun playing with some in our role play area. 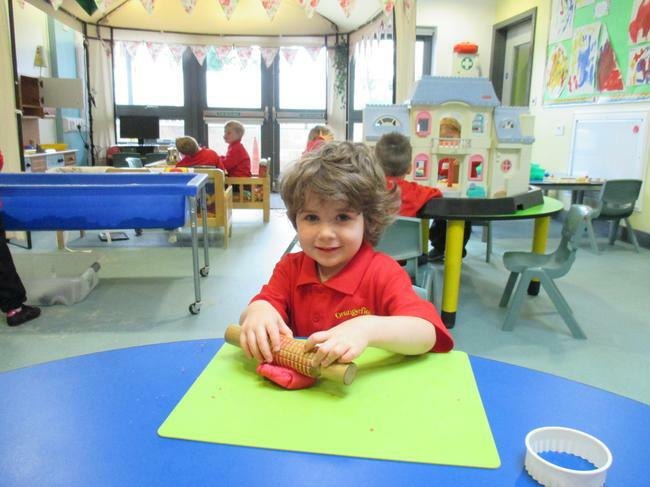 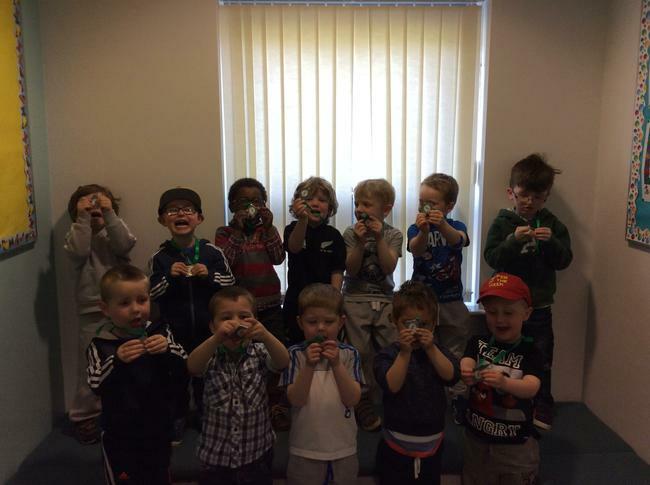 We enjoyed celebrating money week in Nursery just like some of our older brothers and sisters in the big school! 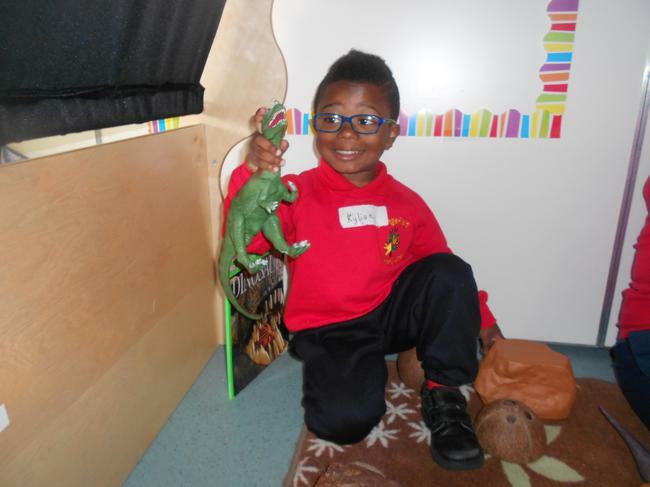 We read a story all about Little Croc, who found a purse full of money. 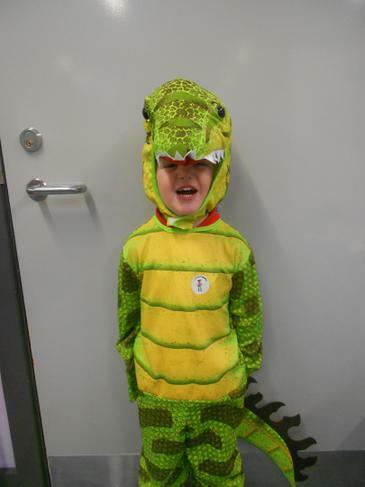 He was an honest Crocodile and didn't steal and his honesty really paid off! 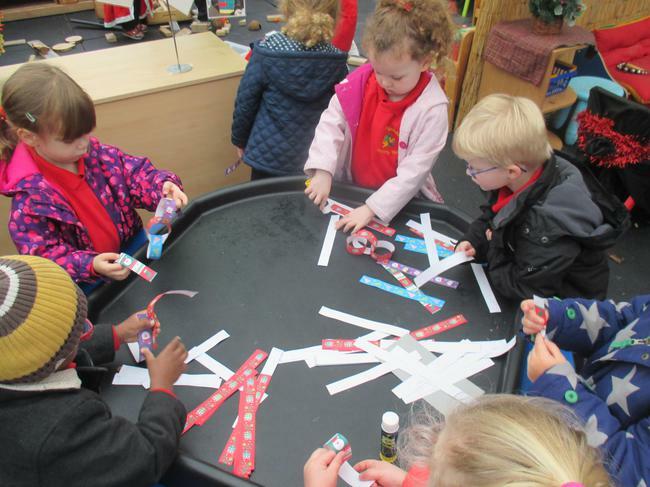 We had lots of interesting discussion about money, what it's used for, how to be sensible with it and what it means to give money to charity. 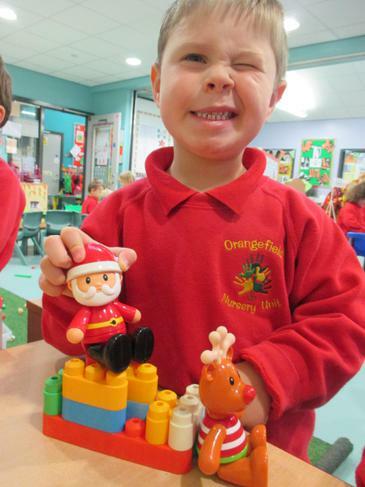 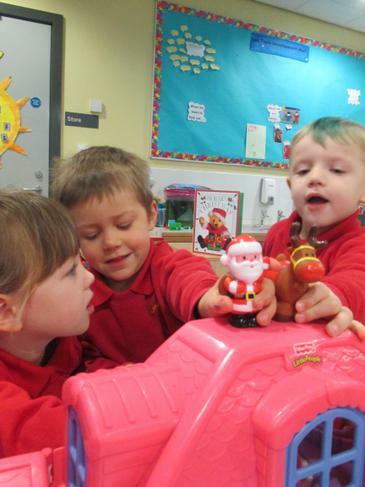 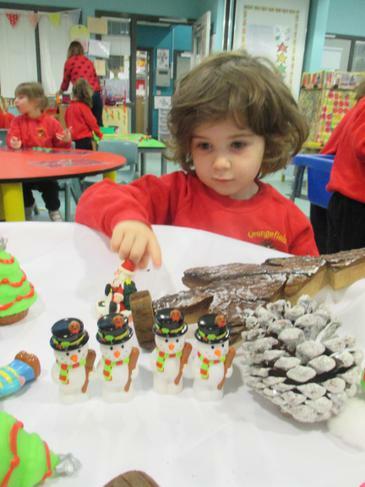 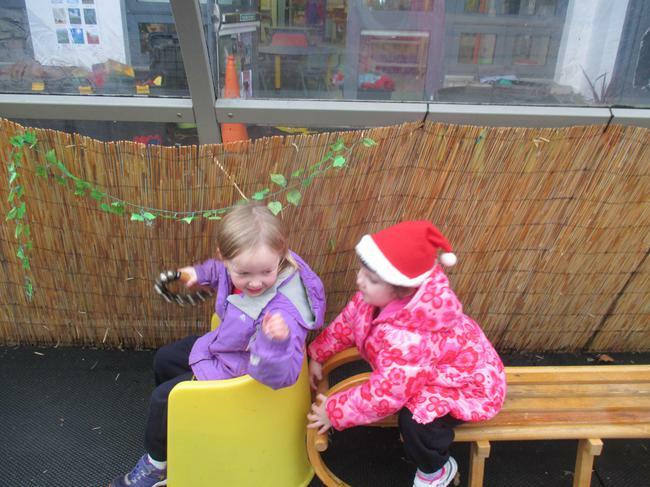 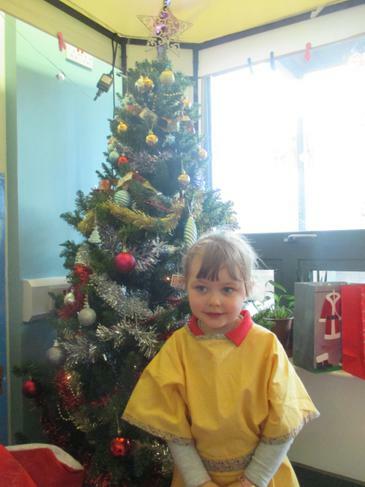 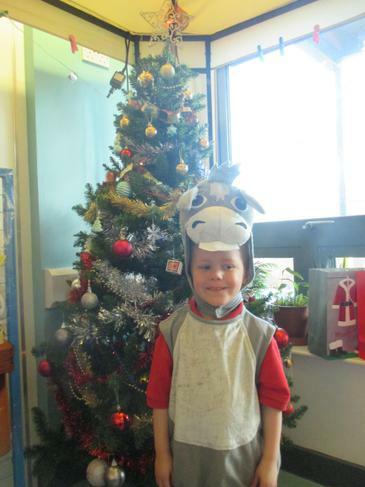 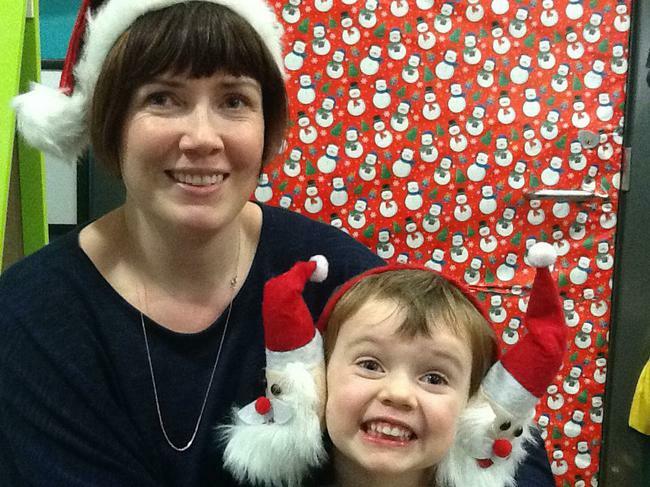 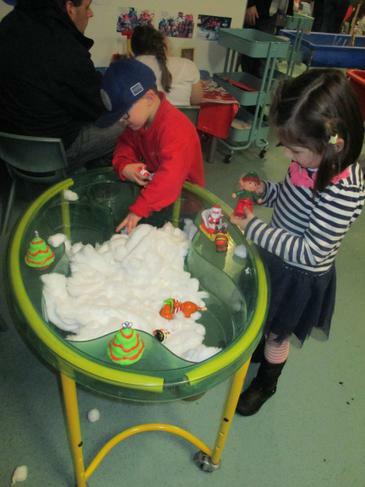 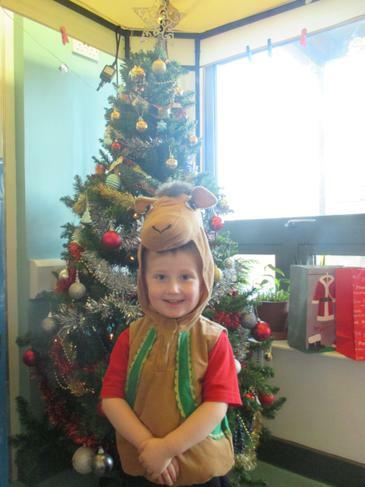 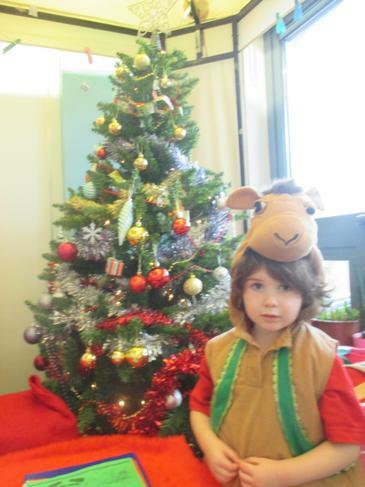 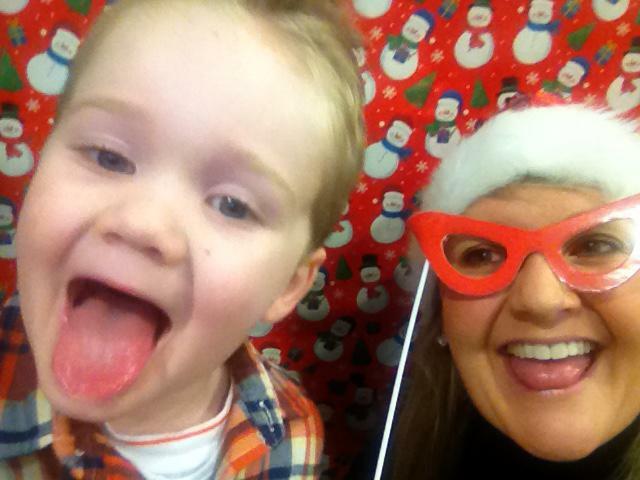 Christmas Fun in the Nursery! 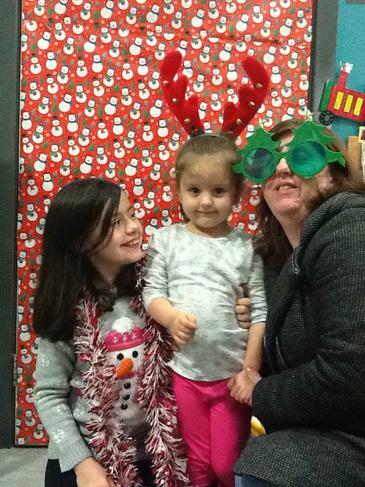 December has been such a fun month! 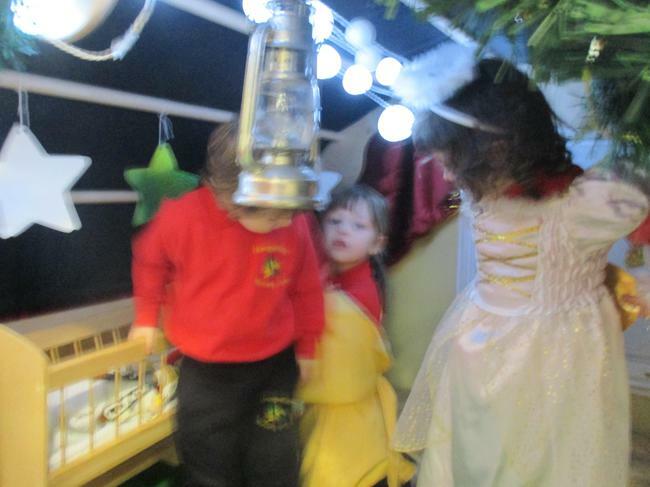 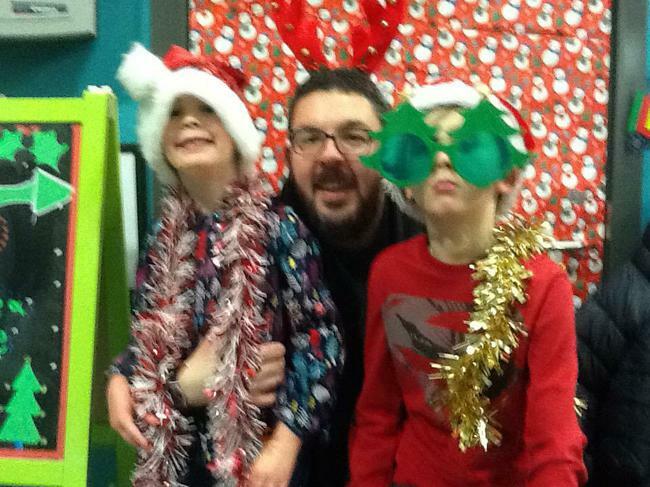 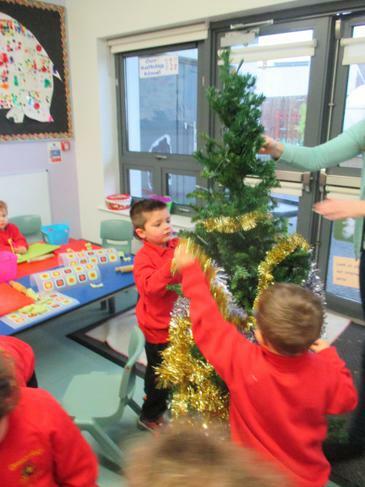 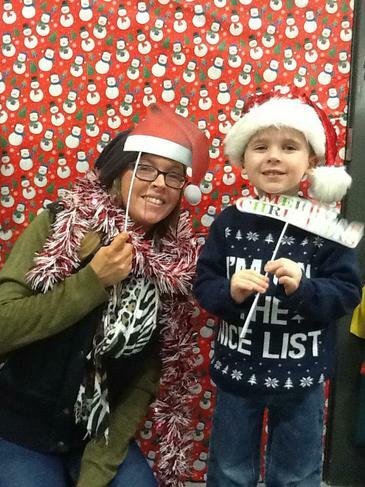 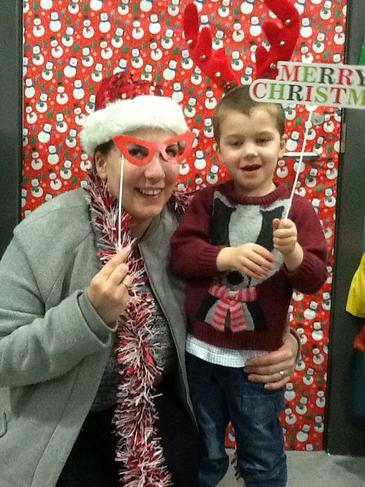 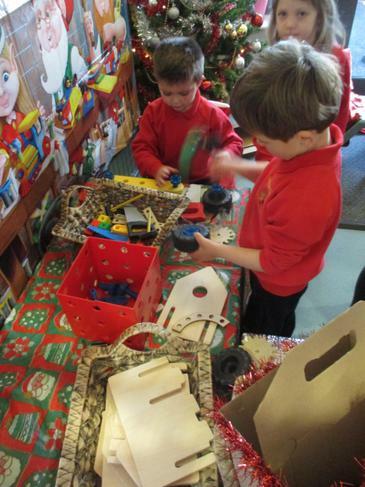 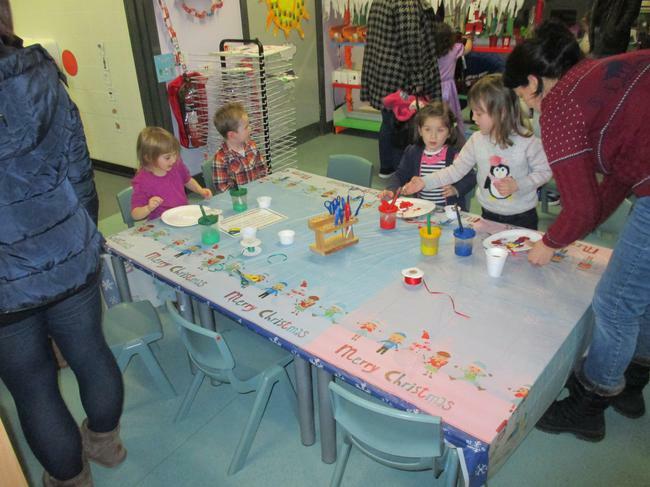 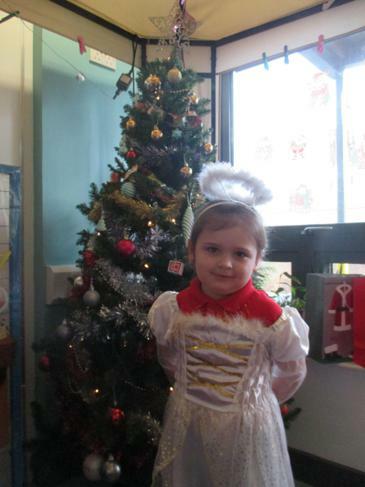 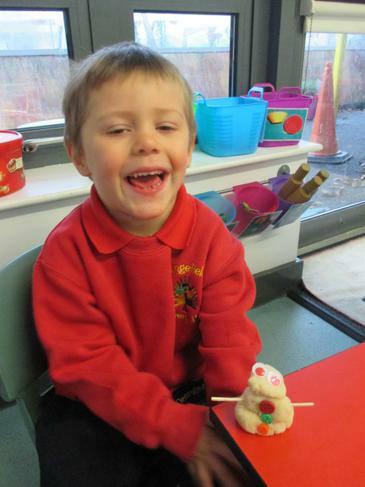 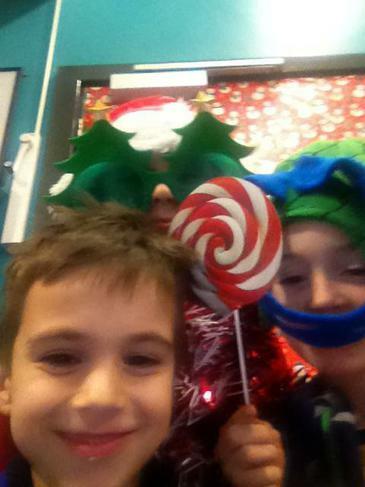 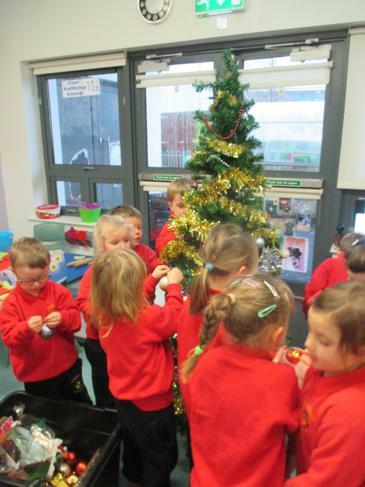 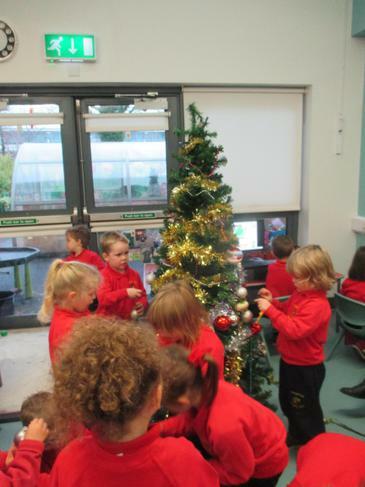 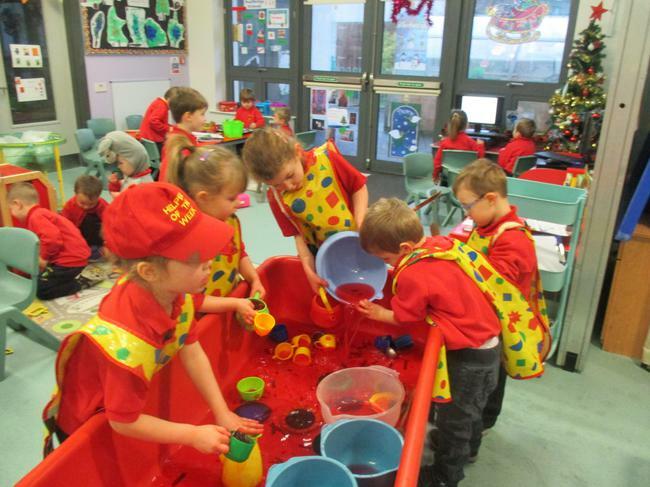 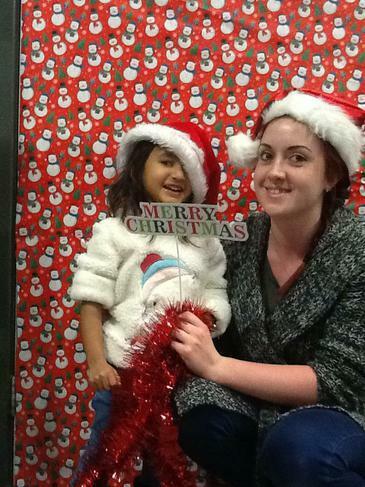 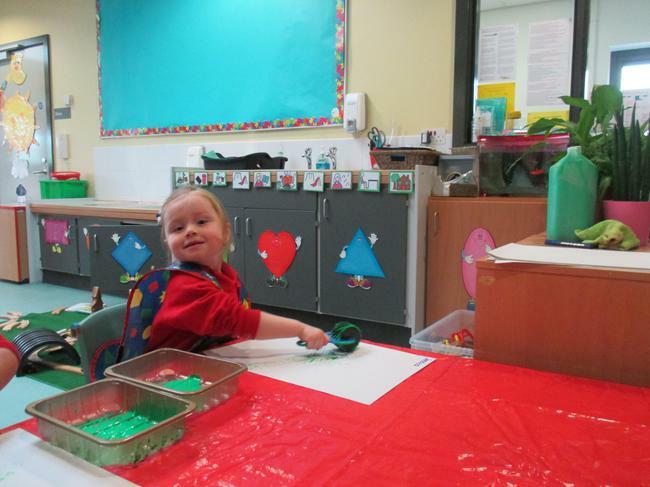 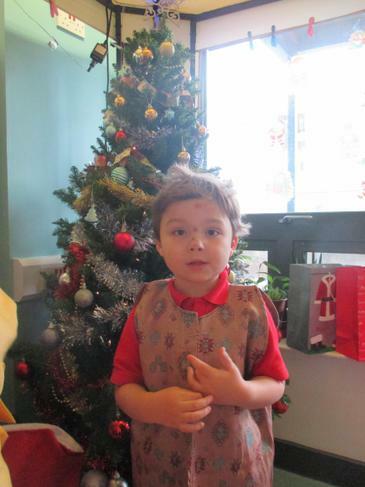 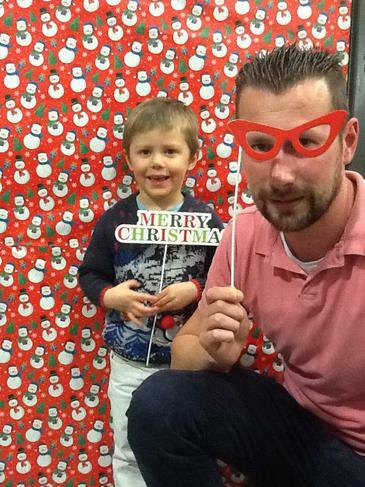 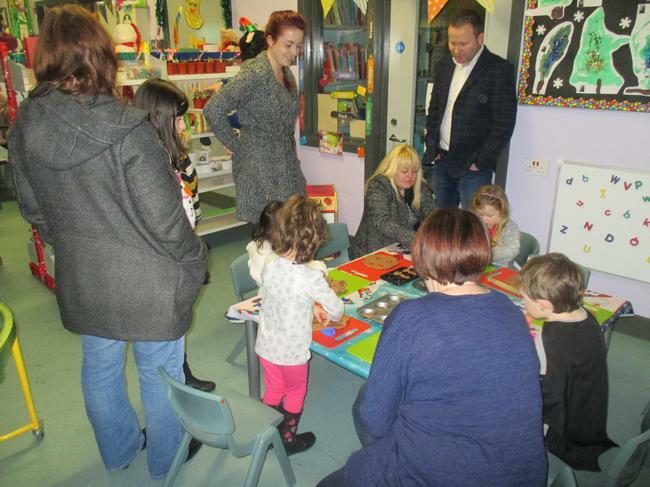 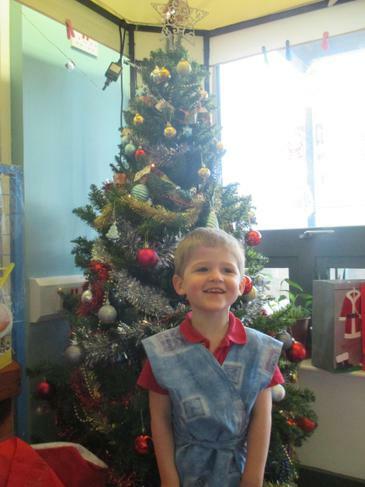 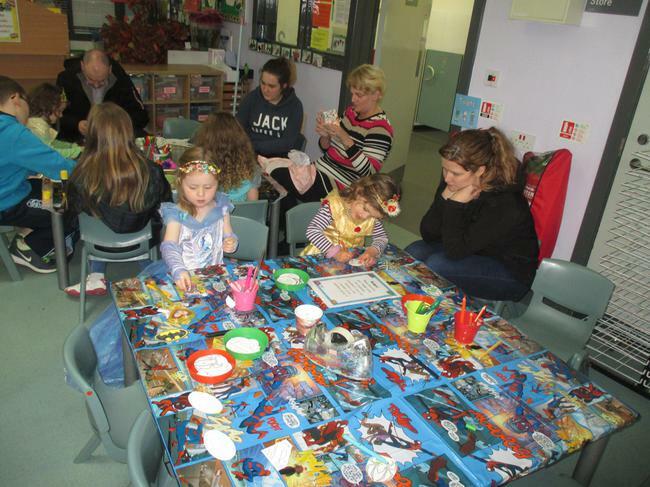 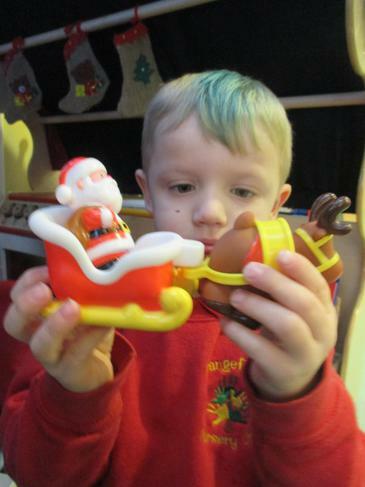 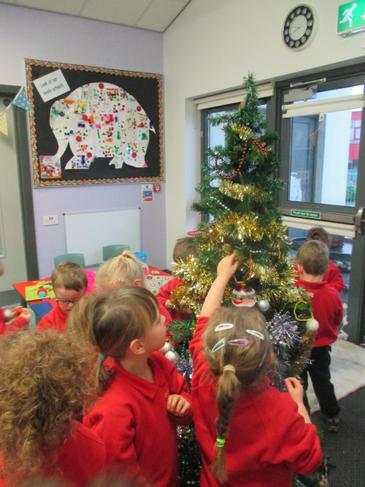 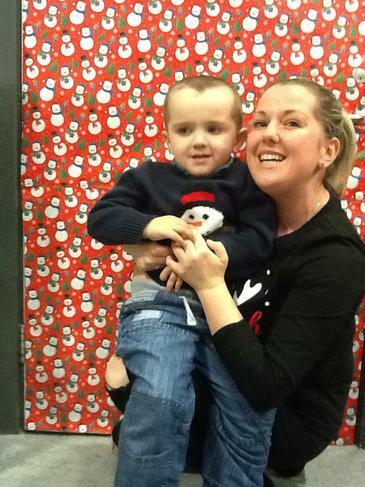 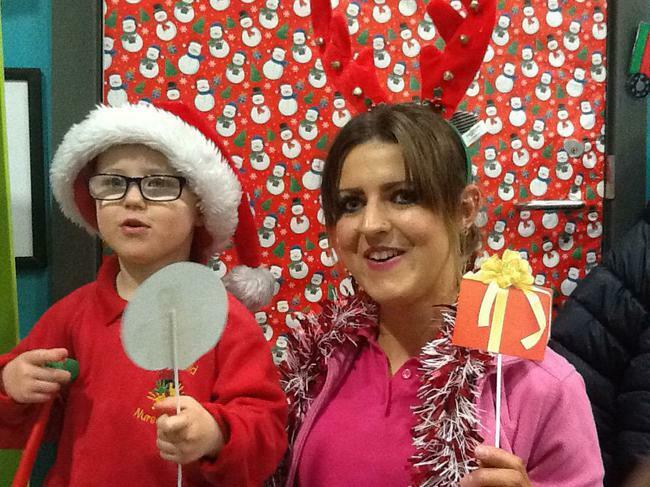 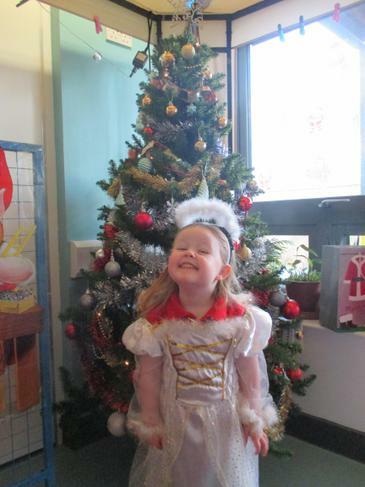 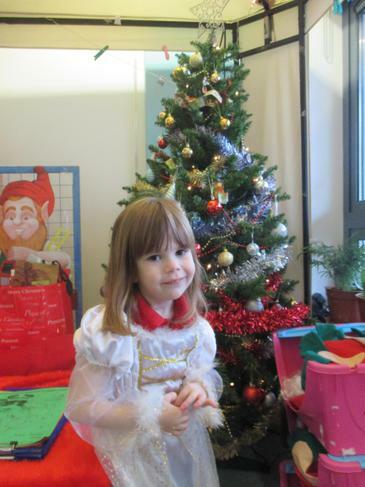 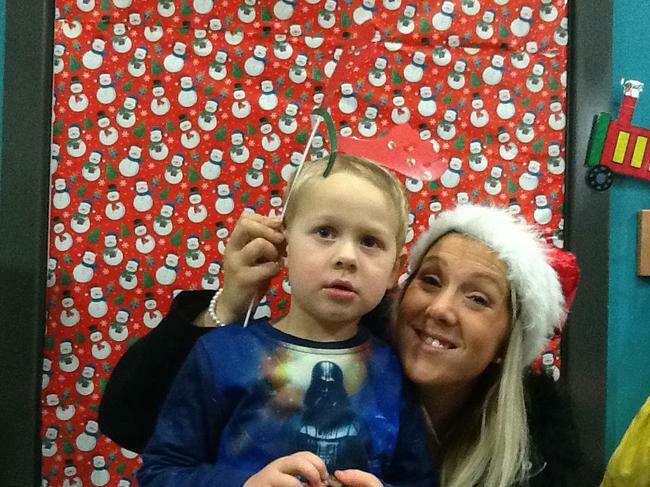 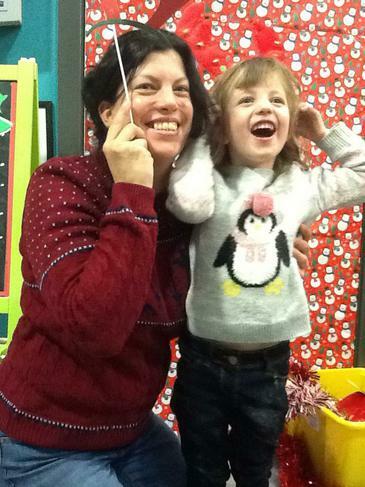 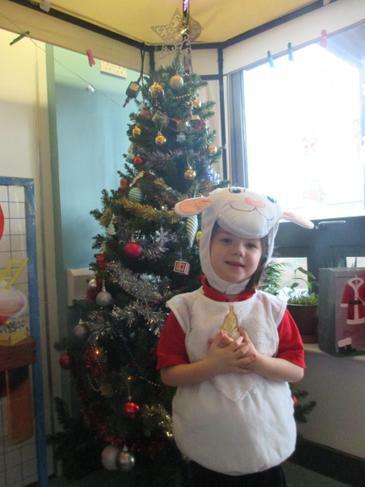 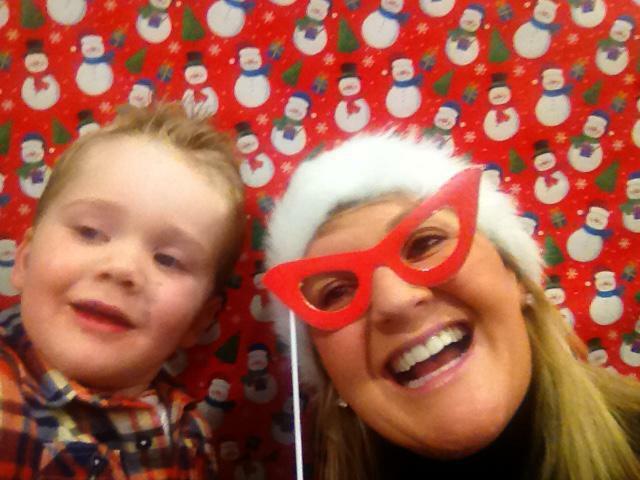 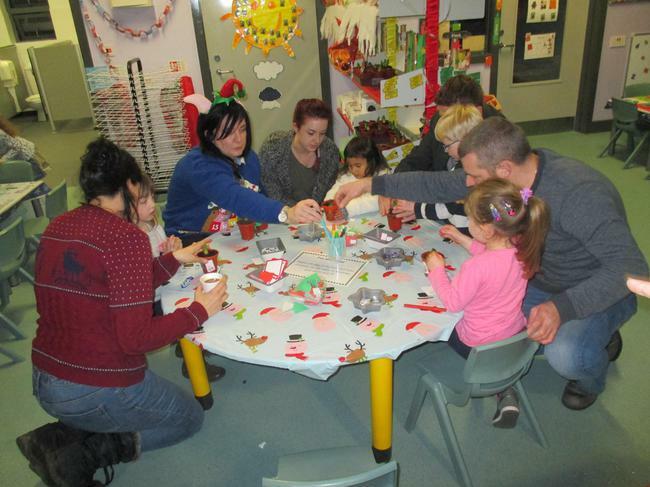 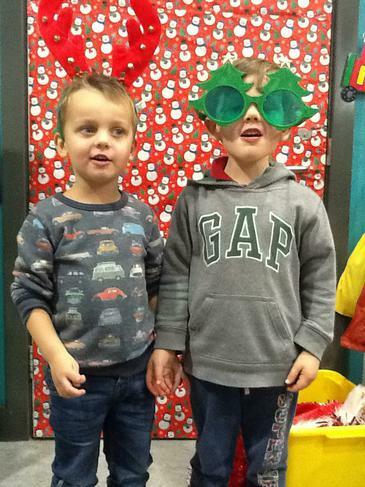 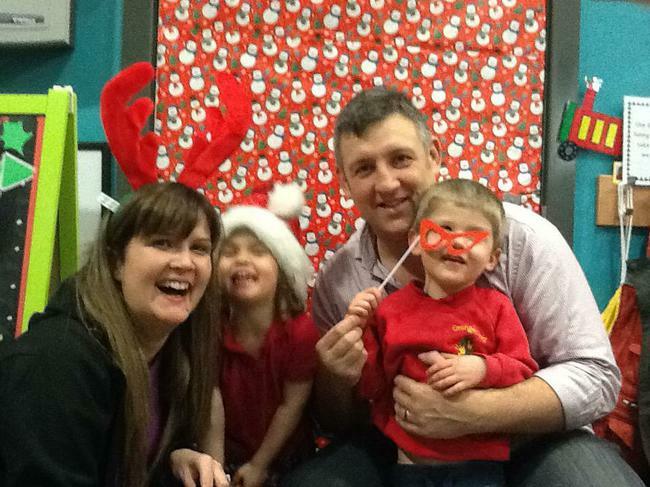 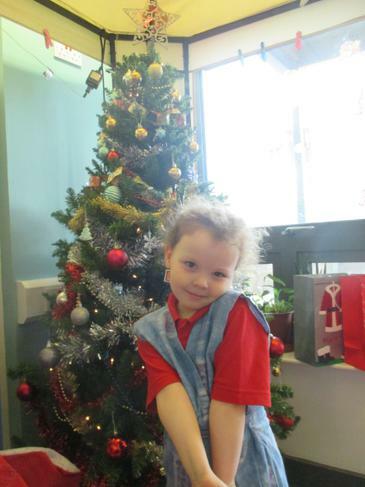 We got to decorate our Nursery, play with lots of Christmas toys and dance at our Christmas party! 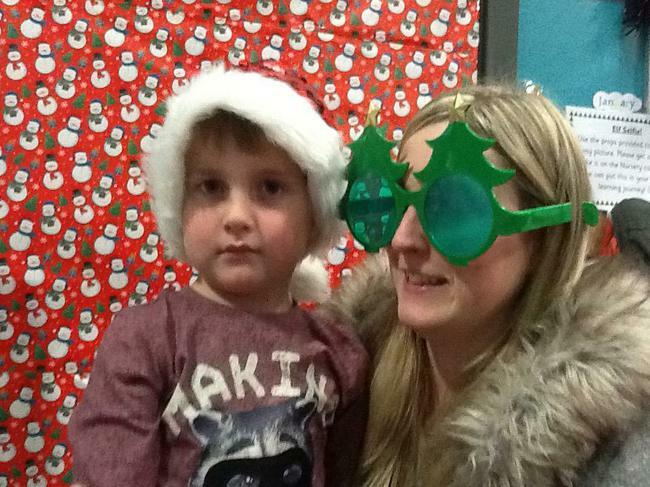 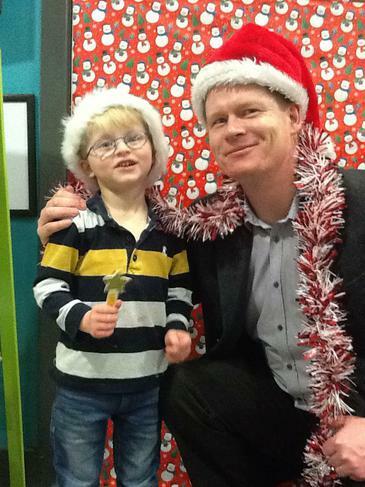 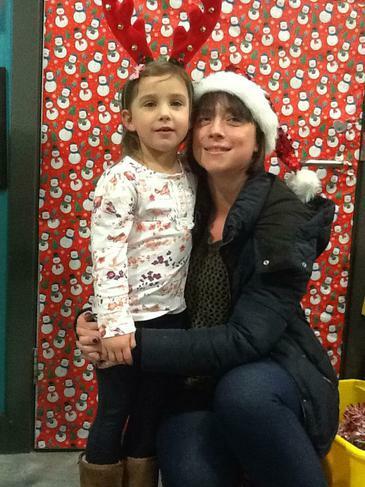 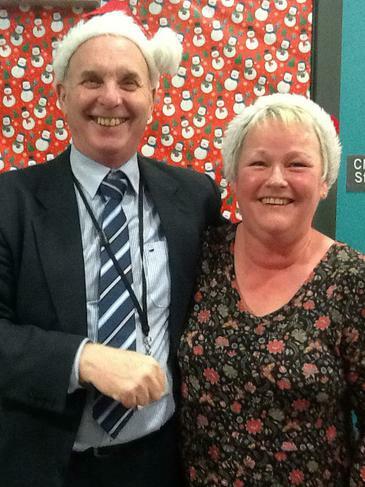 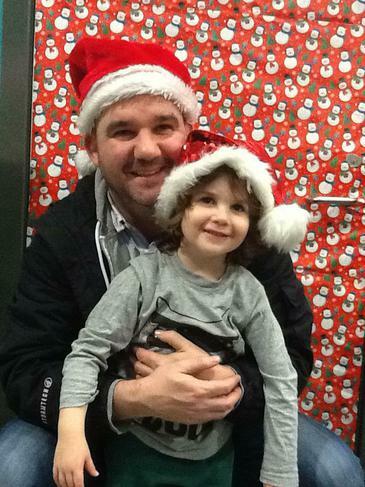 We had a lovely evening enjoying Christmas with our Mummy's, Daddy's and other members of our family. 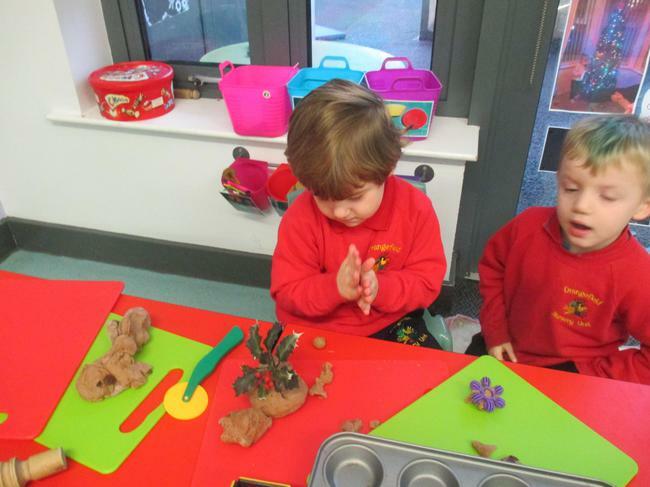 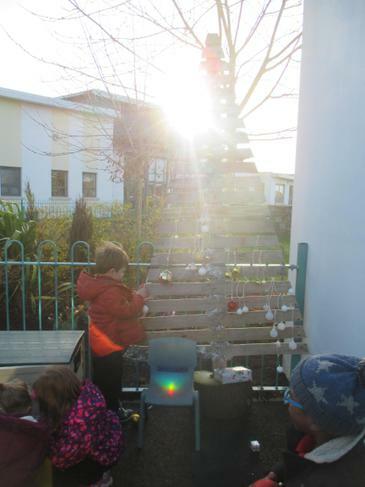 We loved showing them round our Nursery, making edible Christmas trees, Christmas decorations and decorating our hyacinth bulbs we have been looking after! 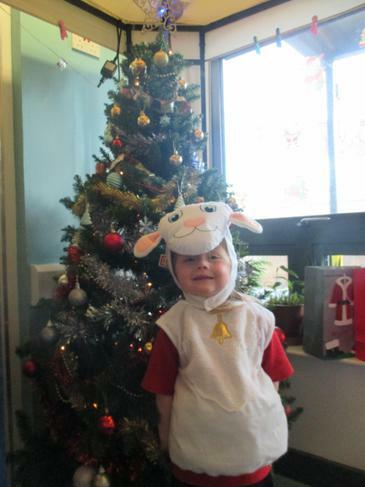 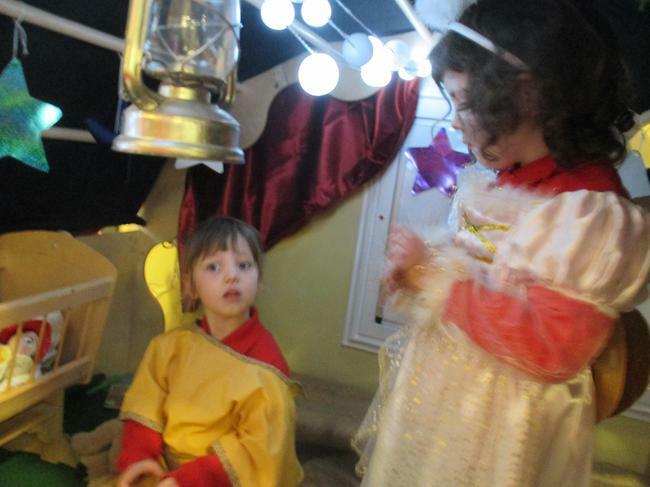 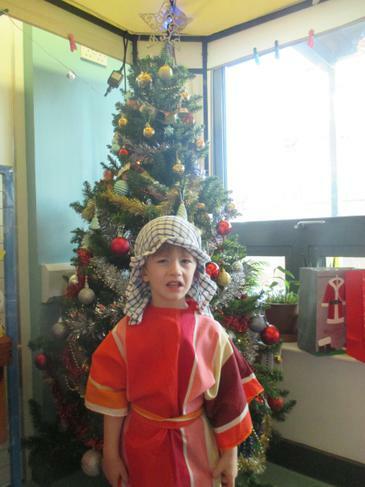 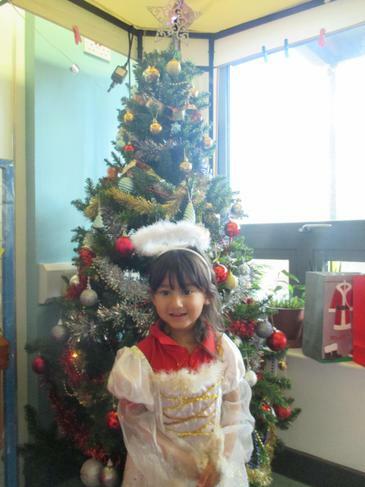 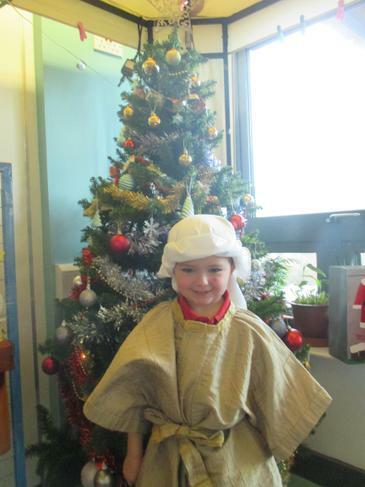 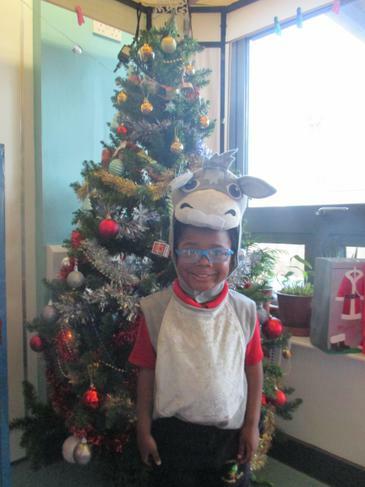 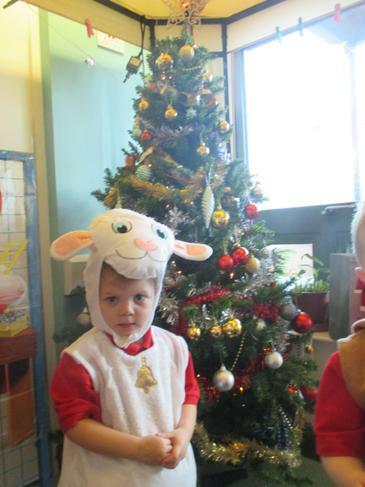 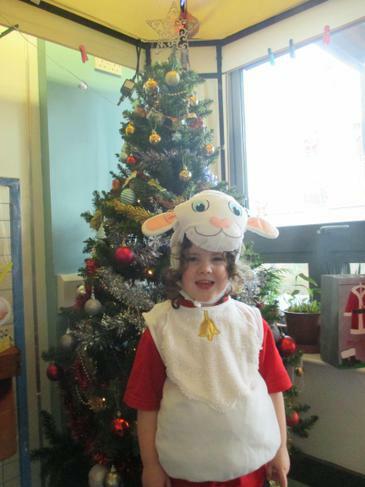 Our Nativity day finally arrived and we had a ball! 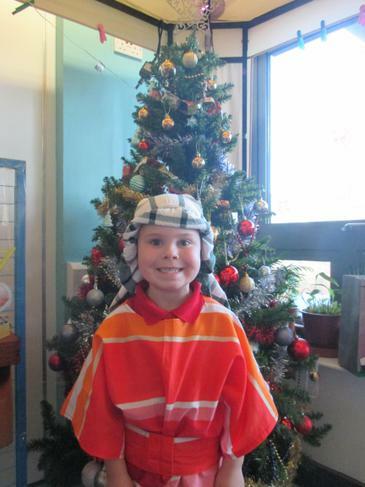 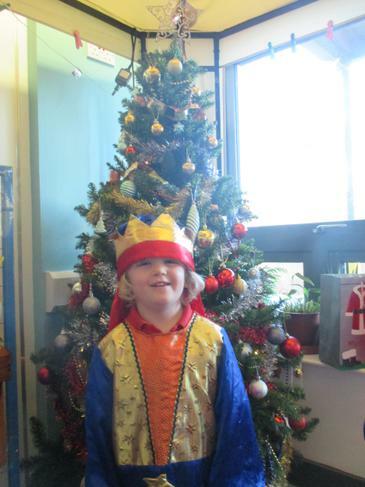 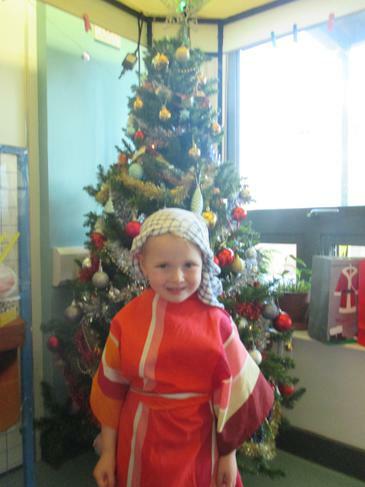 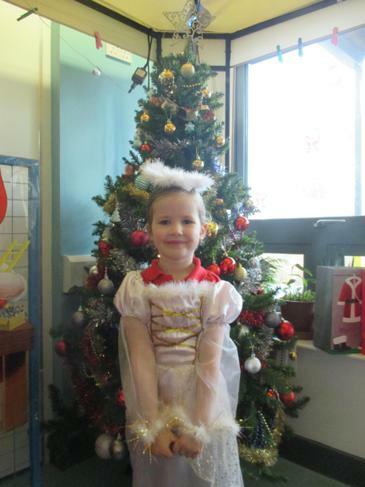 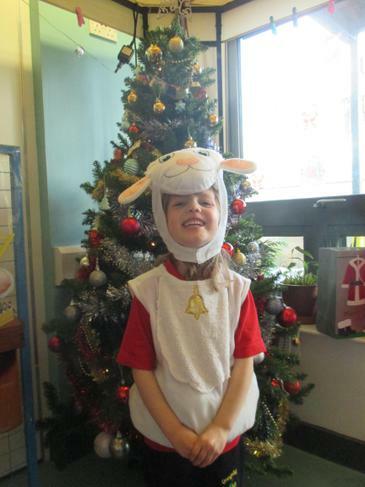 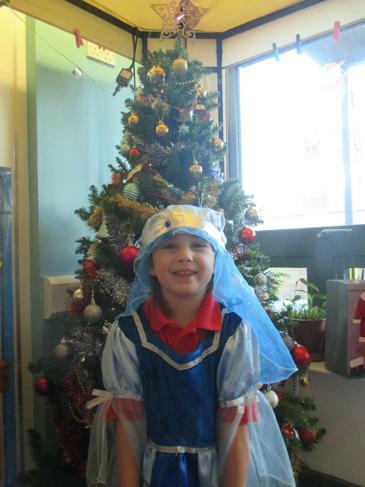 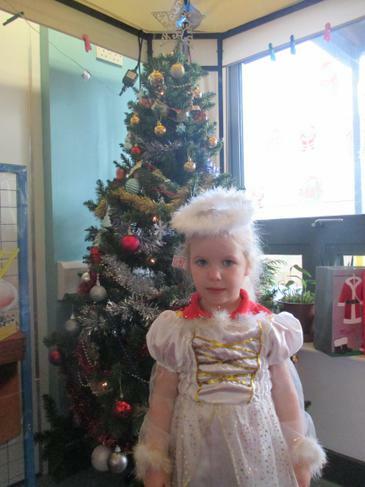 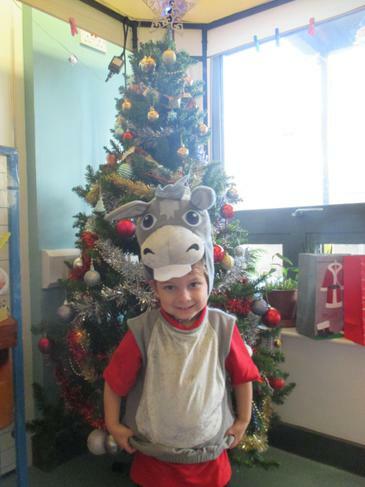 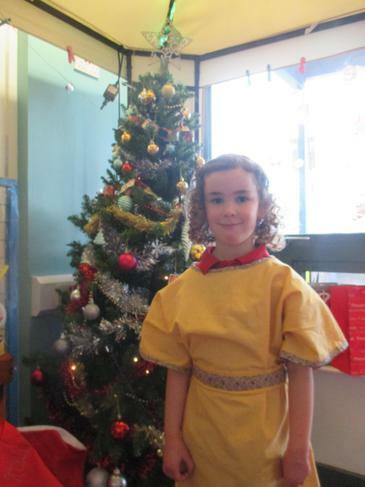 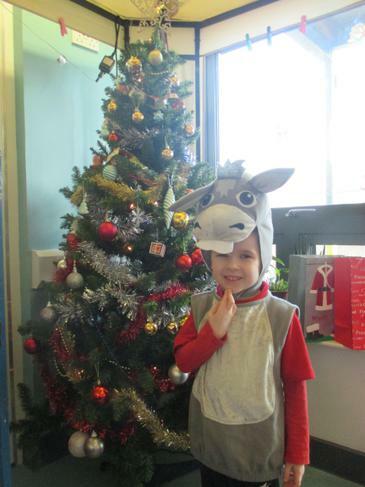 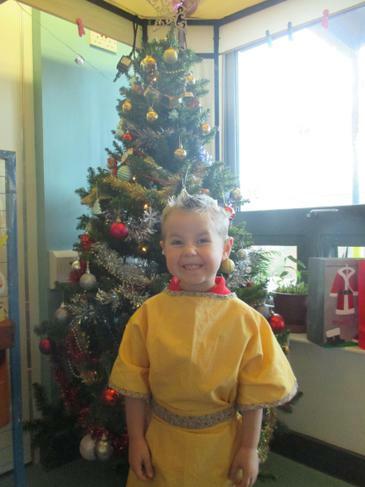 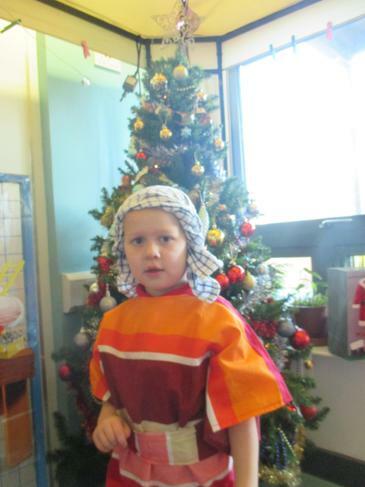 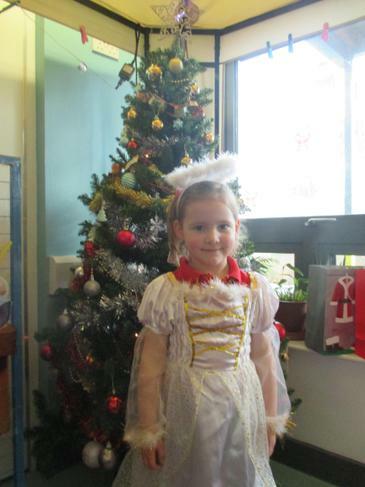 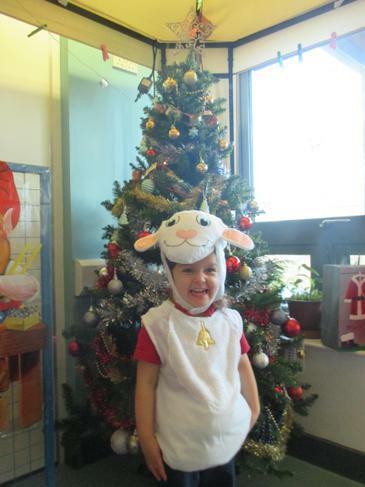 We loved wearing our costumes, singing songs and telling the Christmas story to our friends and family. 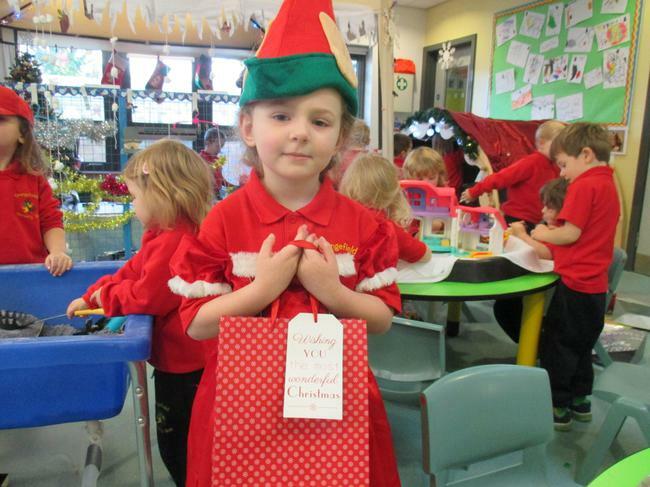 Our teacher's said we were fantastic and both them and our grown ups were very proud of us! 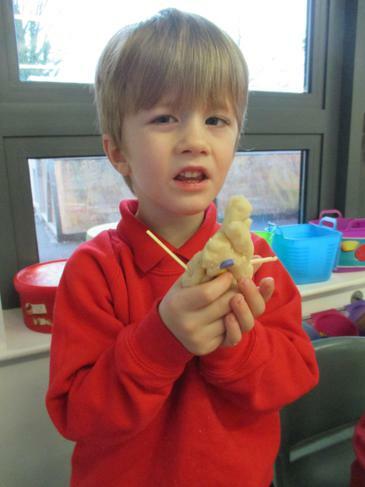 We have had a great time learning about different animals and where they live this month. 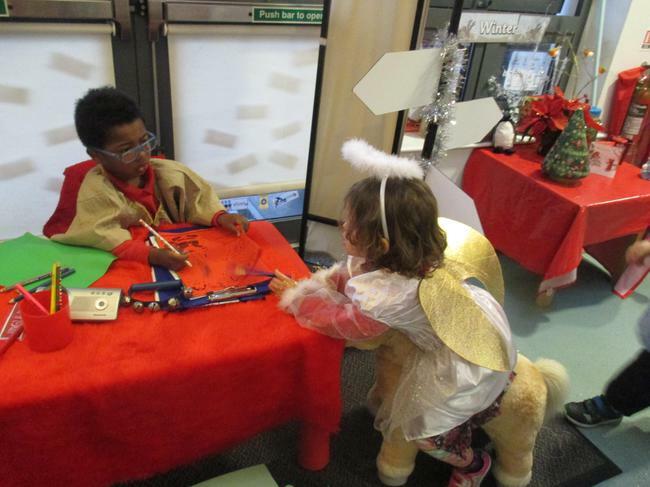 We read lots of animal stoiries, built homes for the animals and had a go at making the animals better in our role play vet surgery! 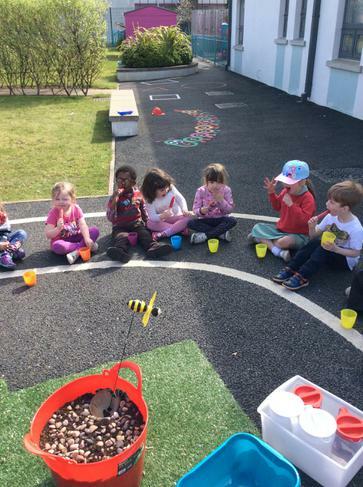 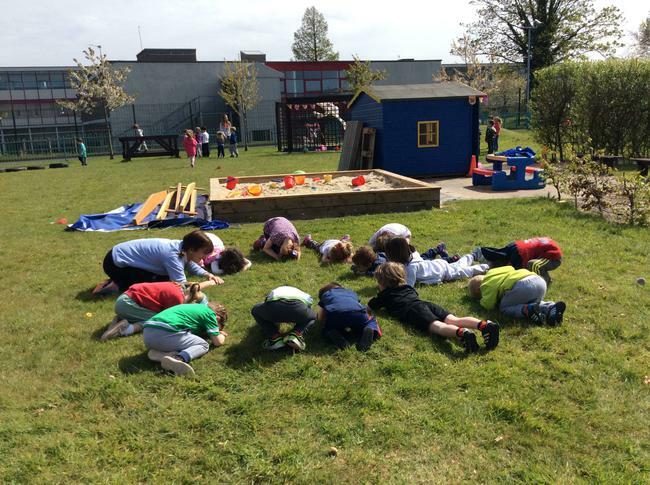 We also loved our visit from Belfast zoo. 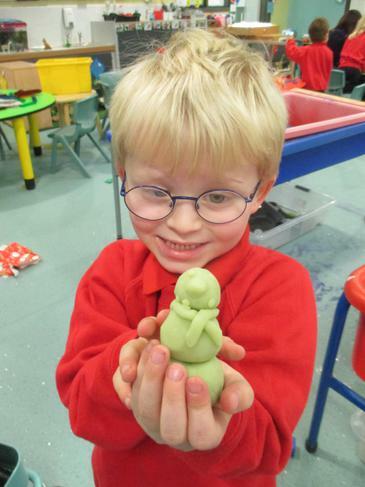 Take a look at some of the cool things we have got up to! 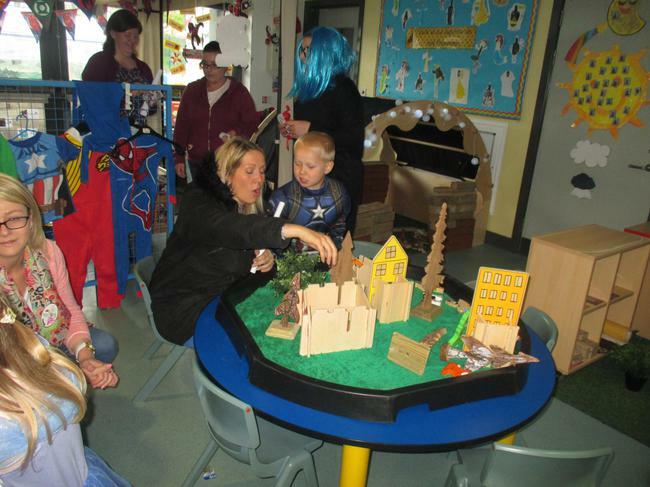 We had great fun raising money for Children in Need. 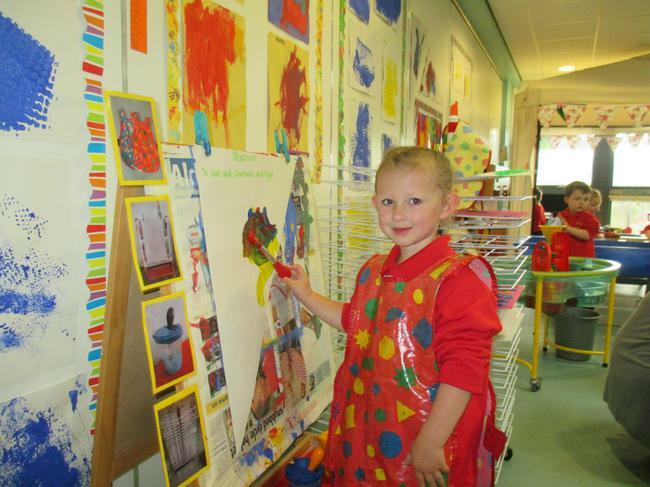 We all enjoyed wearing our own clothes, spots and Pudsey gear! 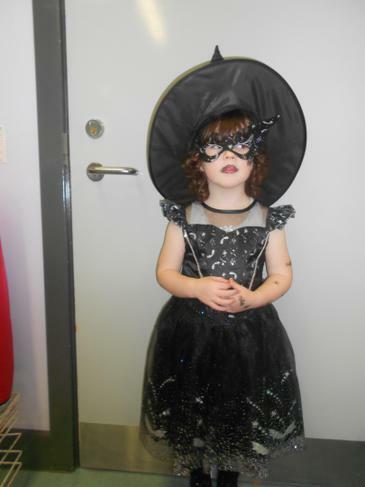 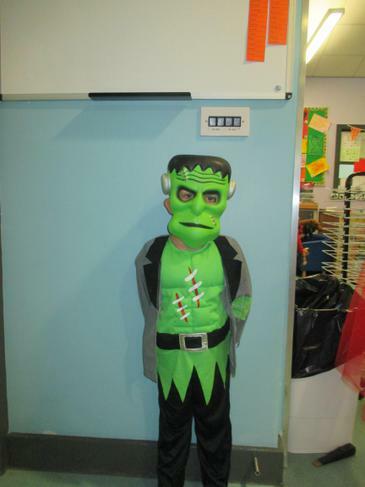 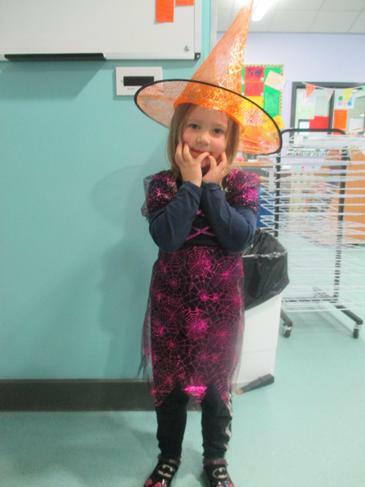 We have had a fab Friday celebrating Halloween! 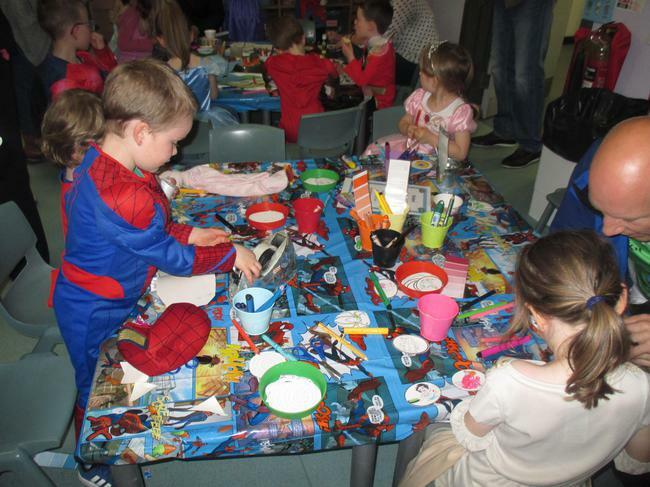 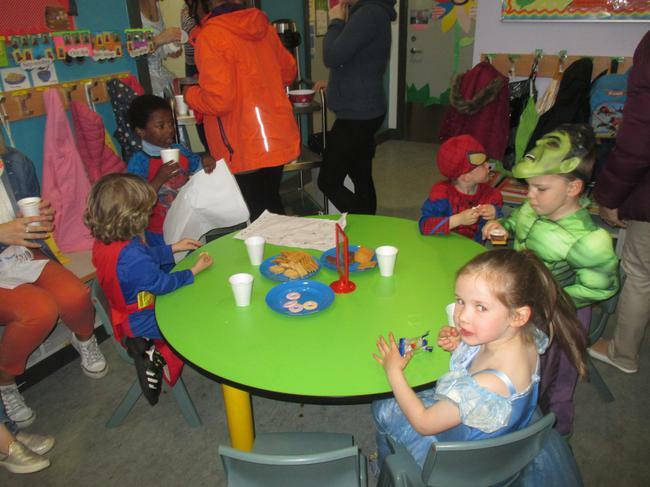 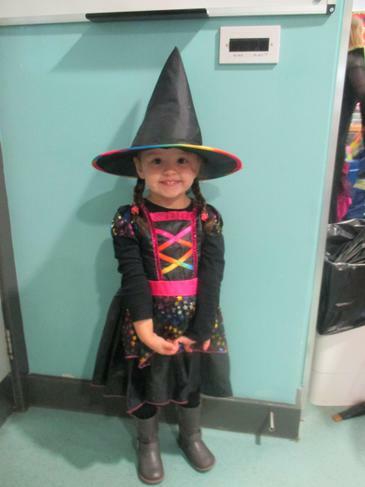 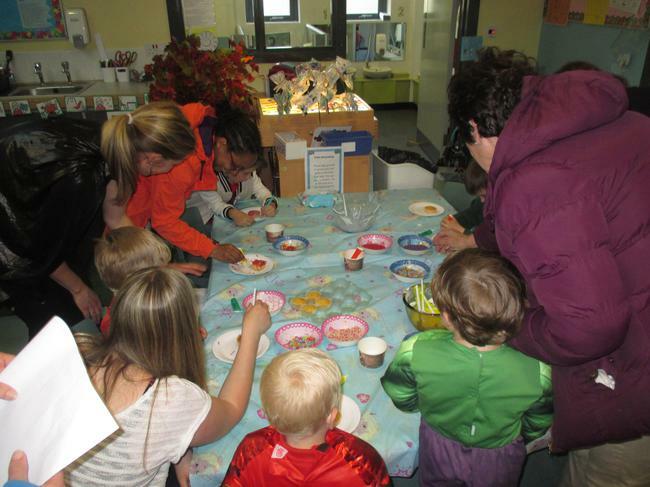 We all got to dress up and enjoy lots of Halloween themed activities! 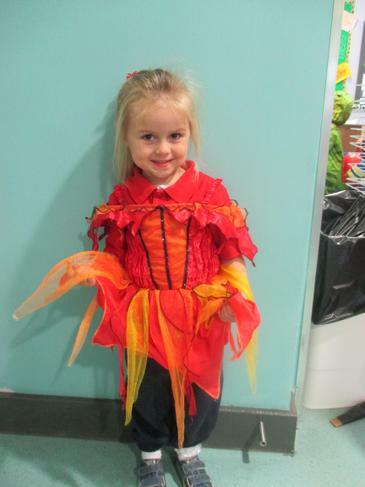 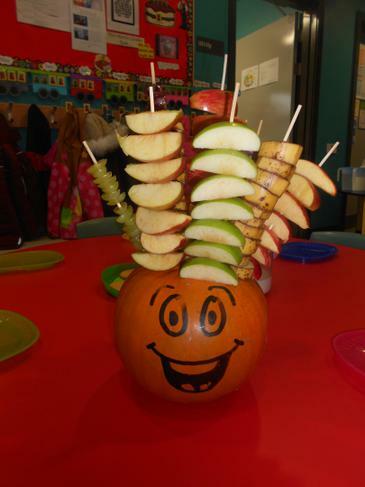 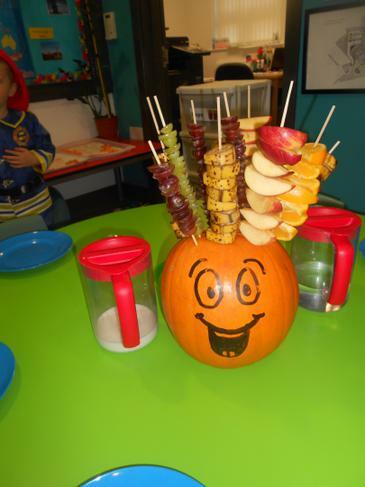 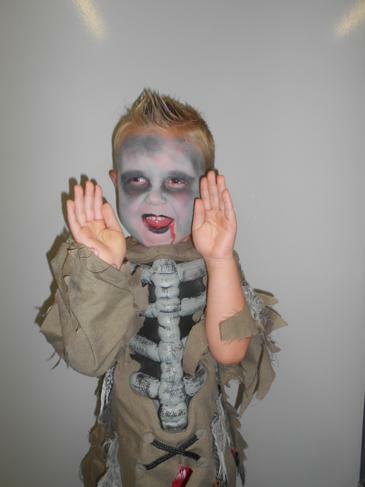 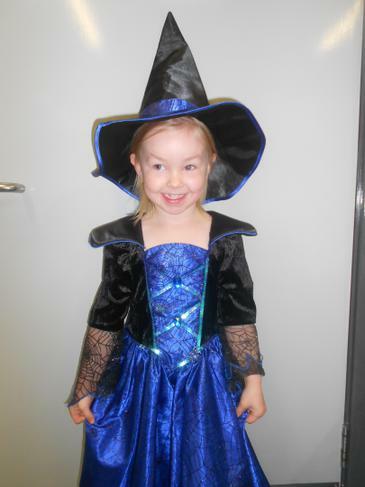 We wish all our friends at Nursery a happy Halloween break! 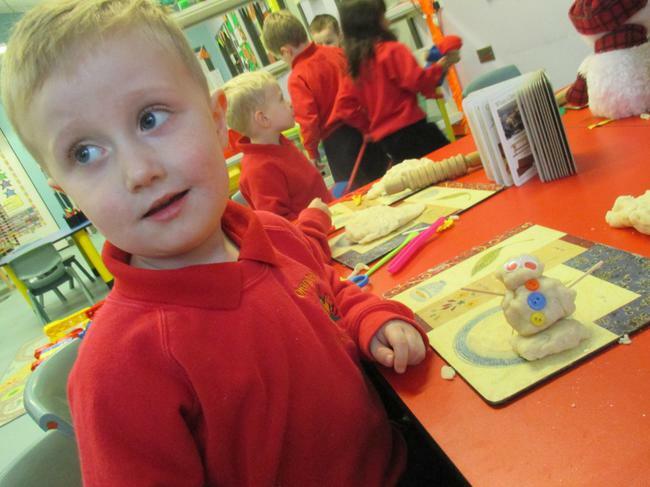 We have enjoyed our space topic this month and have learnt lots of new things. 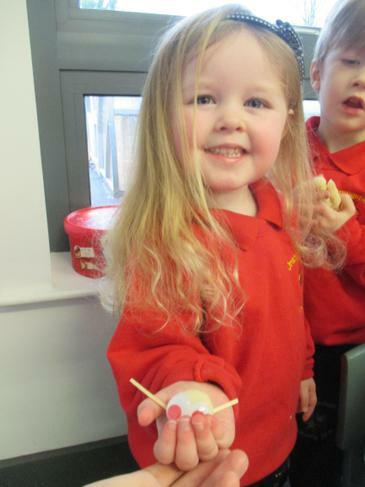 We have made planets, visited the moon and even got to eat rocket ice lollies! 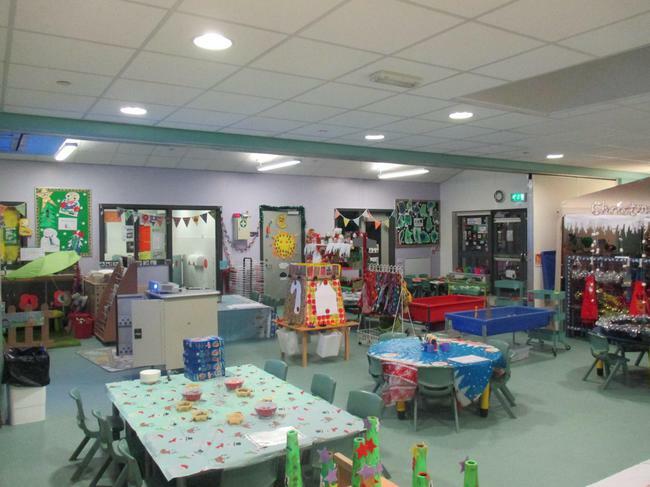 Take a look at the pictures below to see some of our clever work! 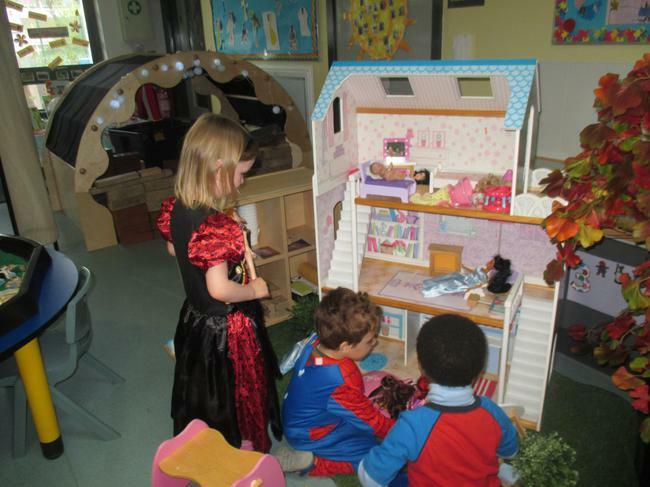 Some of the Toy Story characters have come to visit our Nursery! 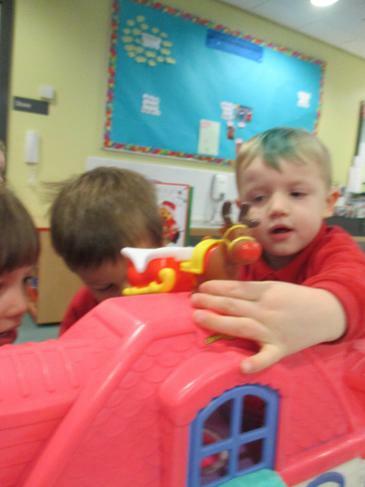 Buzz is looking out for children who 'Have a go,' Woody is watching for boys and girls that can 'work together,' and Jessie is on the look out for 'problem solvers!' 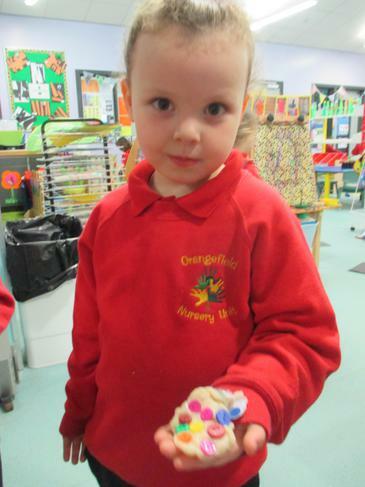 They will reward children that demonstrate these skills with one of their special stickers. 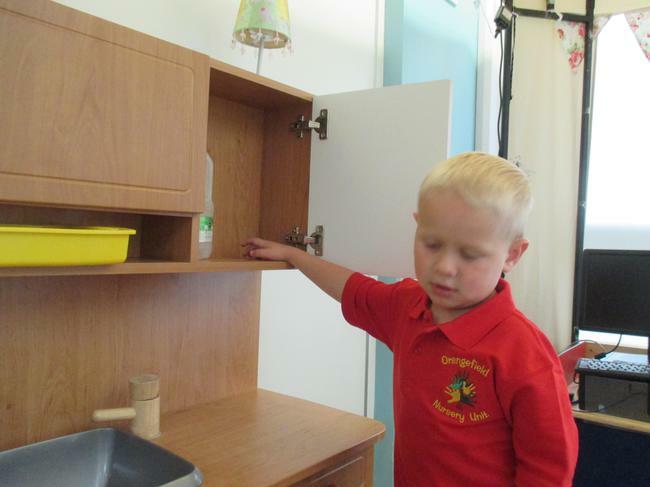 We hope this will promote personal capabilities within our Nursery. 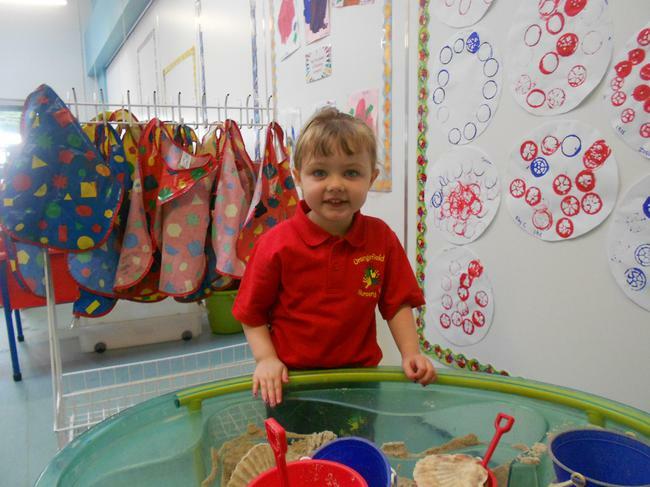 First few days at Nursery! 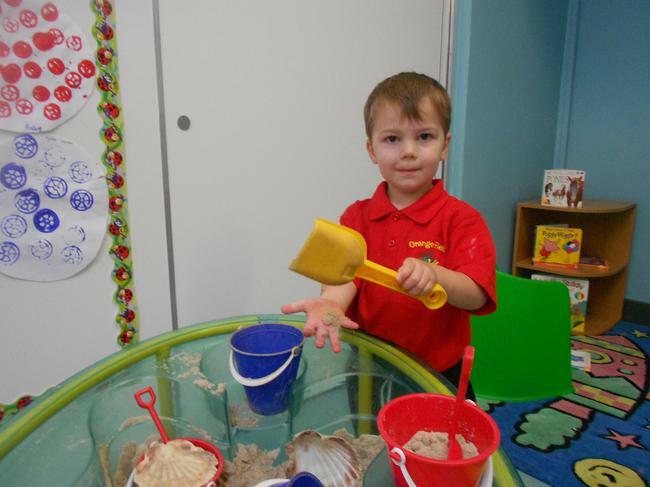 What a busy few weeks it has been in Nursery! 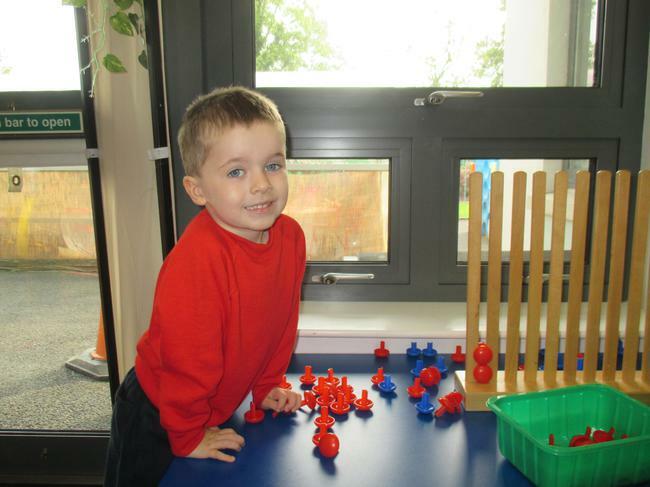 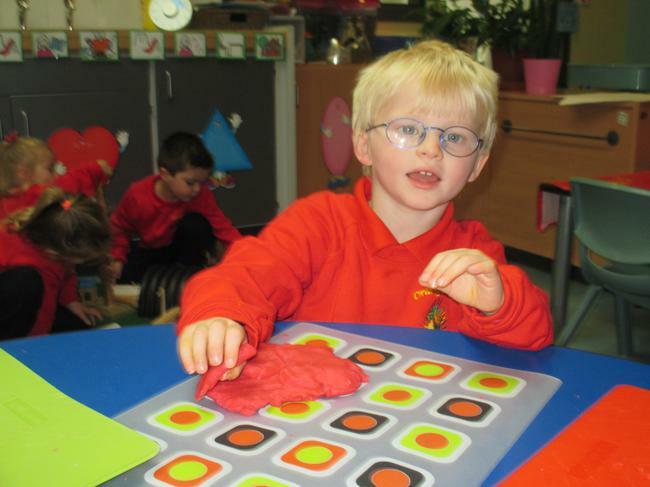 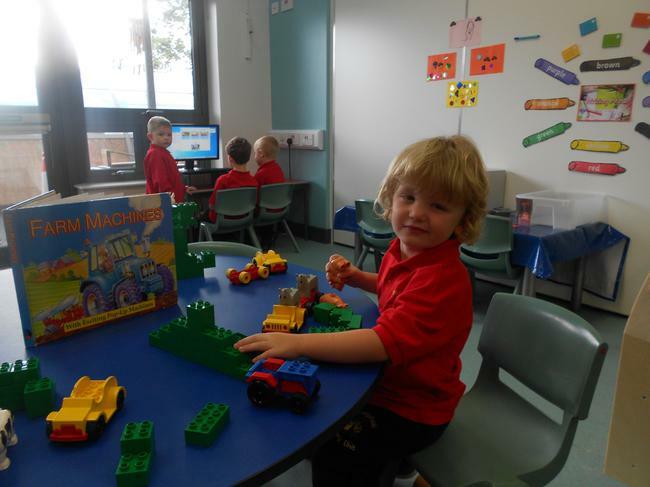 We have had lots of fun meeting our teachers, making new friends and playing with lots of new and exiting toys. 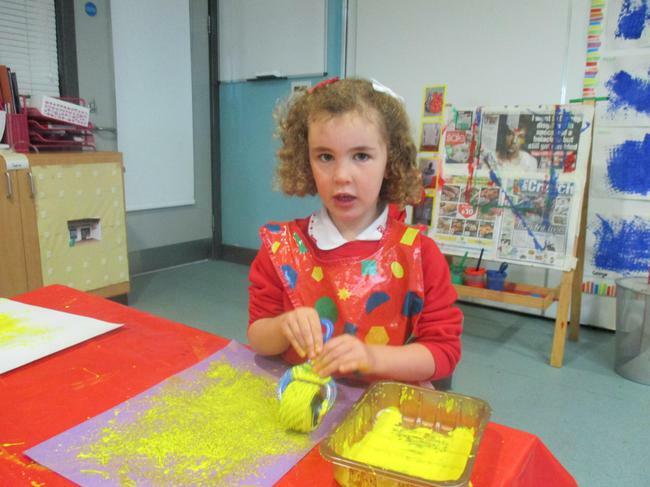 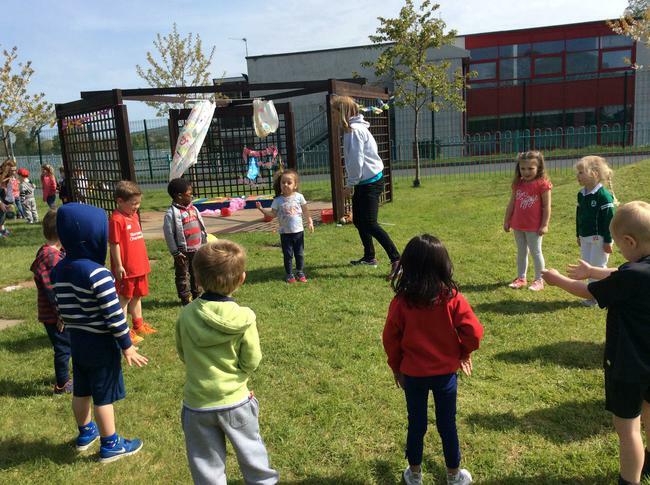 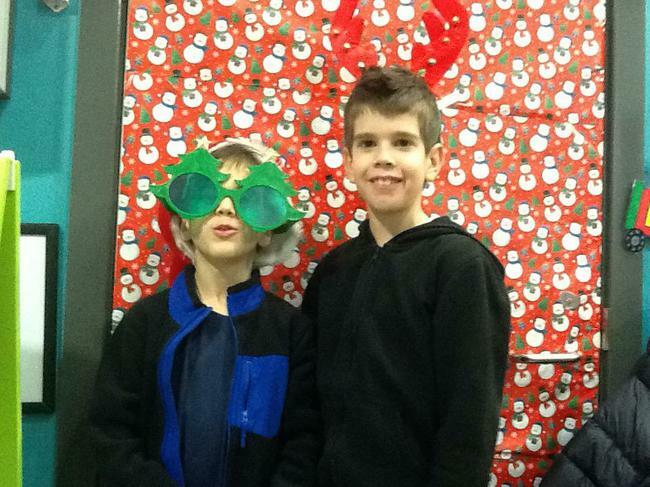 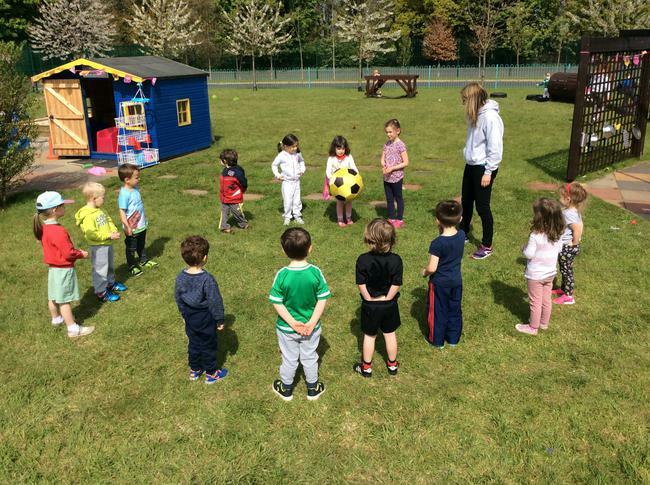 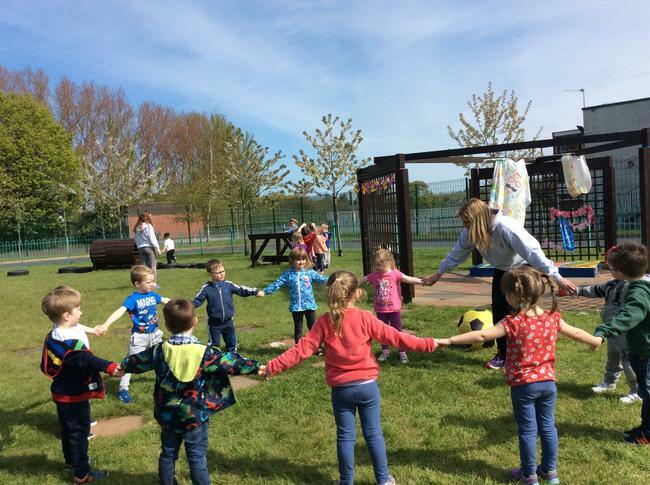 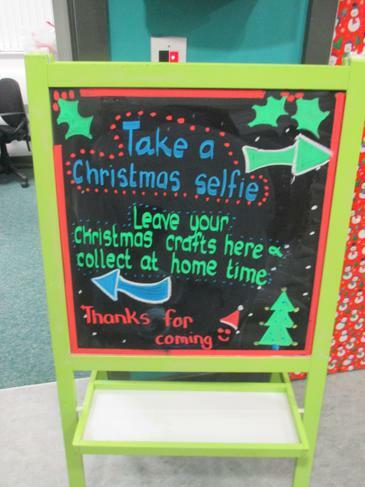 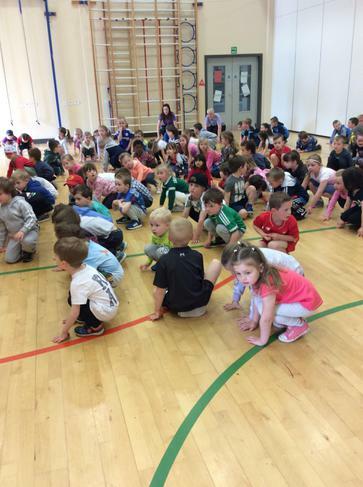 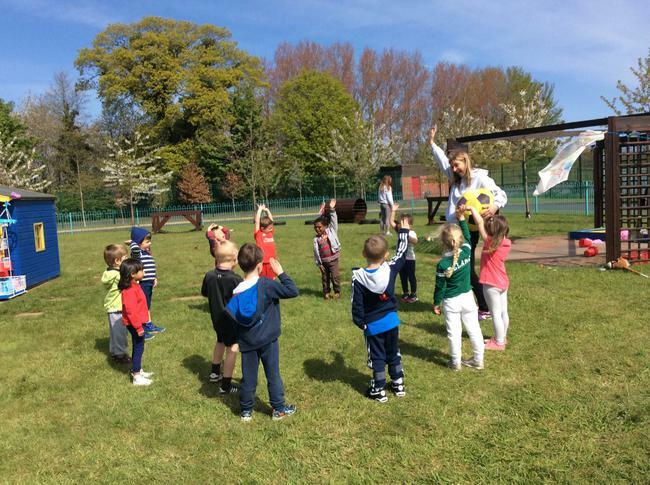 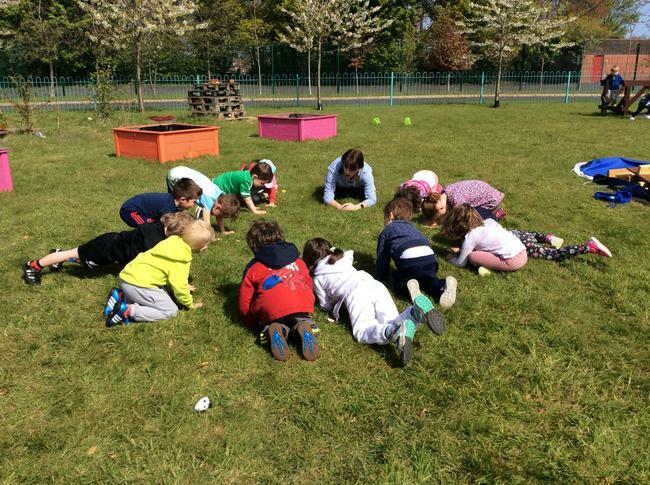 Have a look at our pictures to see some of the fun we've got up to in our first few days!